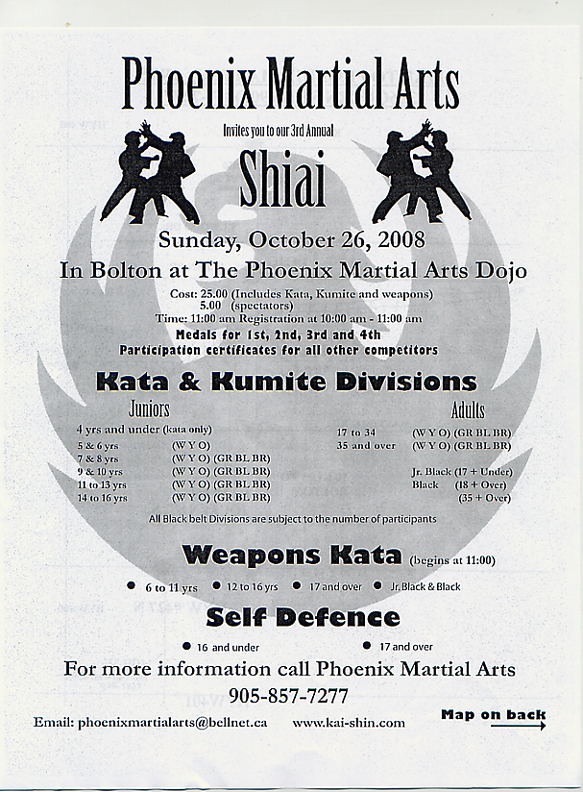 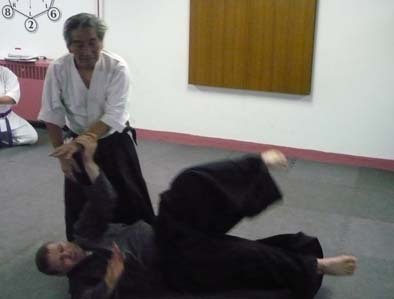 Shihan Forrester always insisted on a high standard. 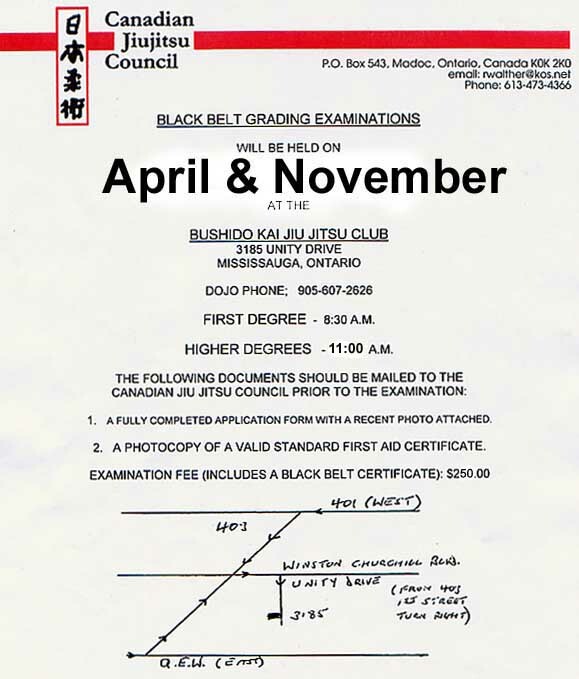 The members of the CJC Grading Board are committed to continuing that standard. 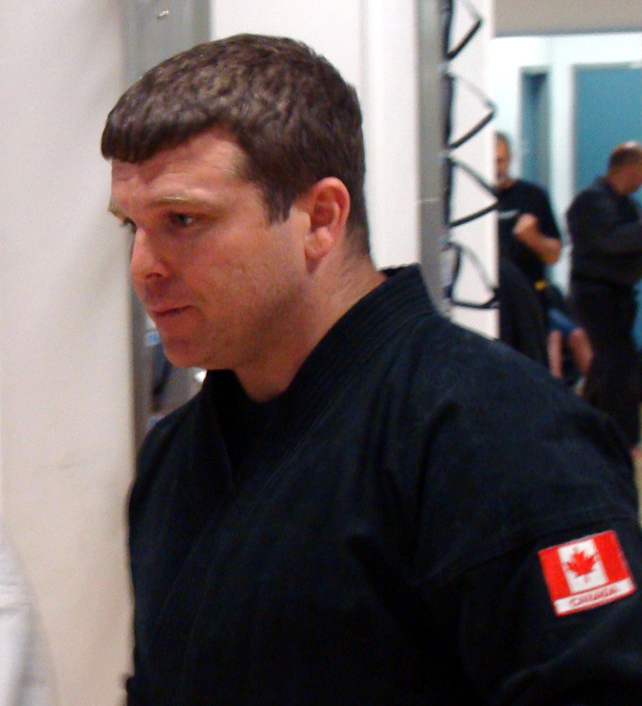 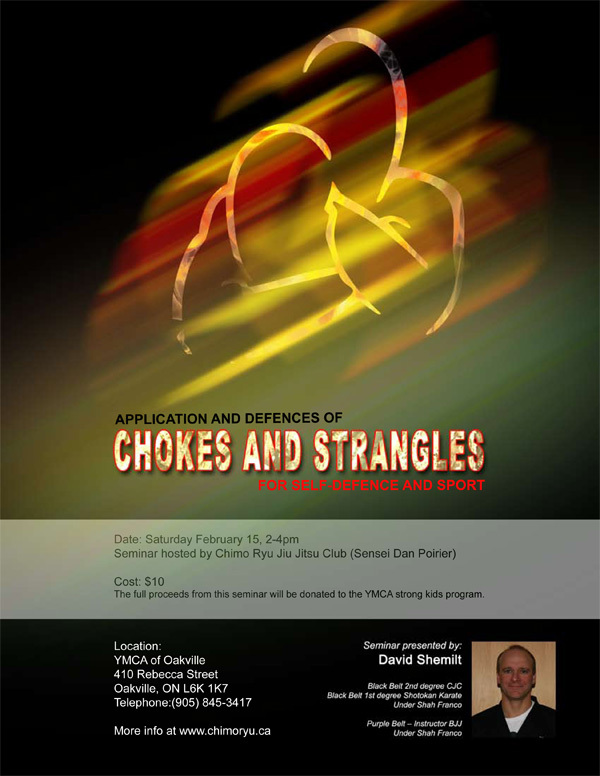 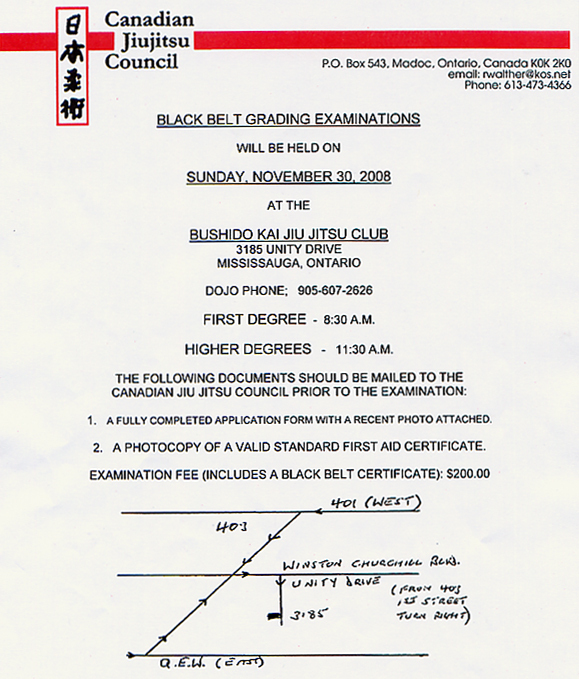 Jiu Jitsu within the CJC will not be weakened or diluted. 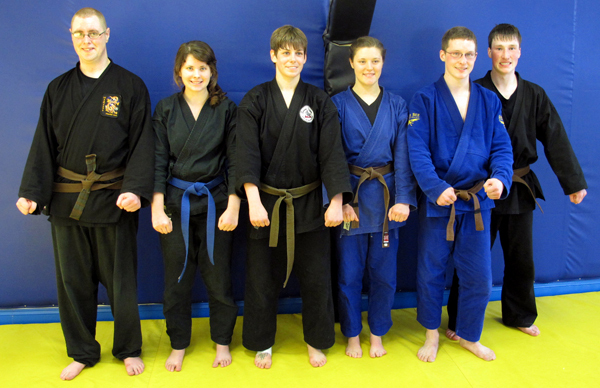 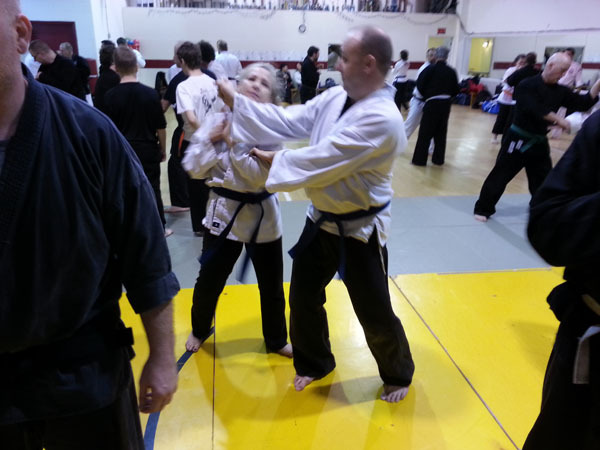 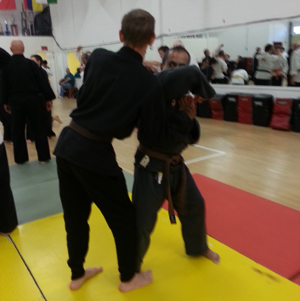 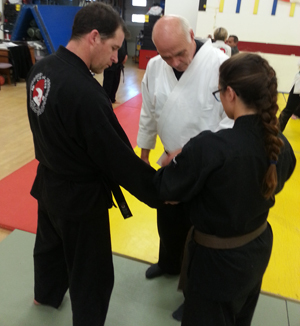 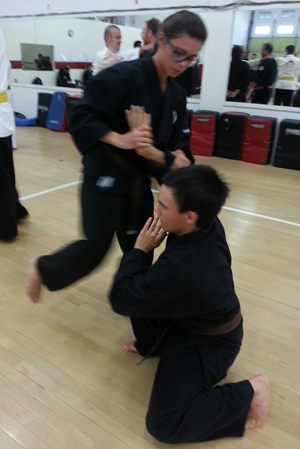 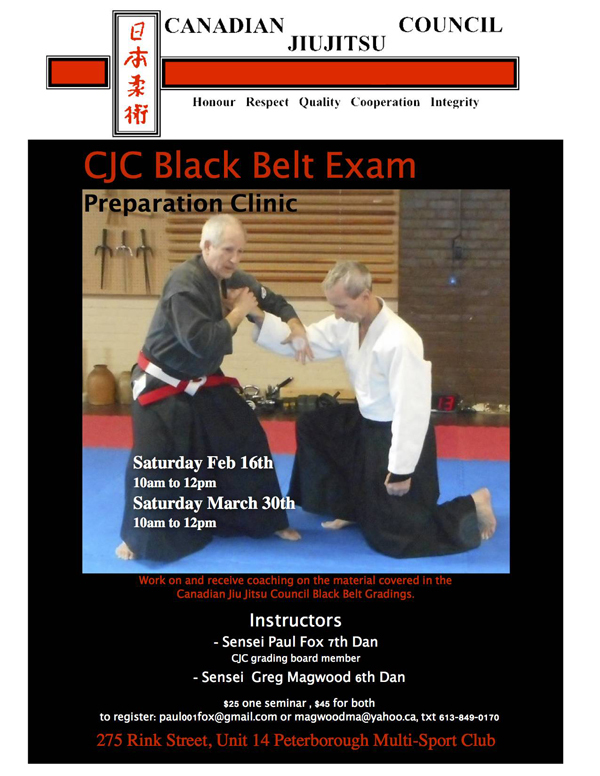 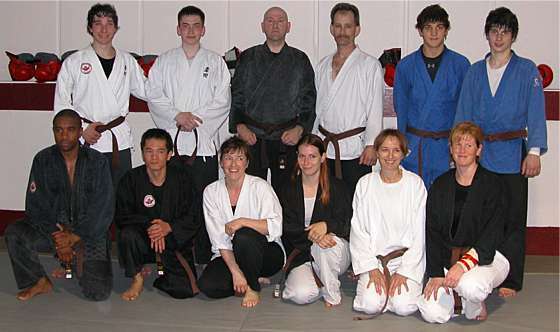 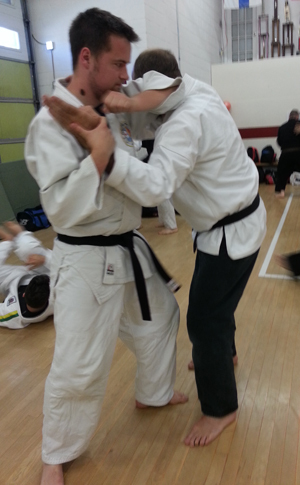 Attaining a CJC Black Belt will remain one of the most important moment's in a candidate's life. 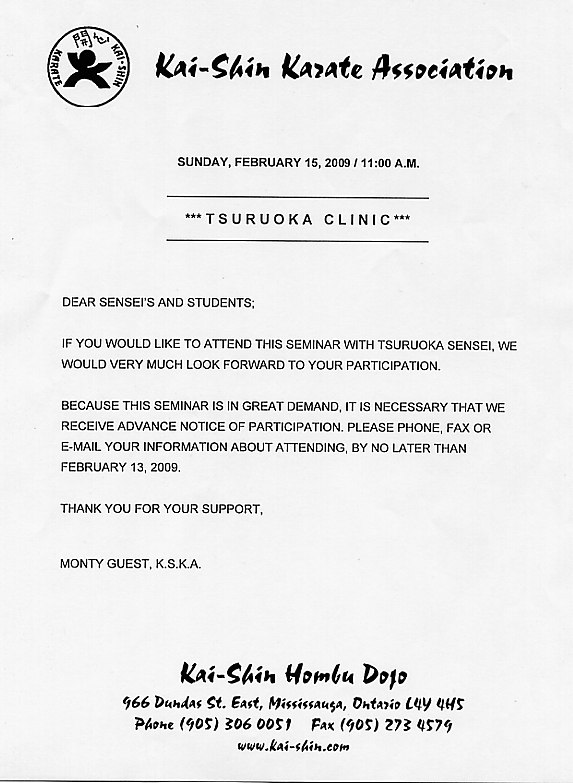 Total commitment, total dedication. 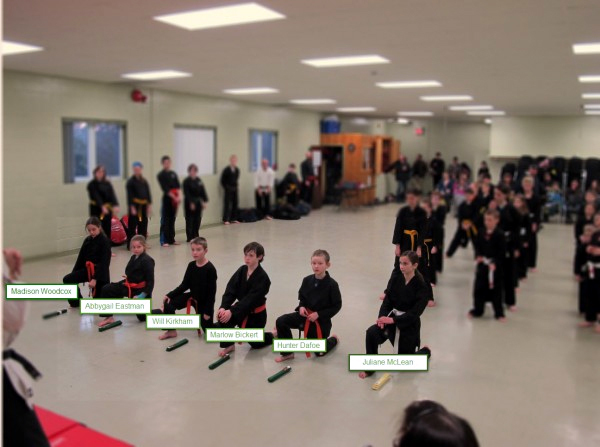 candidates, their uke, their head instructor and the Grading Board. 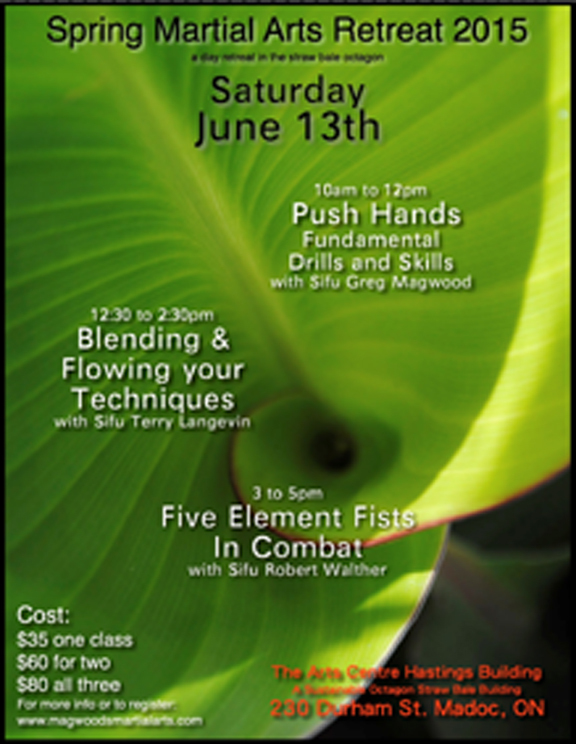 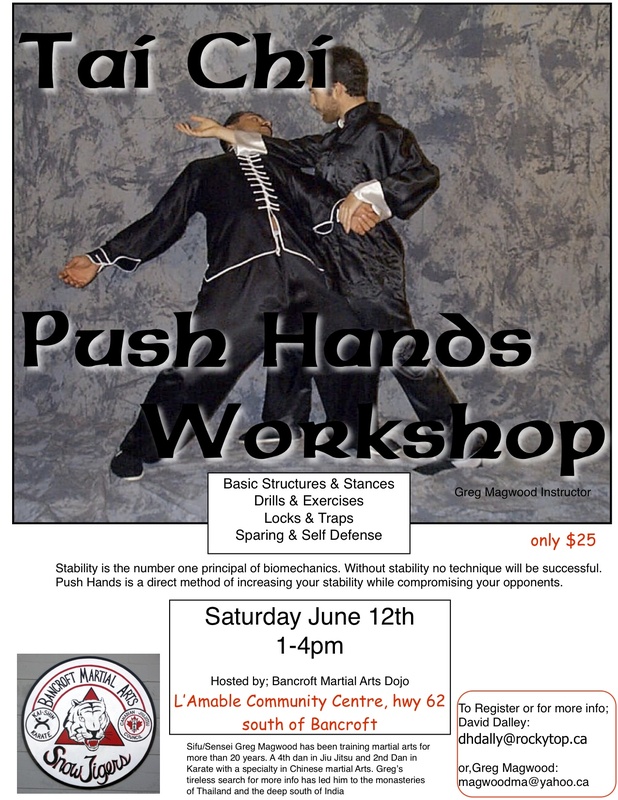 The first Push Hands Summer Camp in August of 2015 was the result of many years of students and interested martial artists asking me to offer a more intensive Push Hands and Internal Martial Arts training day. 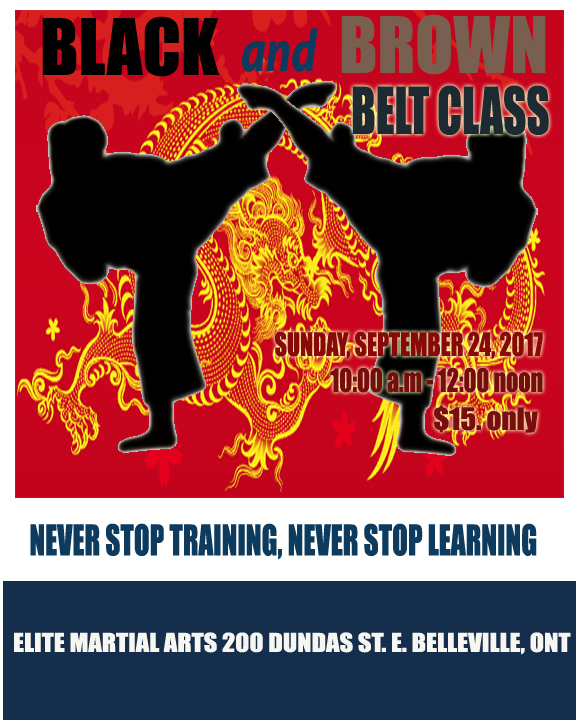 It was a great success with participants from multiple martial arts styles from all over Ontario coming together in Madoc to train. 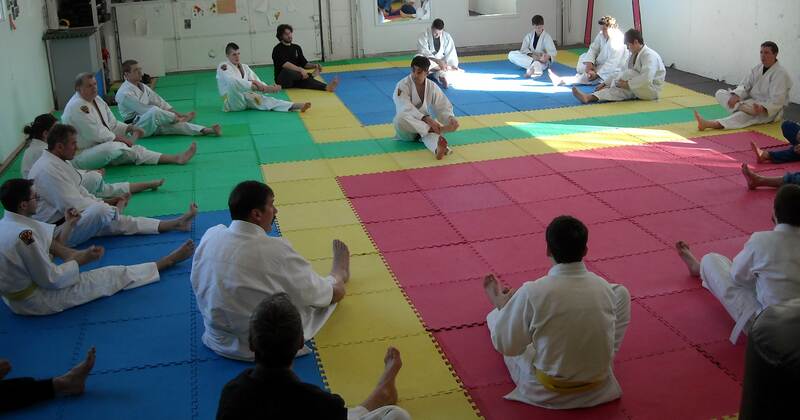 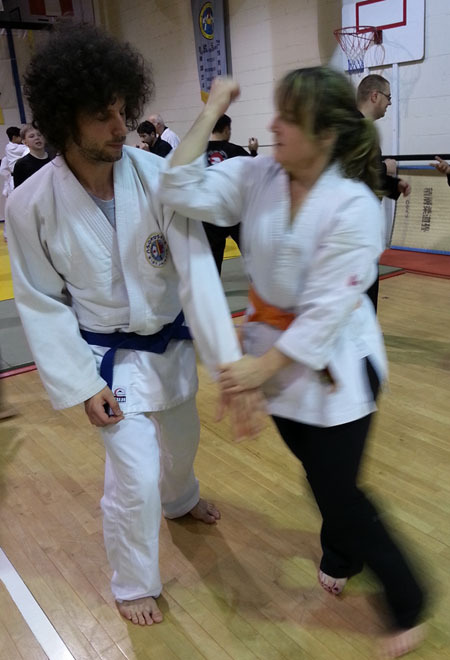 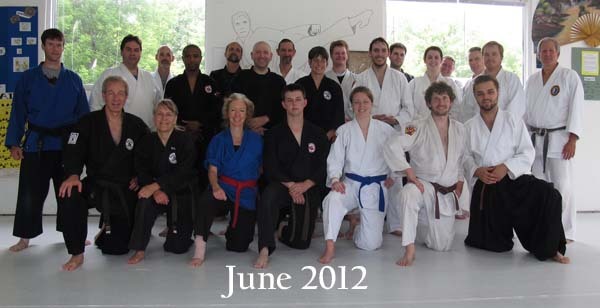 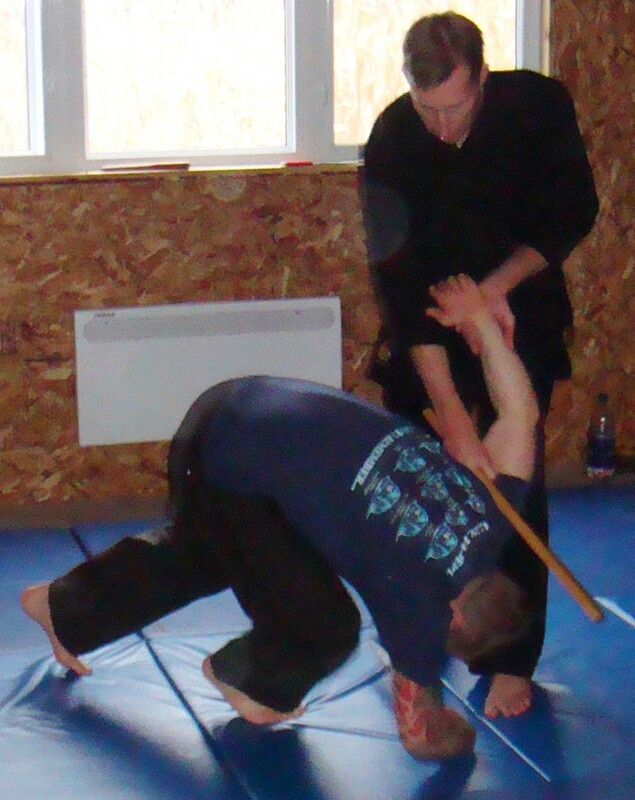 Beginners and advanced students hard and soft style practitioners all working together to increase their skills. 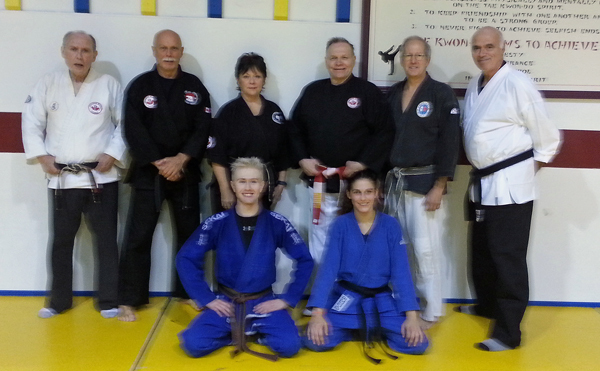 Even after a full day of training everyone thought the class was still too short! 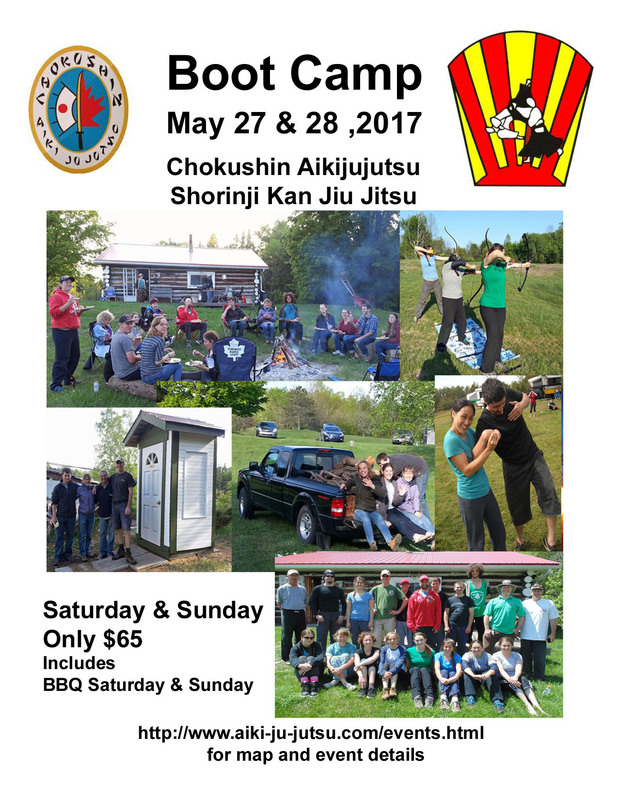 I'm really looking forward to the 2018 camp. 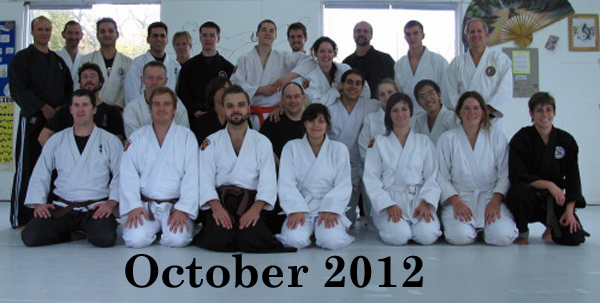 It feels like each year it's building more and more momentum. 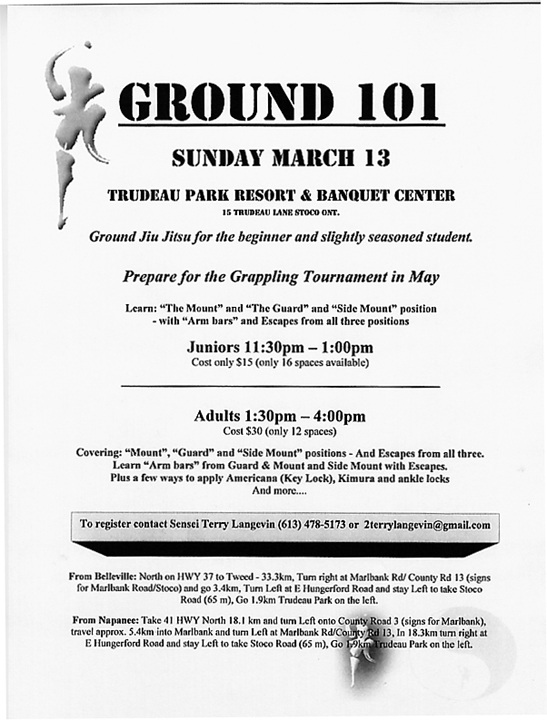 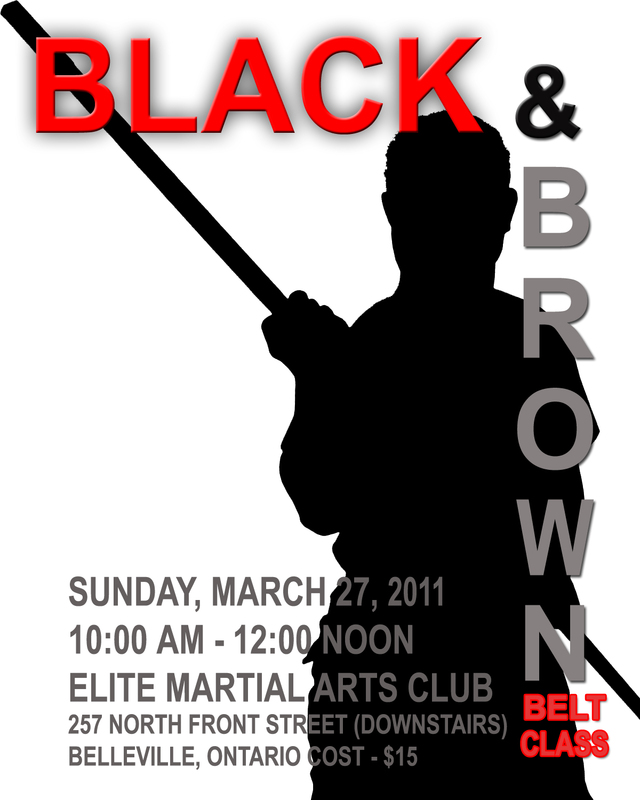 Open to all skill levels and styles. 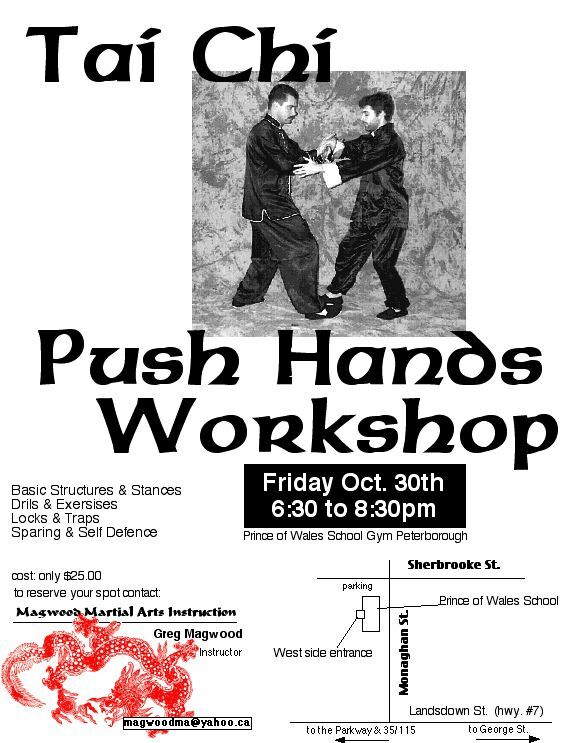 Push Hands is one of those great universal skills that can support and improve fighters from any type of martial arts or sport fighting system. 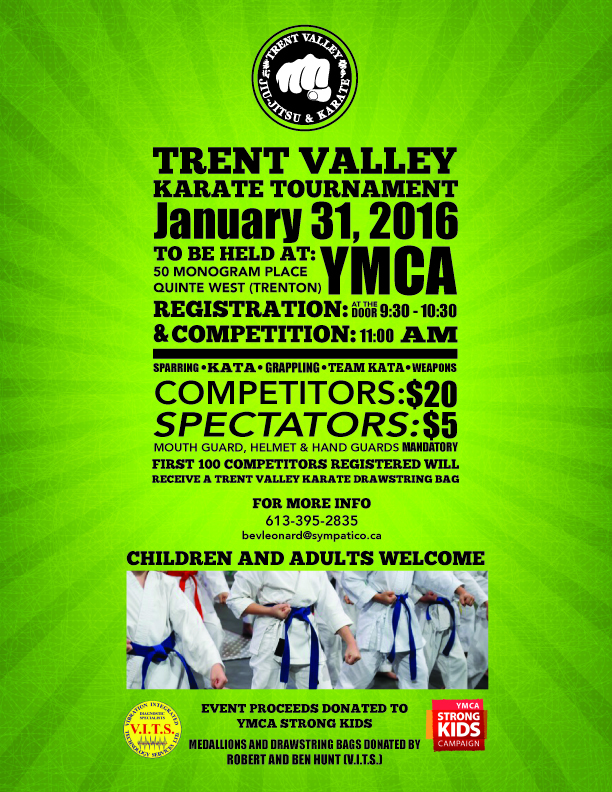 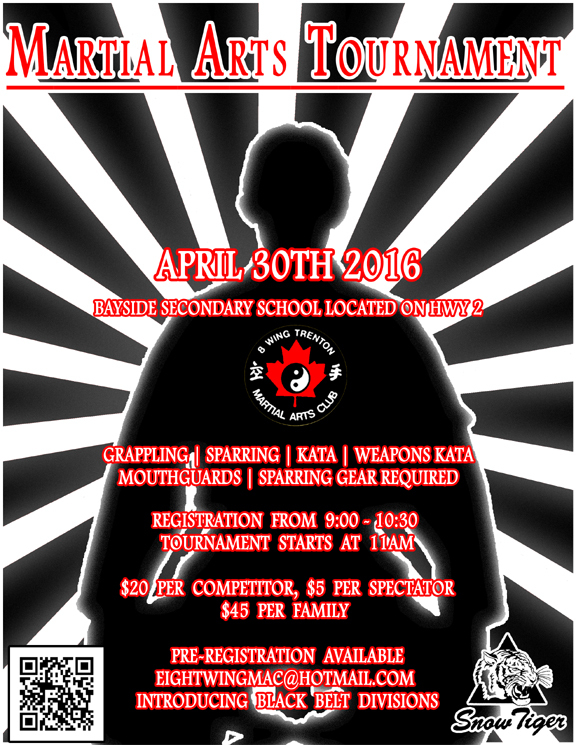 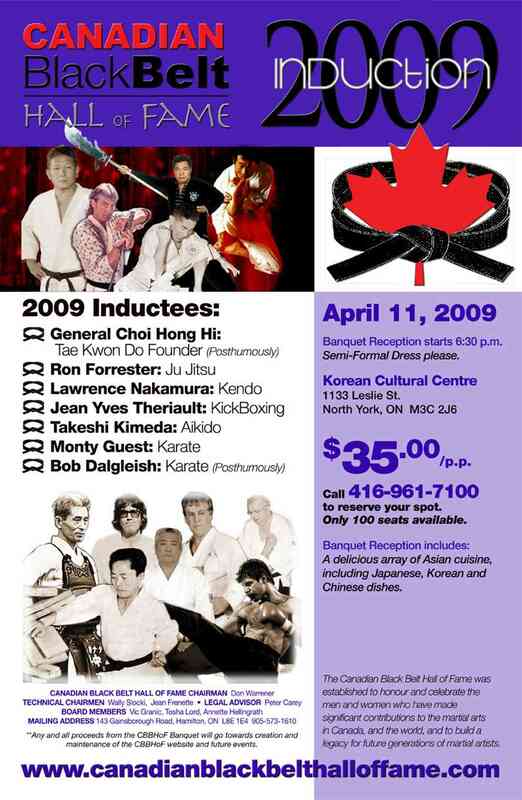 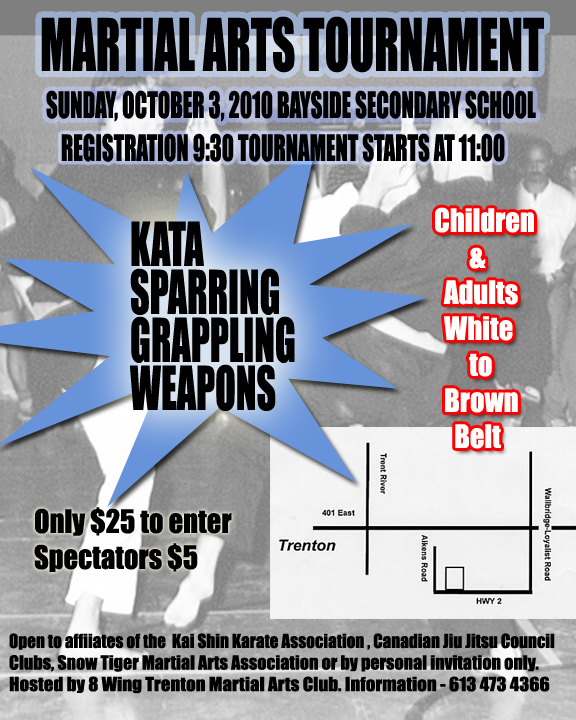 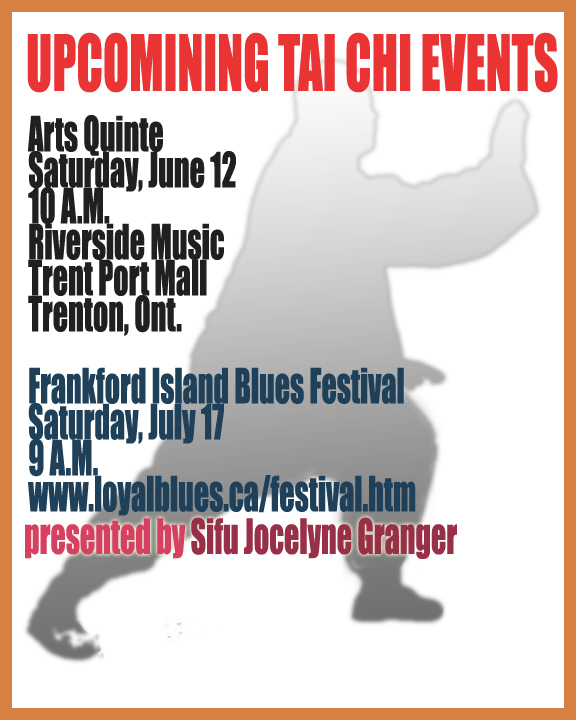 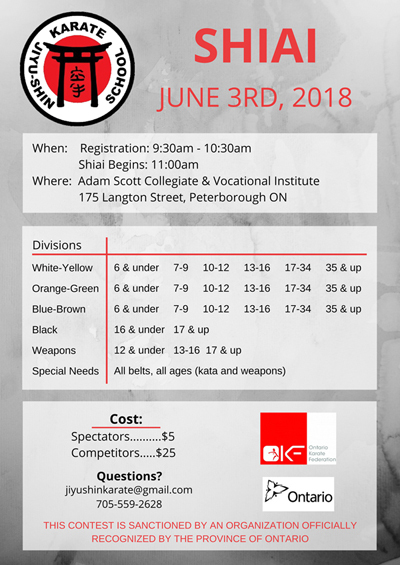 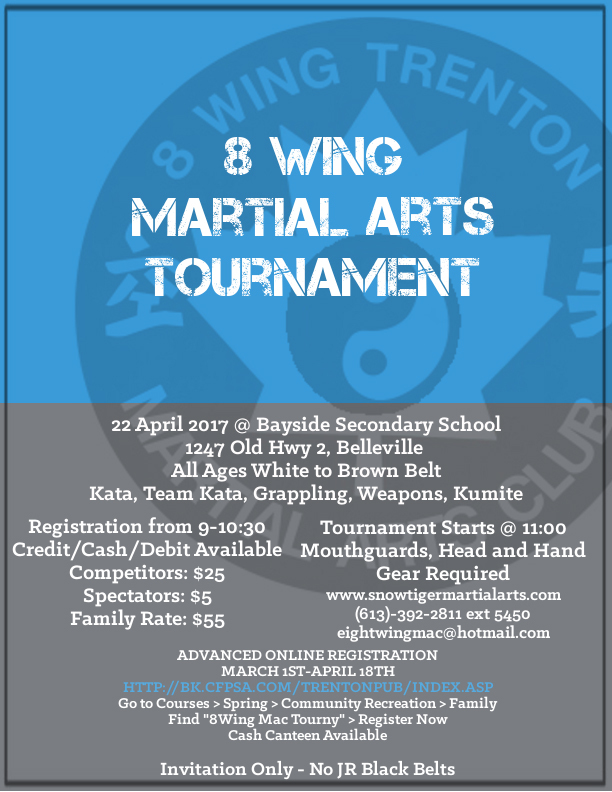 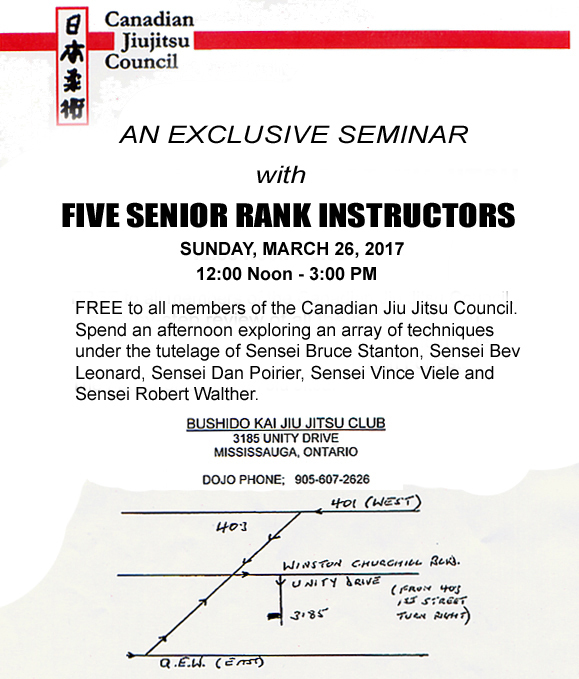 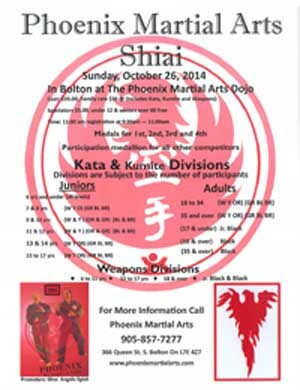 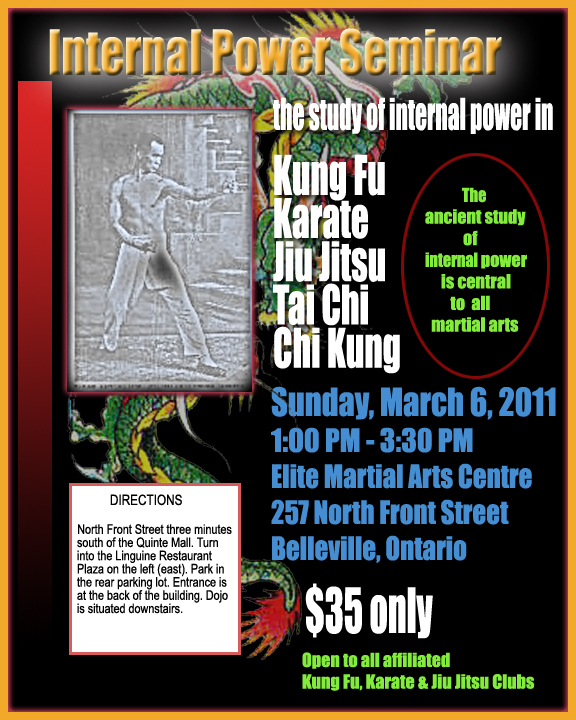 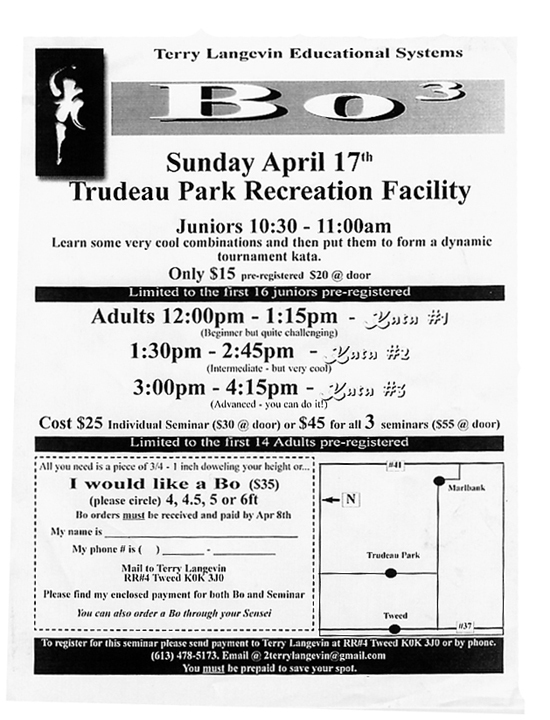 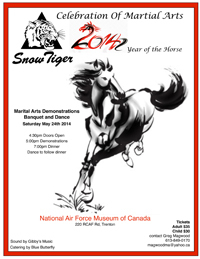 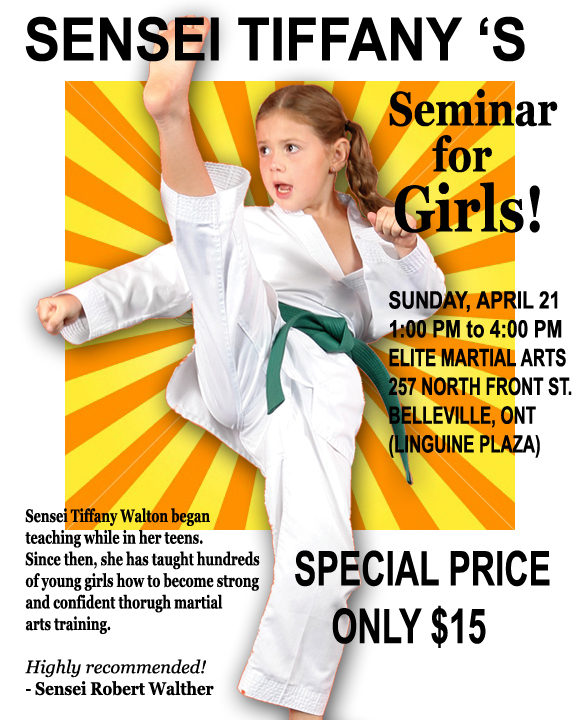 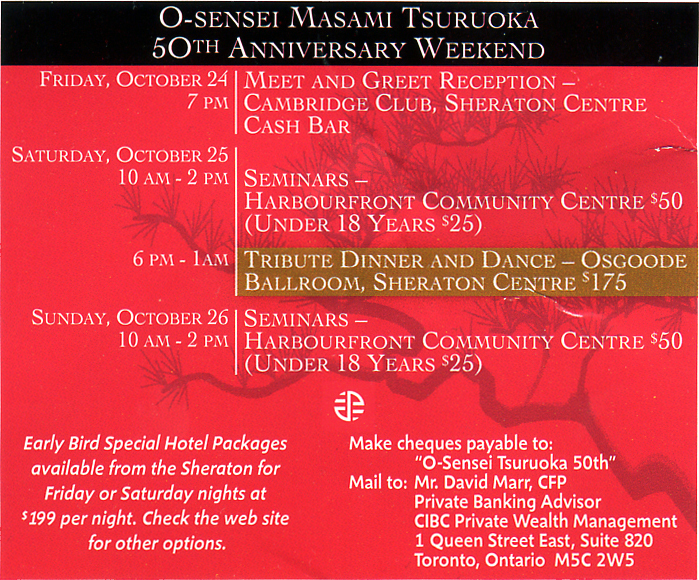 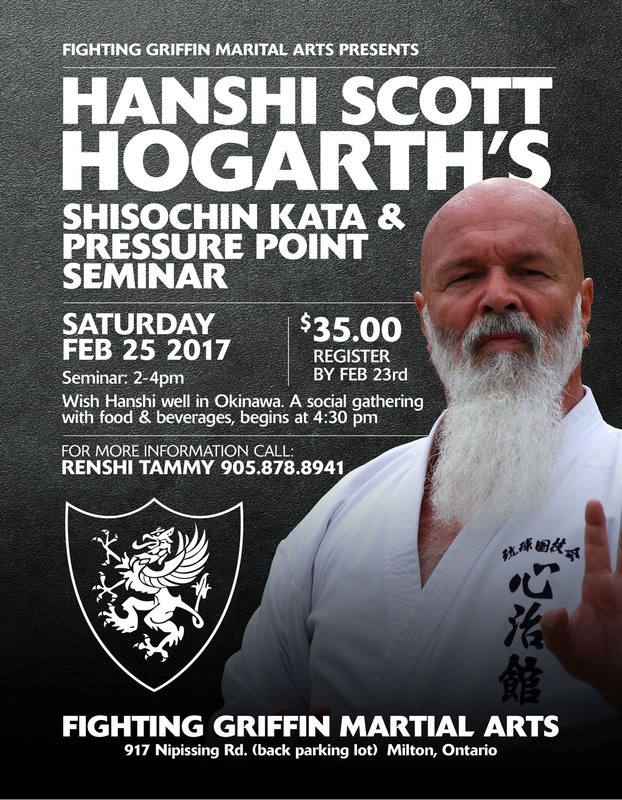 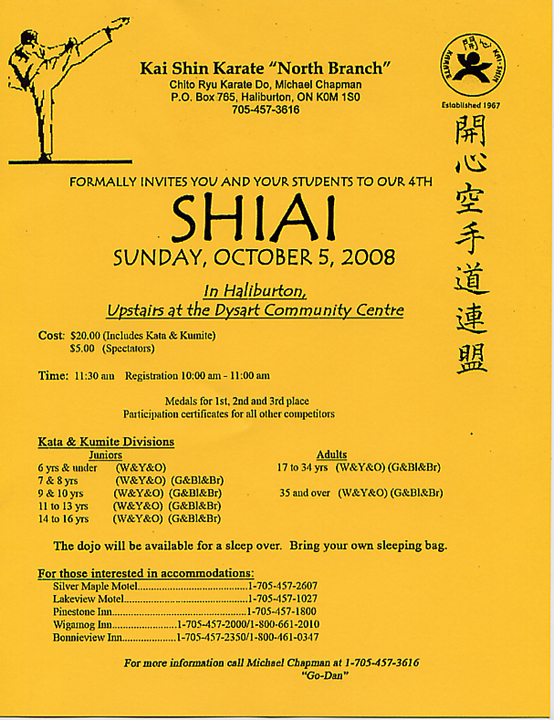 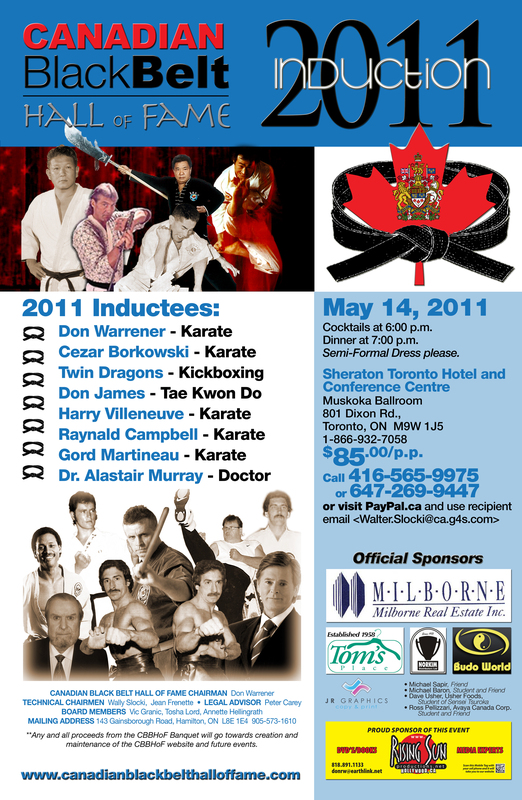 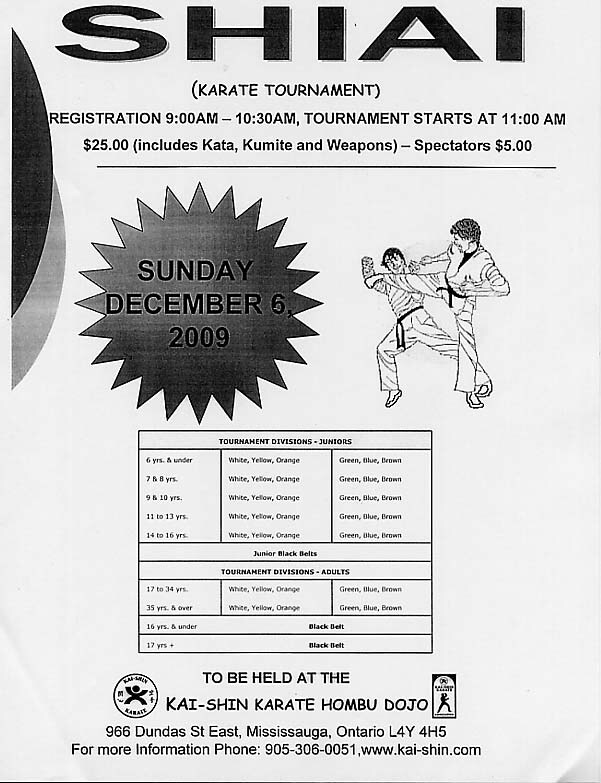 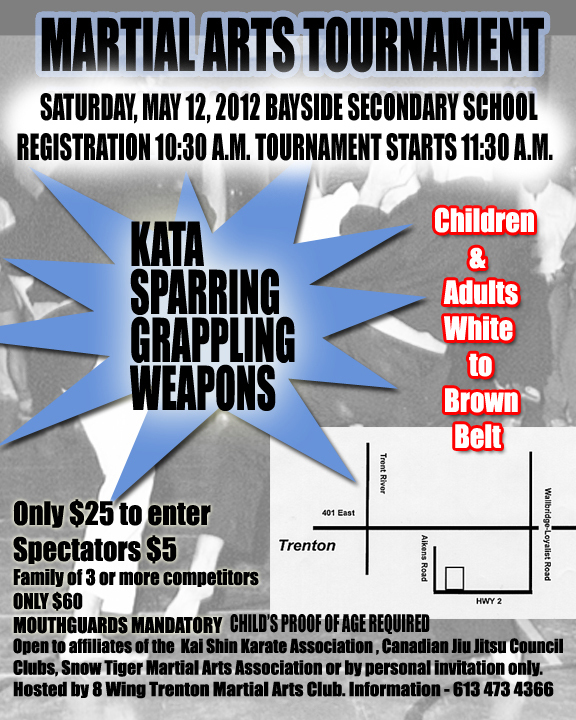 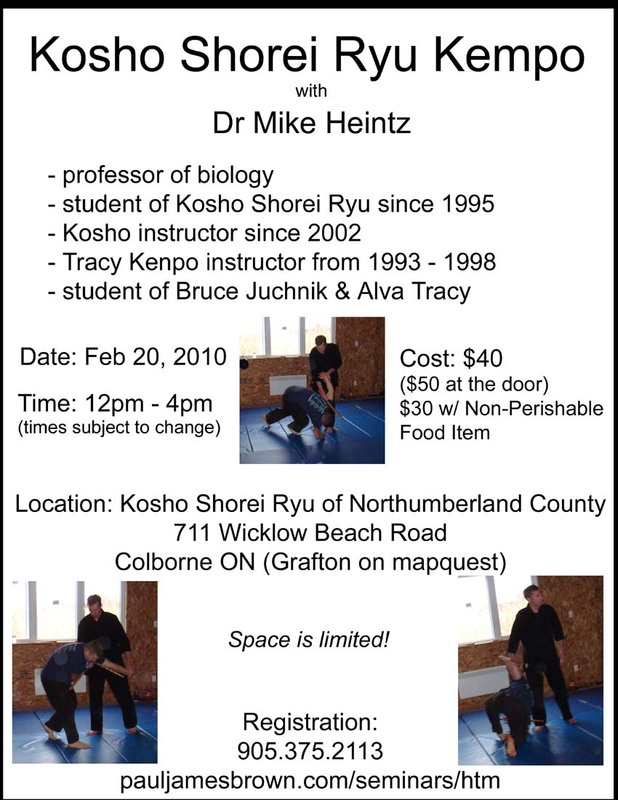 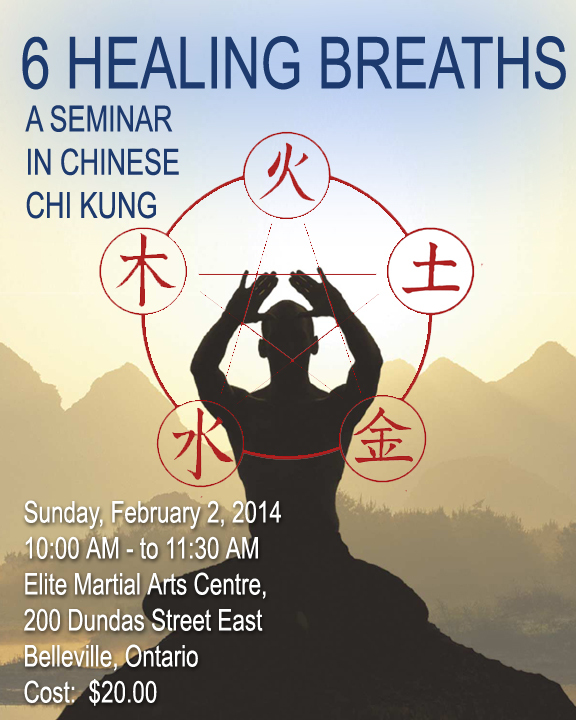 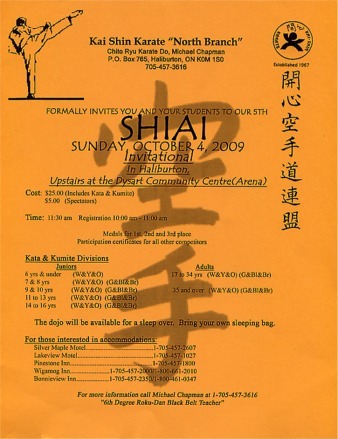 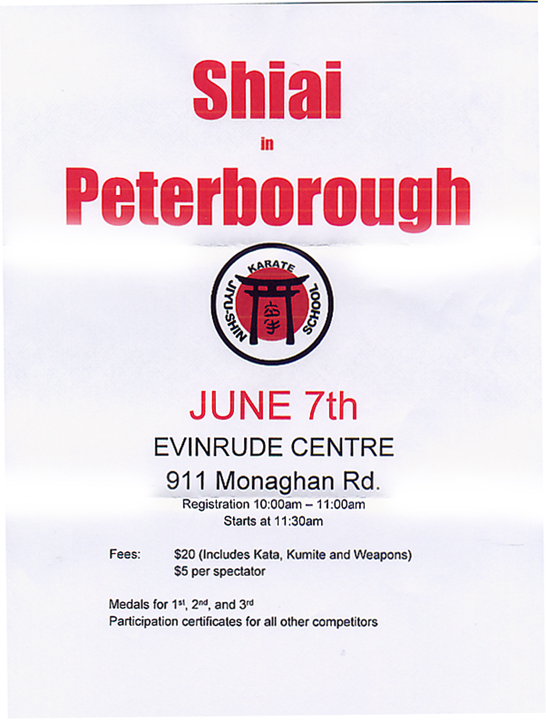 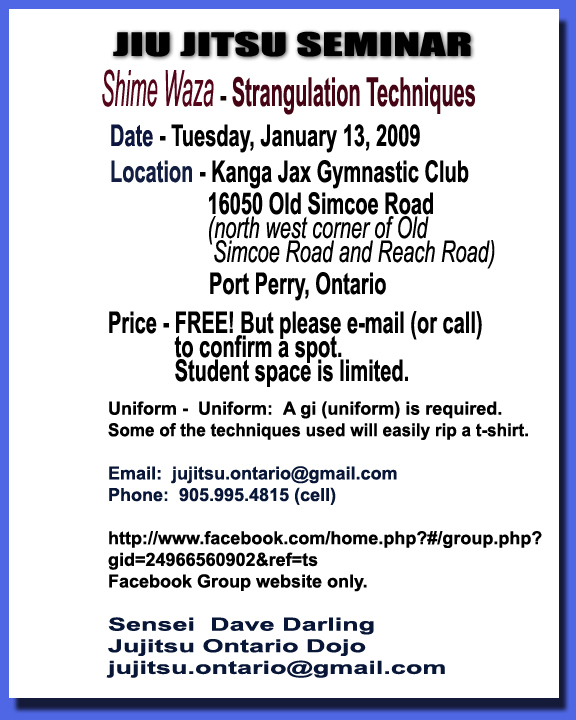 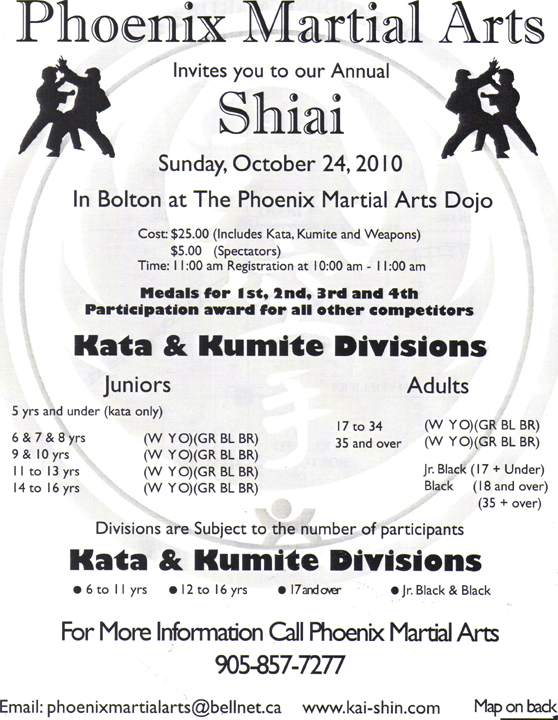 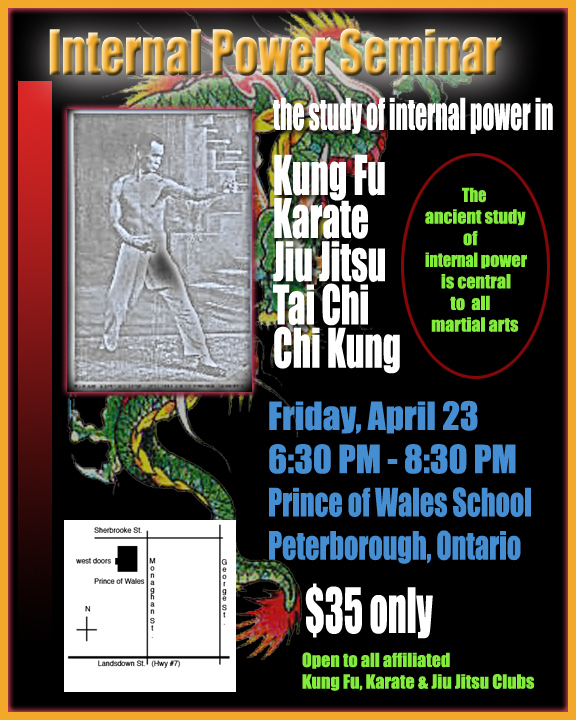 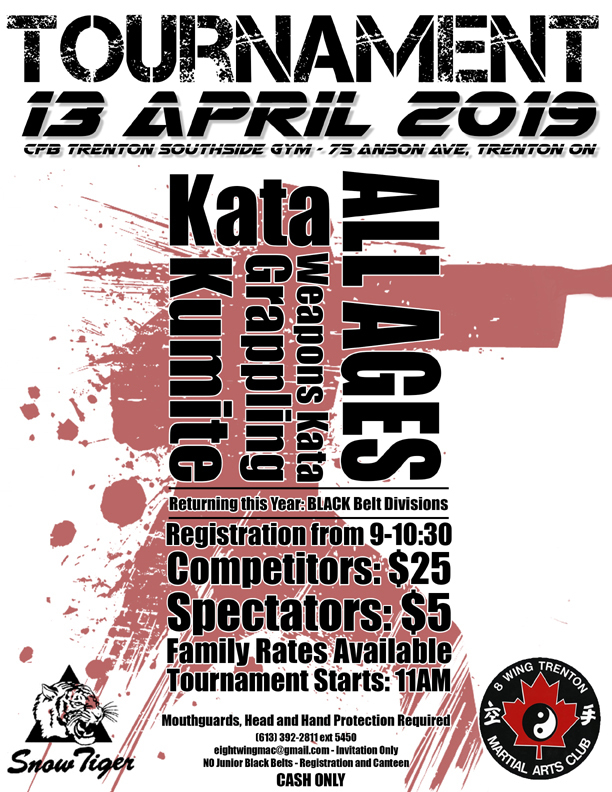 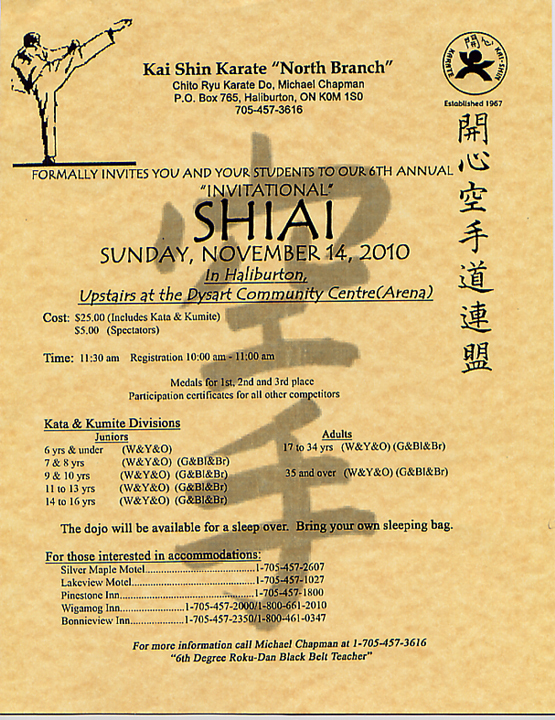 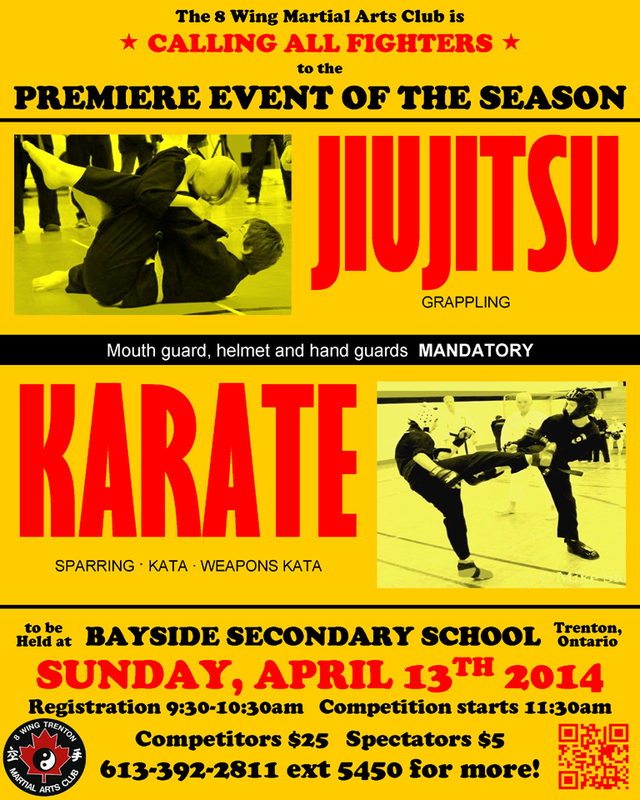 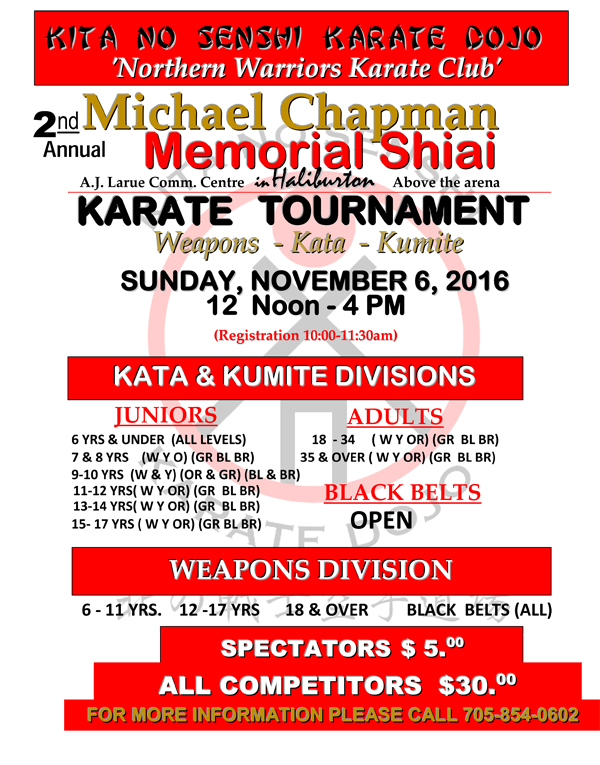 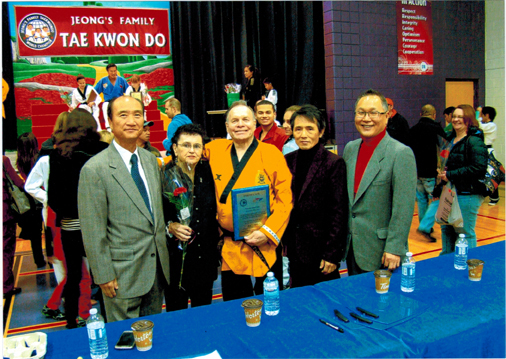 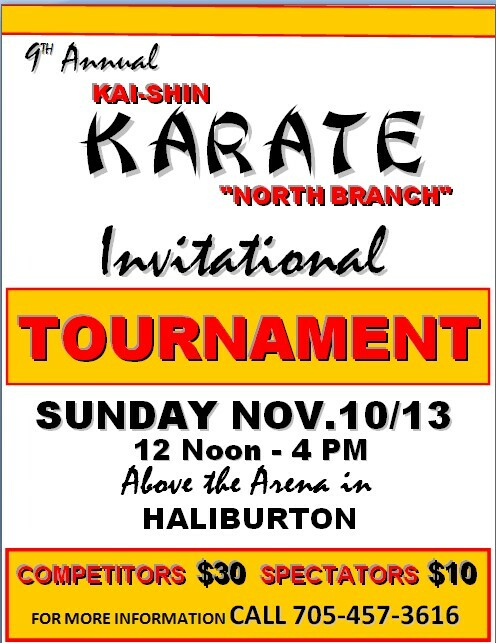 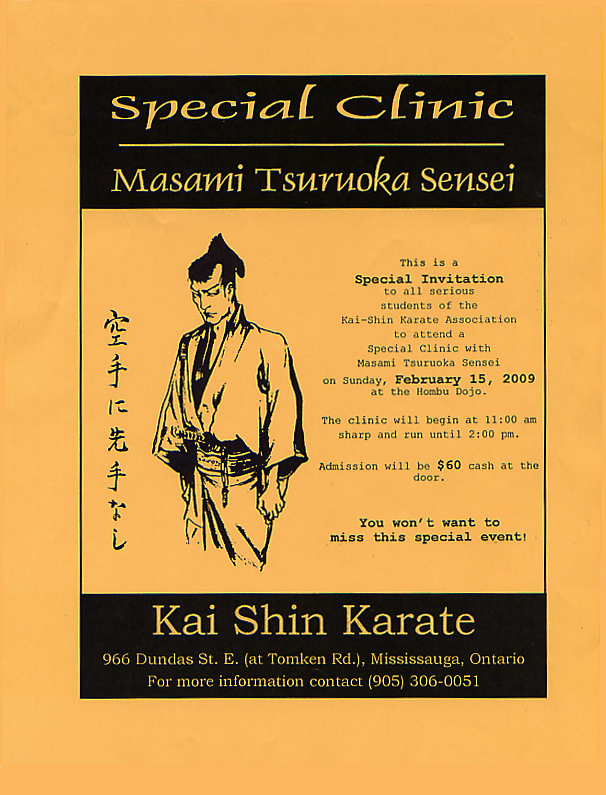 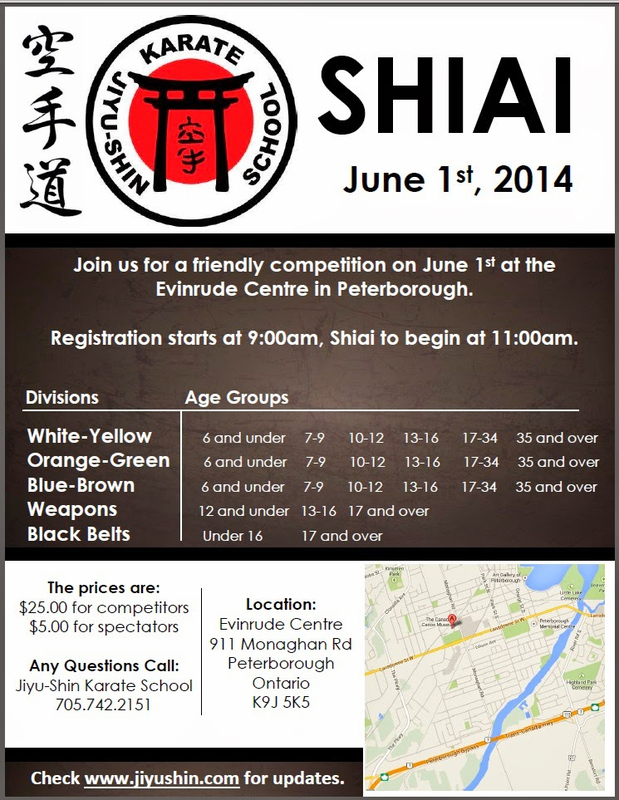 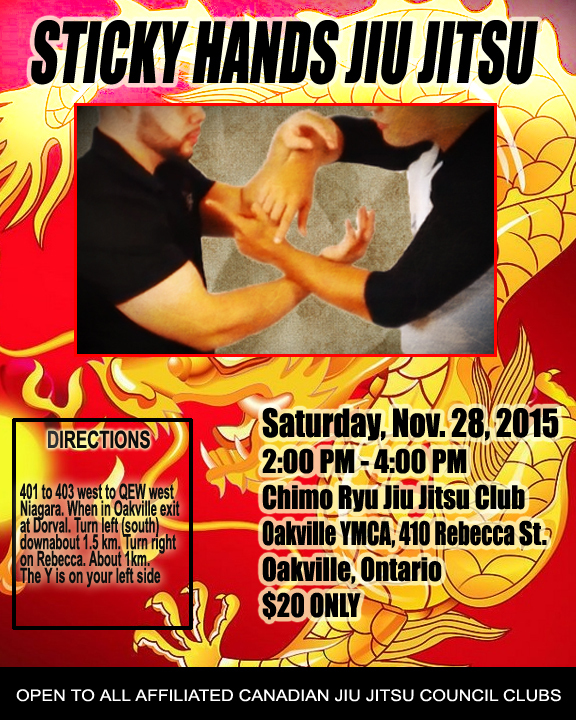 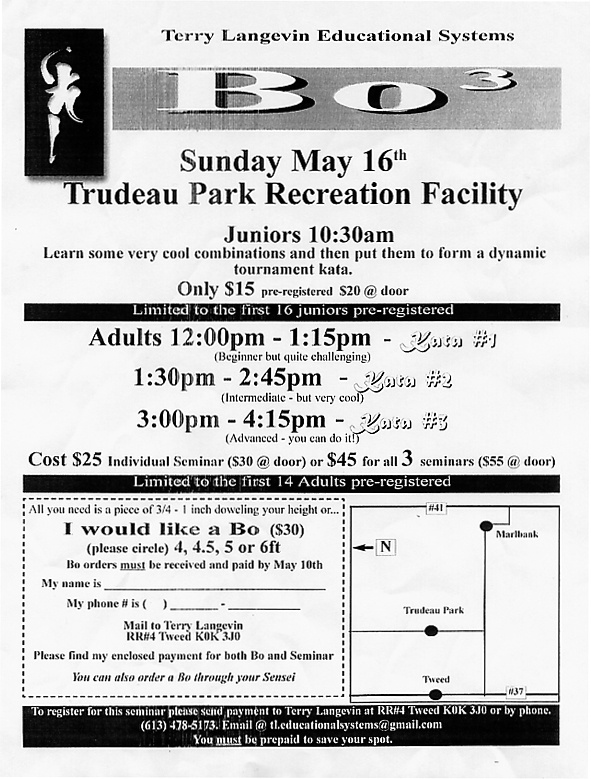 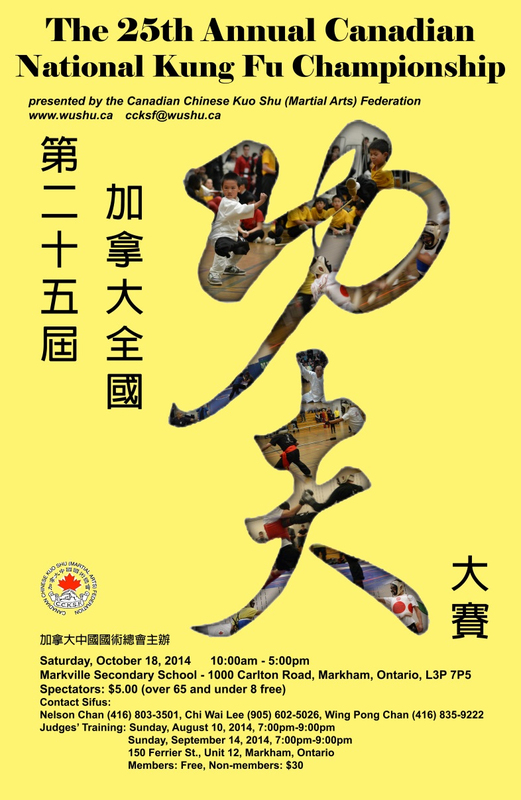 Every year, Jiyu-Shin Karate runs one of the most popular tournaments in the province of Ontario. 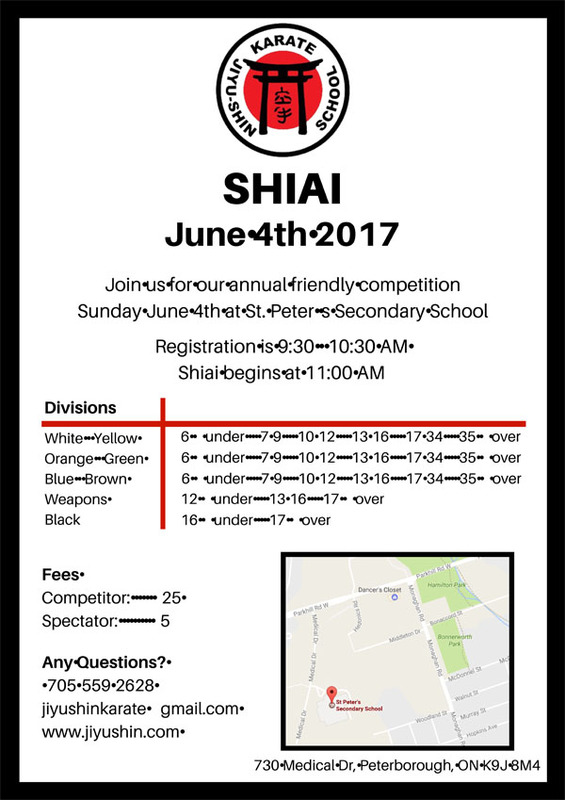 It's always fair and always a lot of fun. 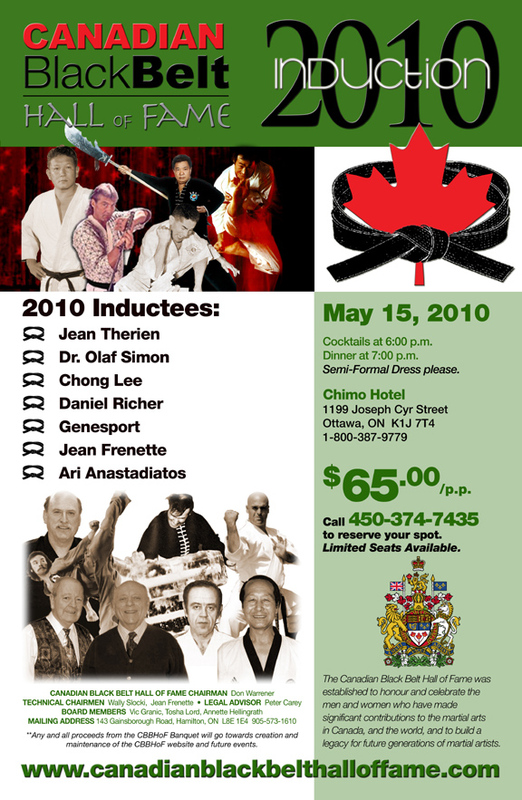 This year's June 3 event comes highly recommended. 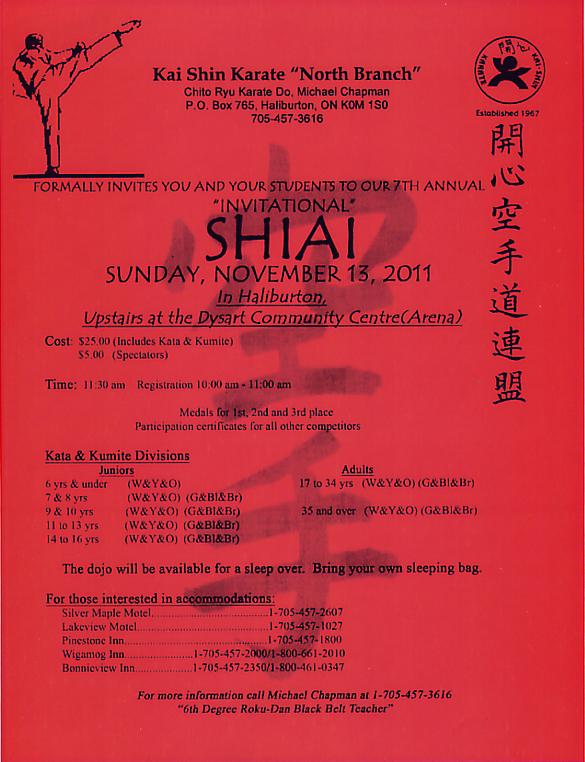 Let's show our support to the folks who are always there for us whenever we have an event. 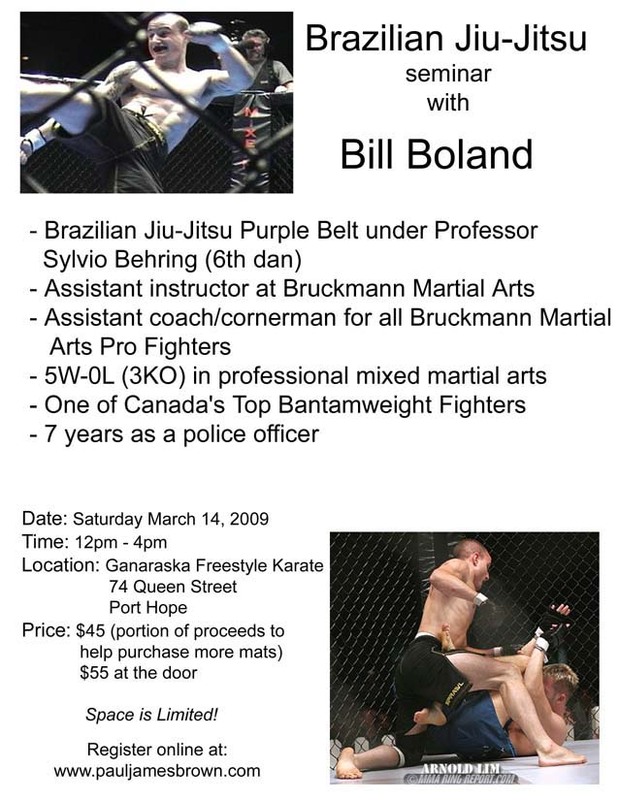 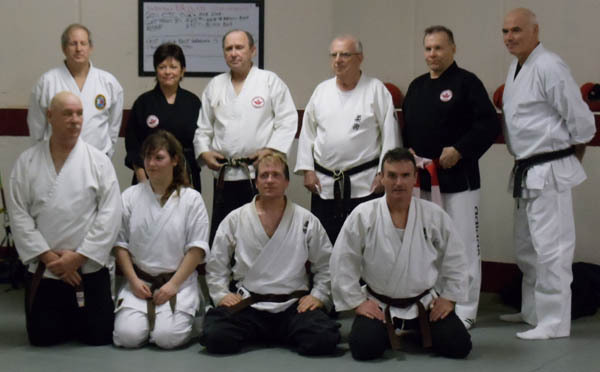 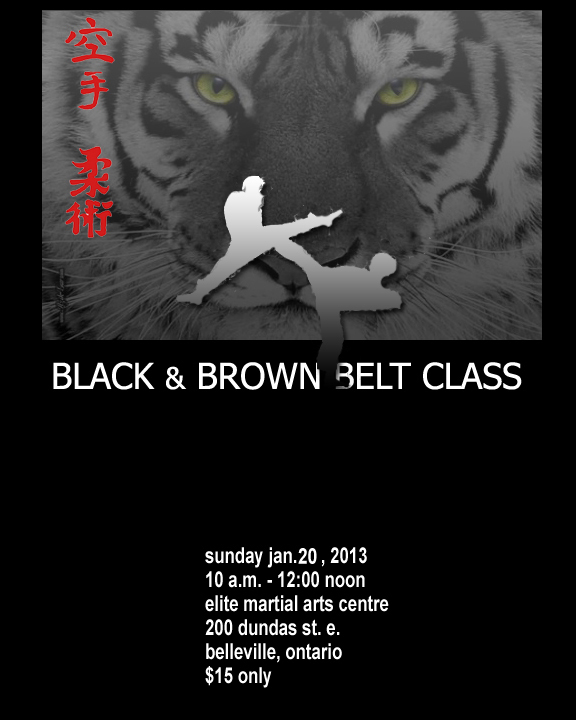 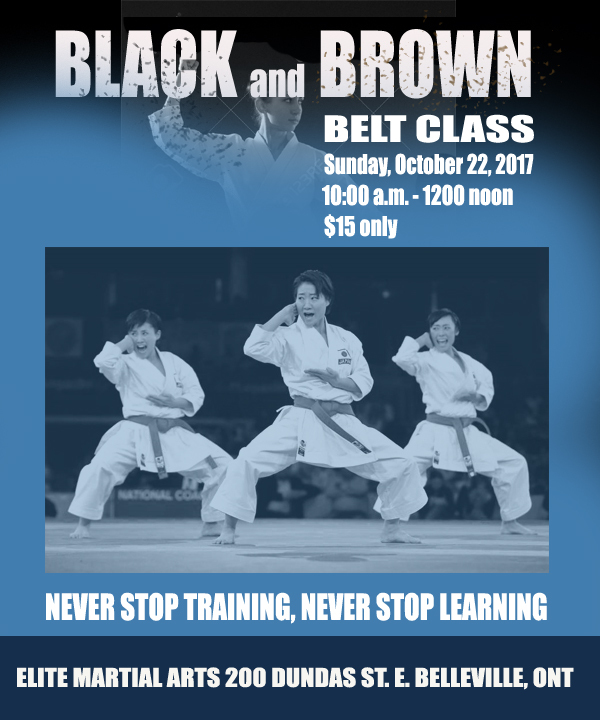 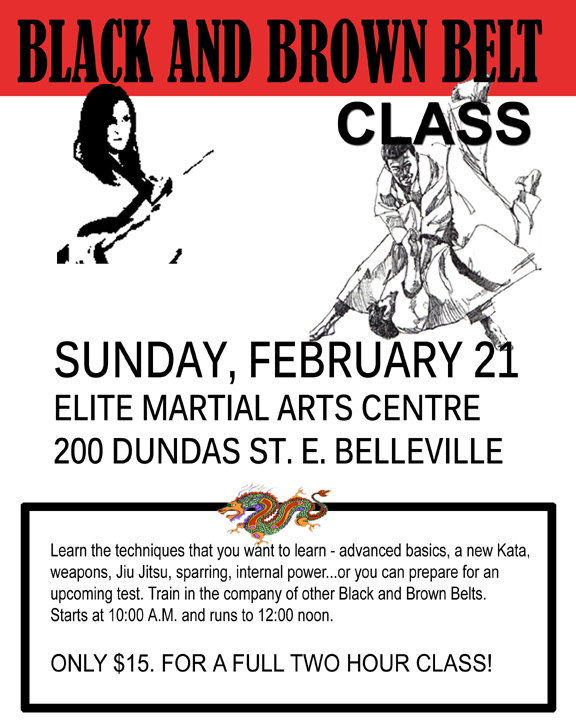 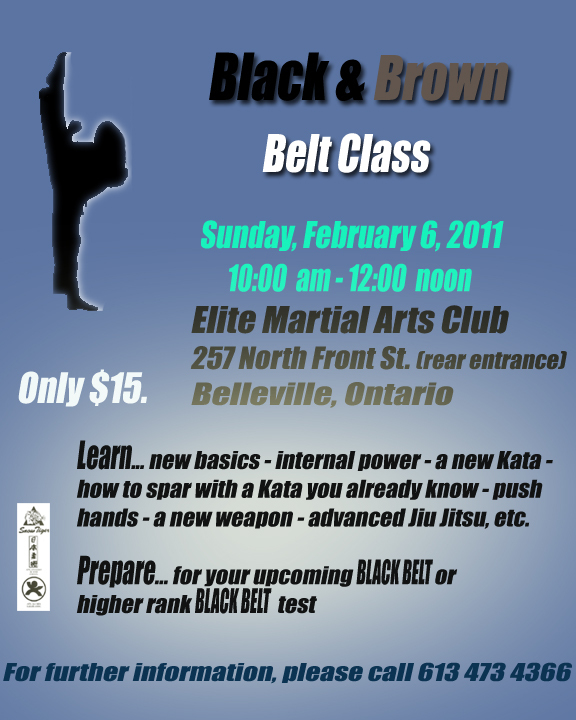 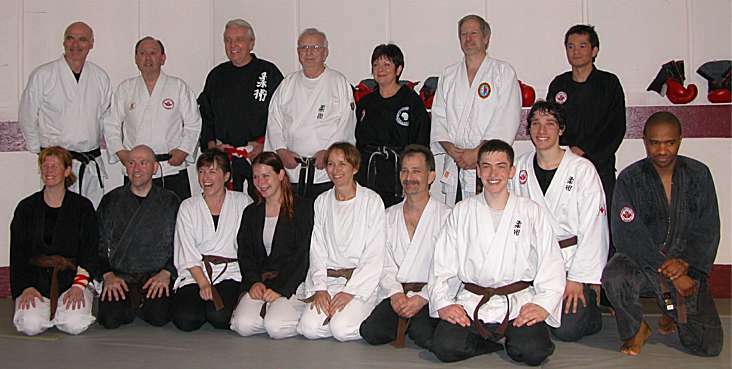 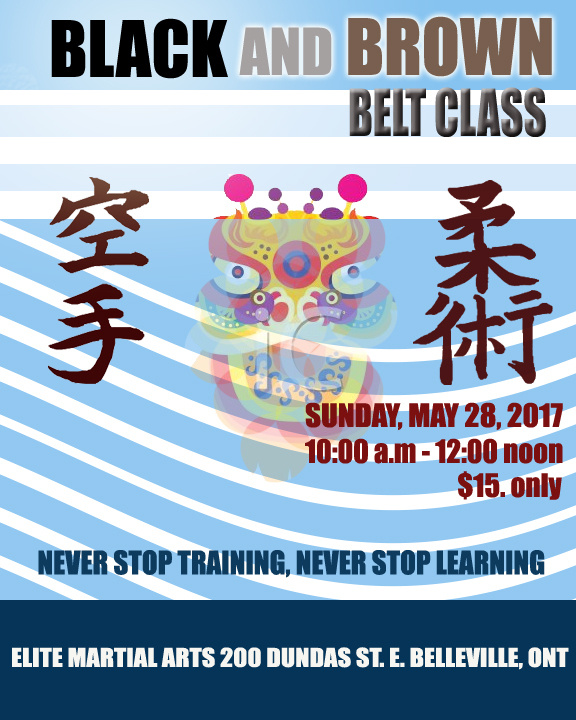 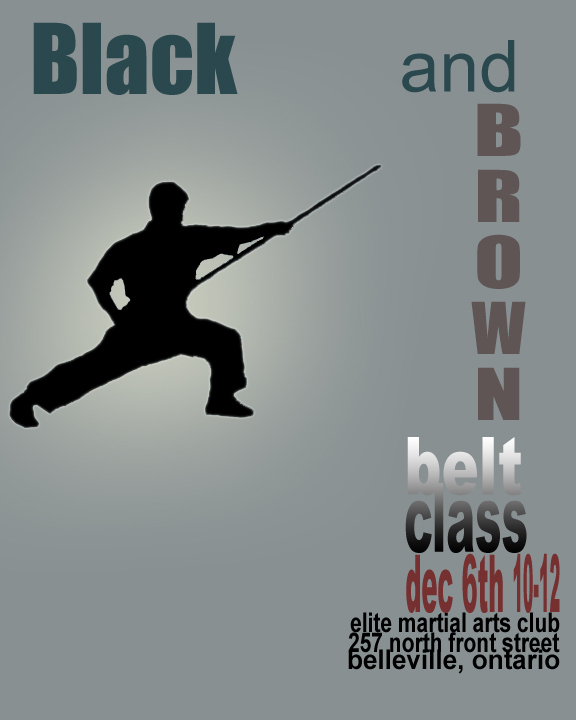 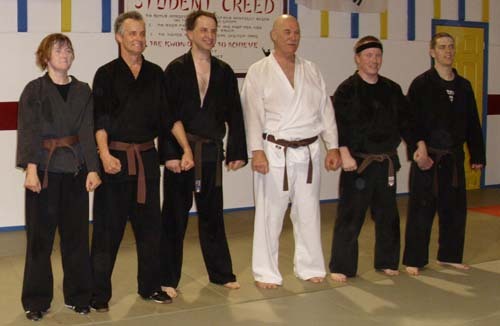 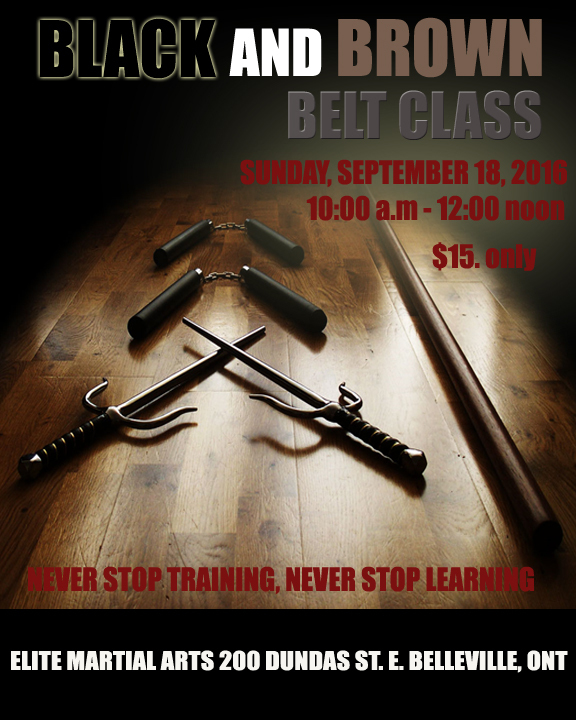 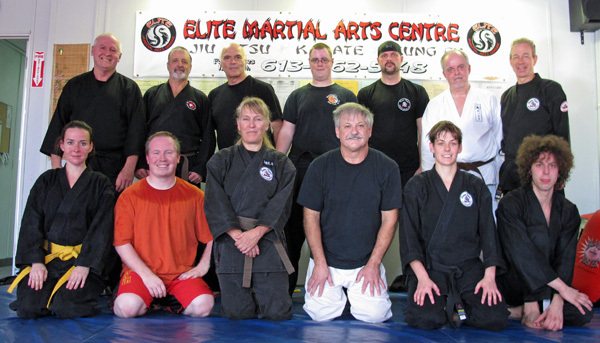 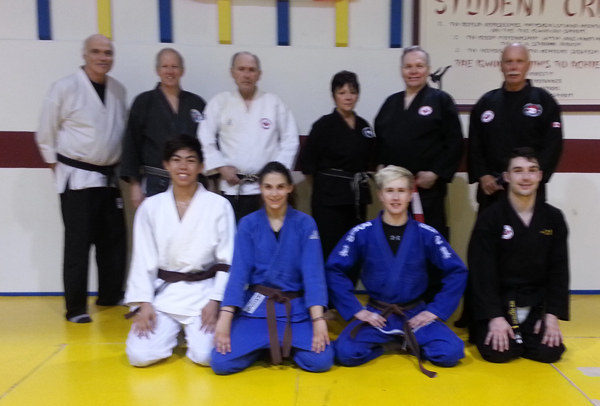 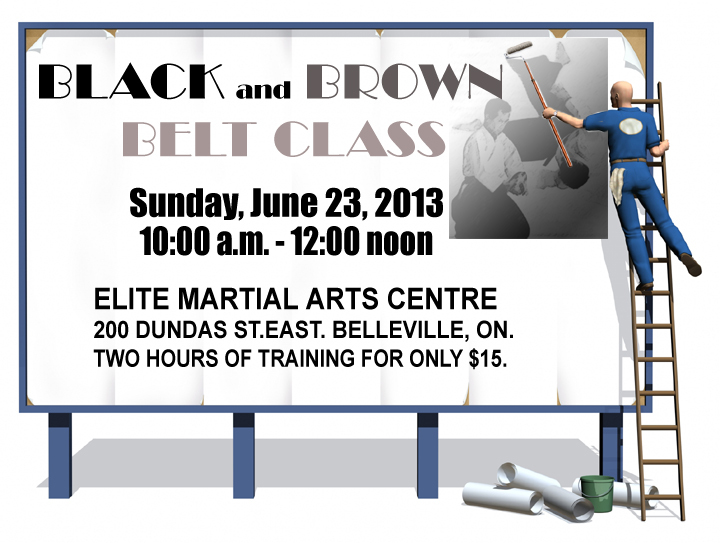 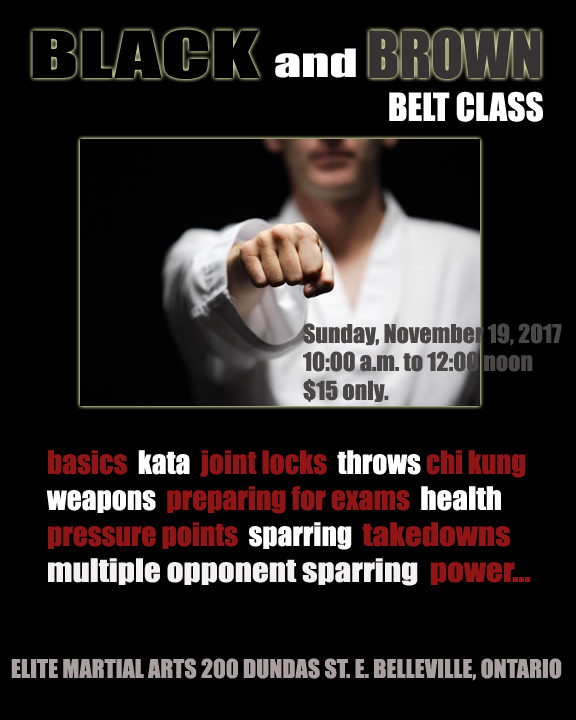 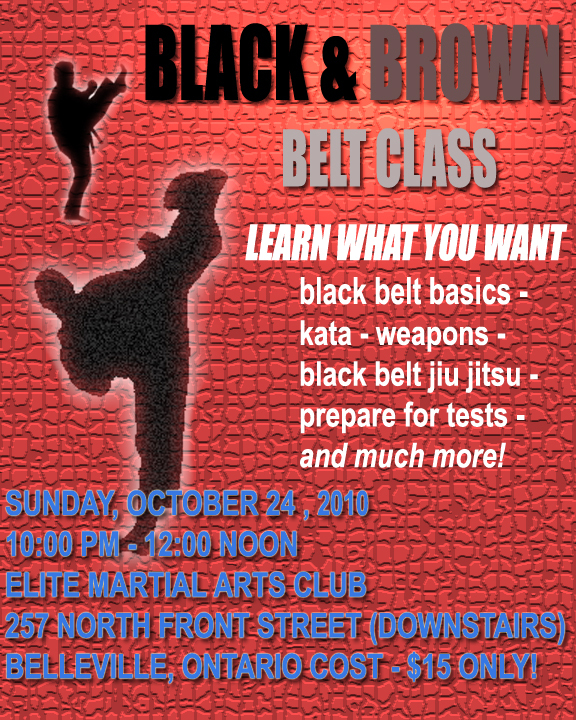 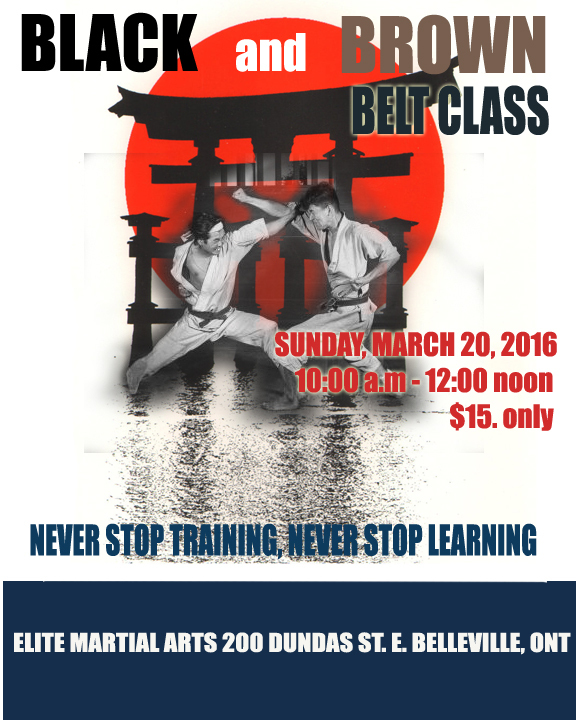 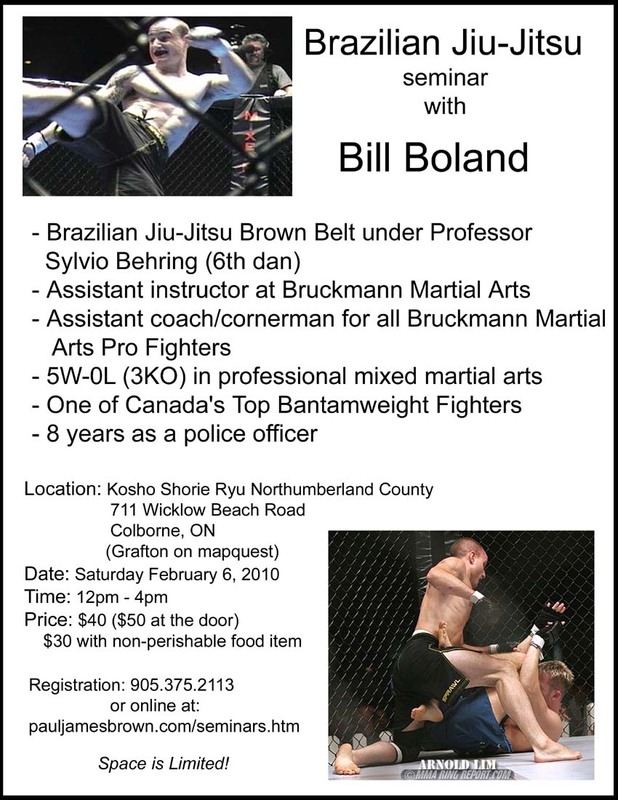 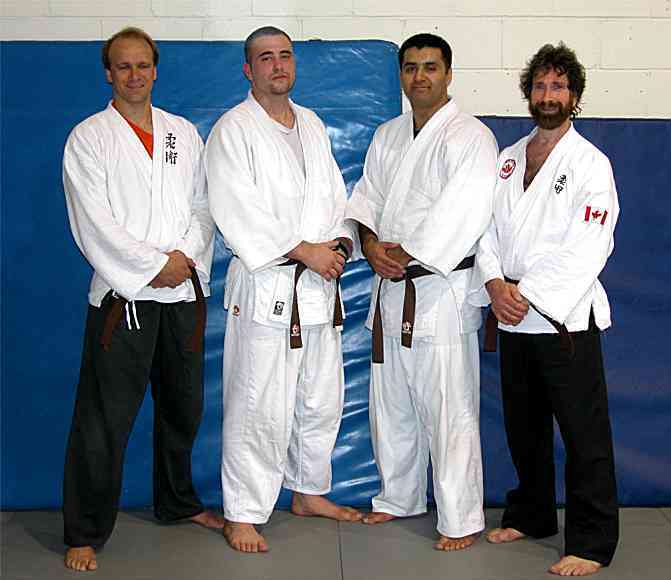 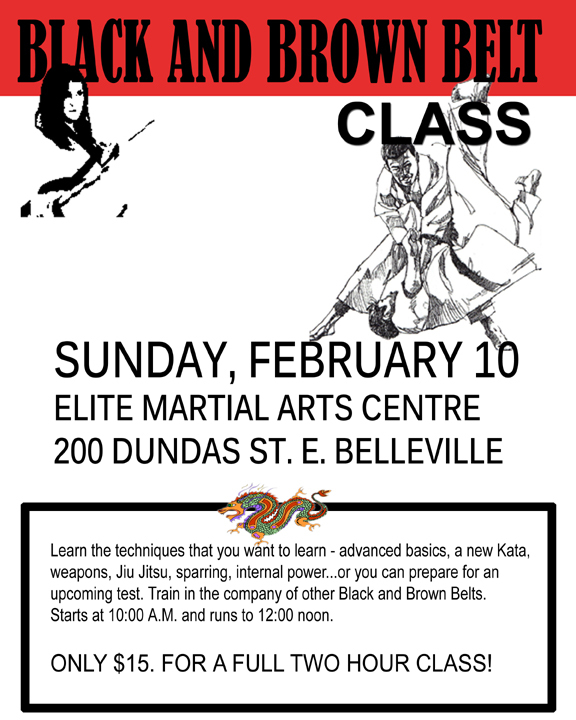 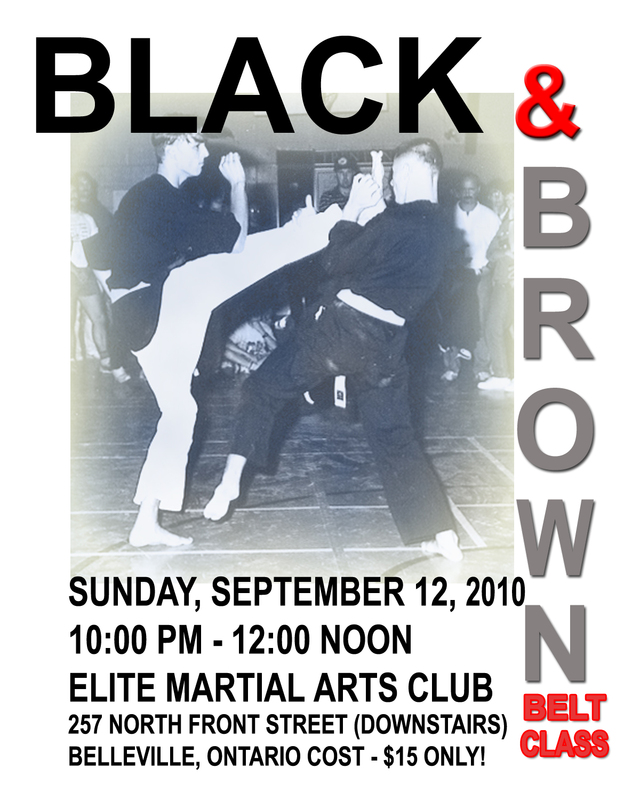 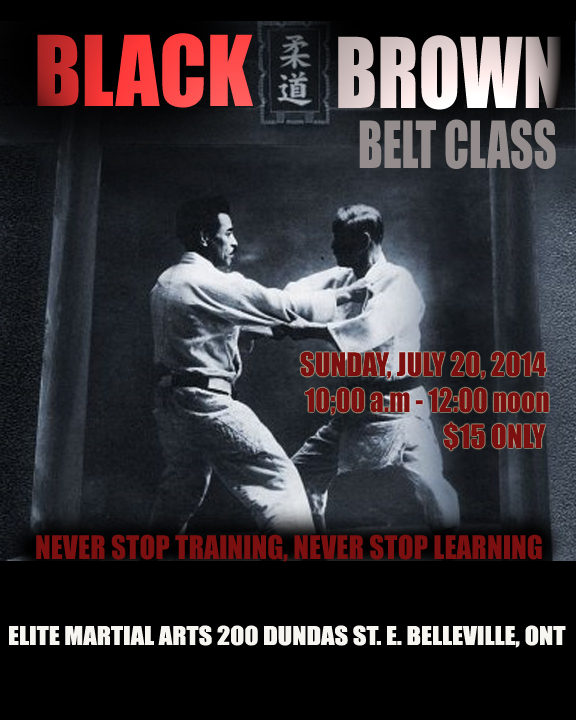 Black and Brown Belt Class scheduled for Sunday, November 19 at 10:00 a.m. at Elite Martial Arts, 200 Dundas St. E. in Belleville. 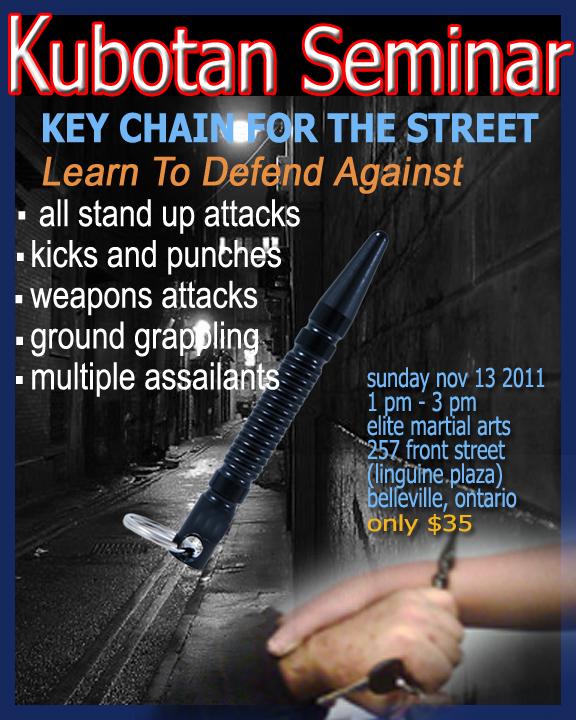 Cost: only $15. 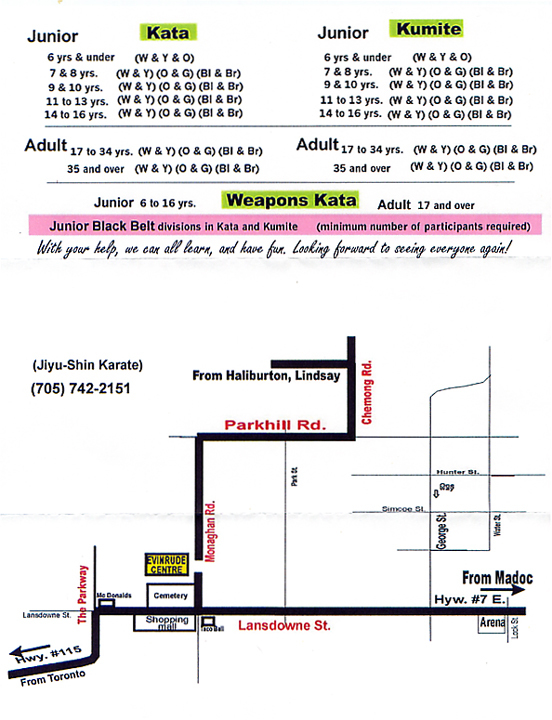 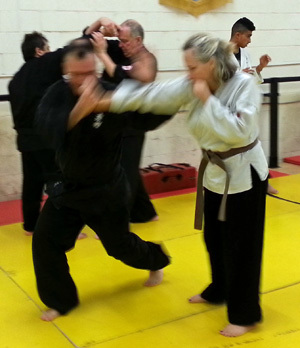 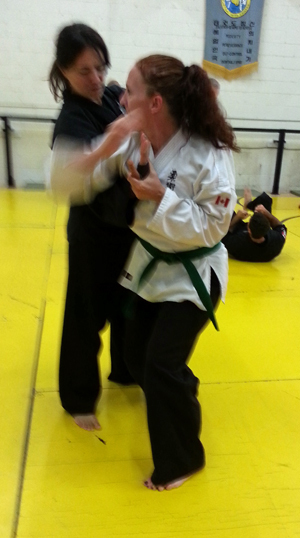 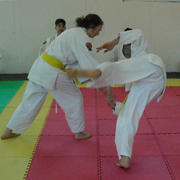 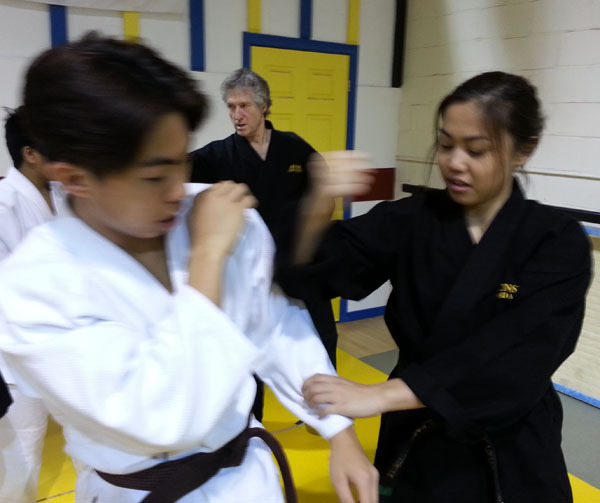 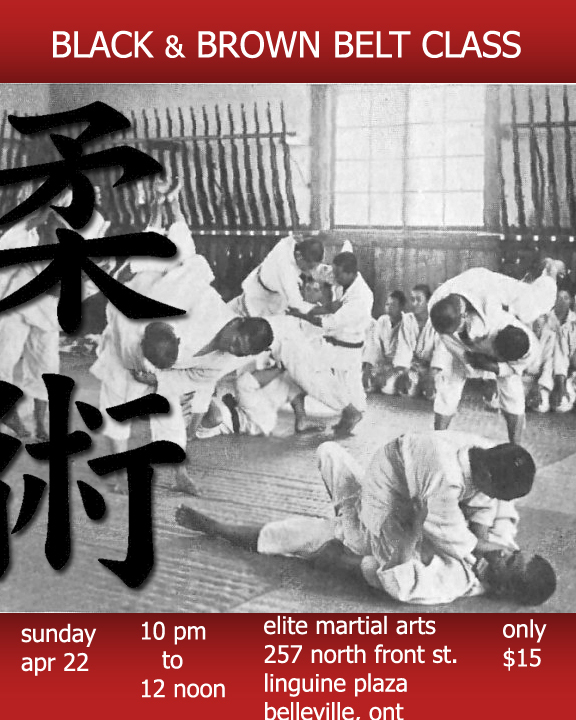 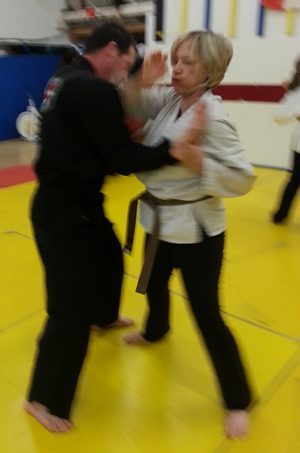 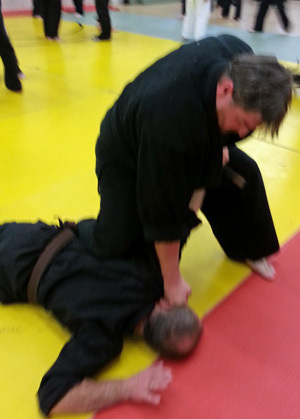 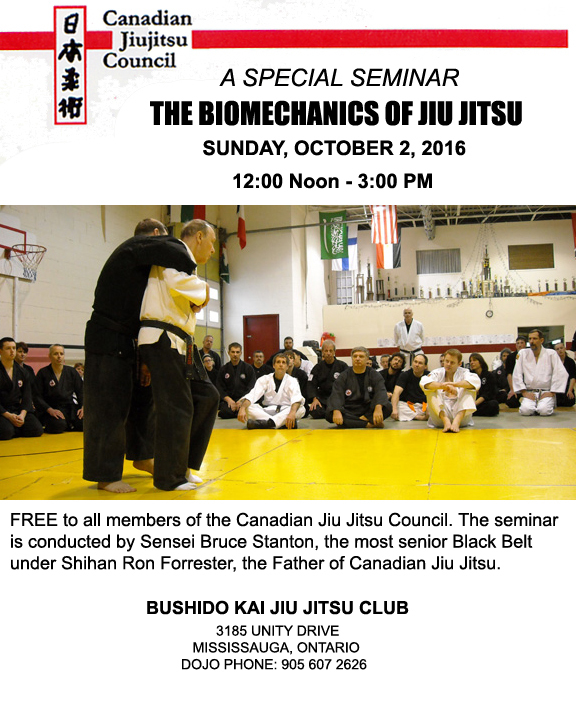 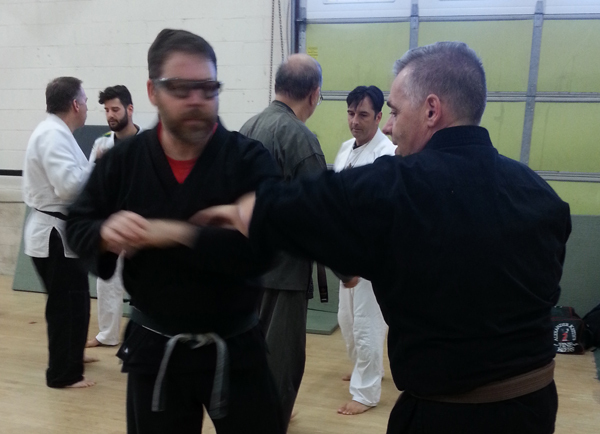 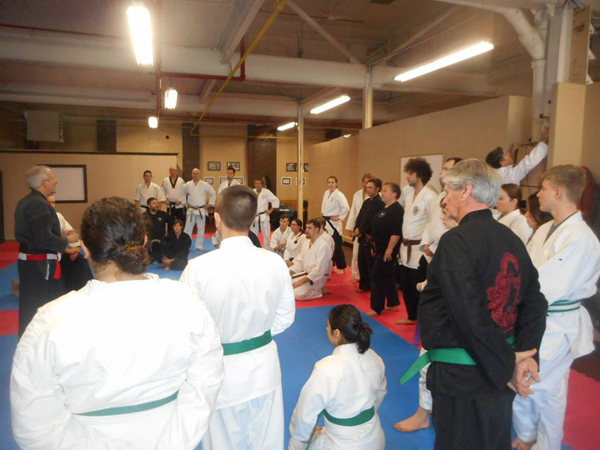 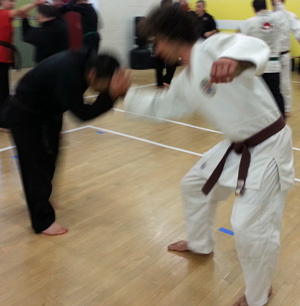 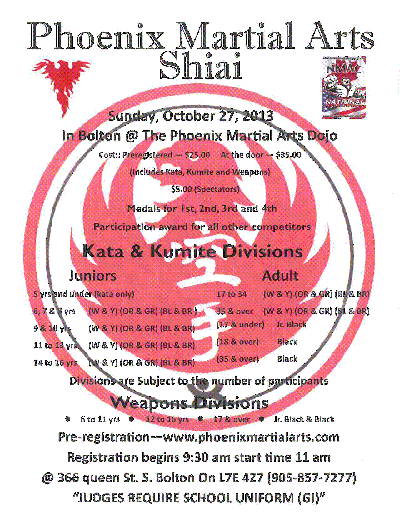 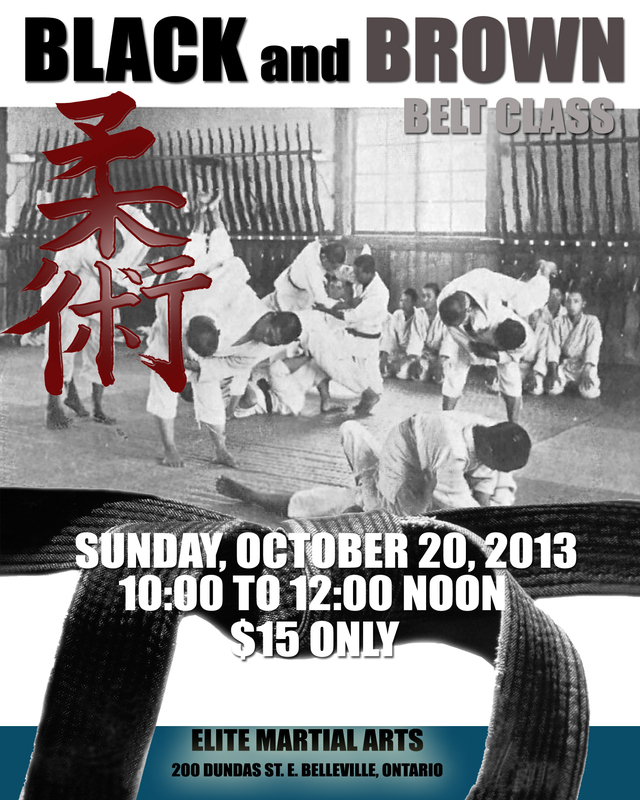 Sunday, October 22 at 10:00 a.m.
interesting areas of basics, Kata or sparring. 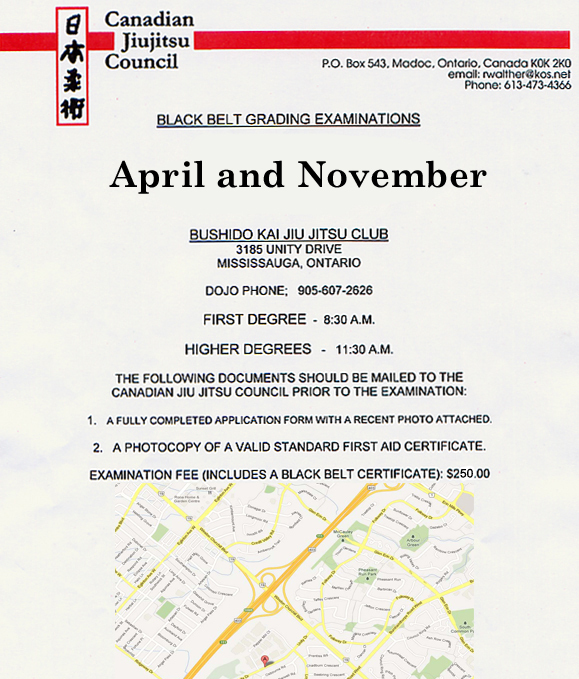 Congratulations to the following candidates for passing the Canadian Jiu Jitsu Council Black Belt exams held in Mississauga, Ontario today - Dylan Atreo - 1st Degree Black Belt (Sensei Vince Viele, Instructor). 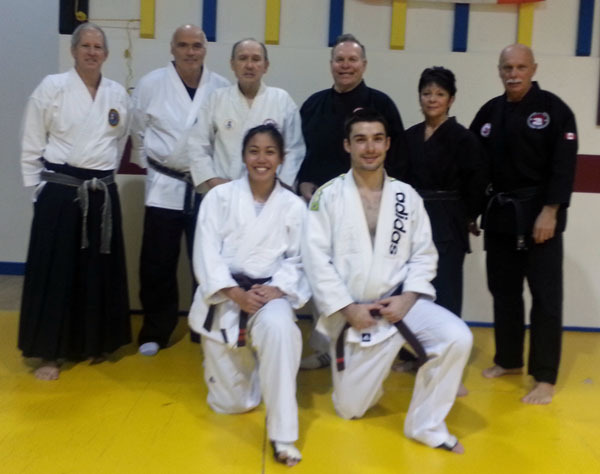 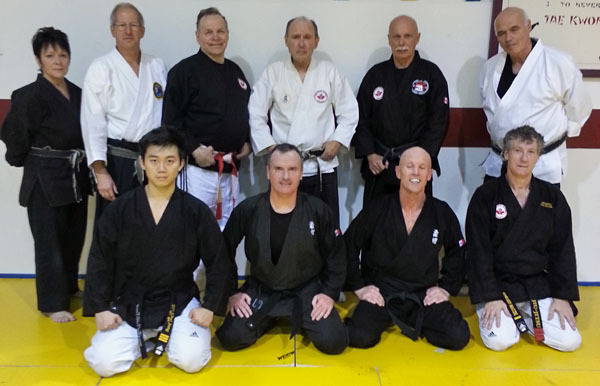 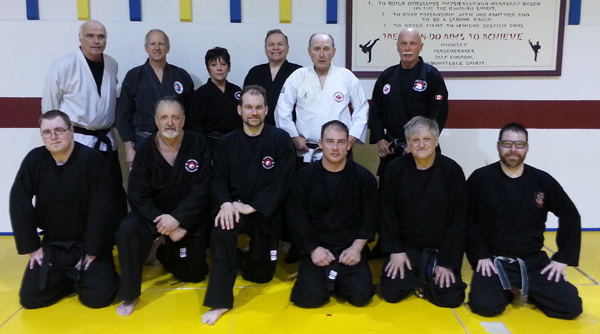 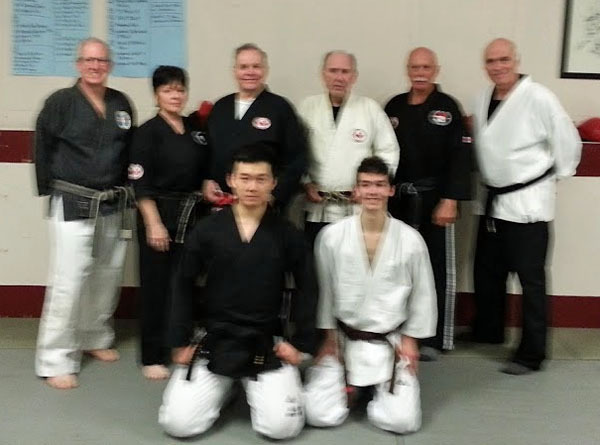 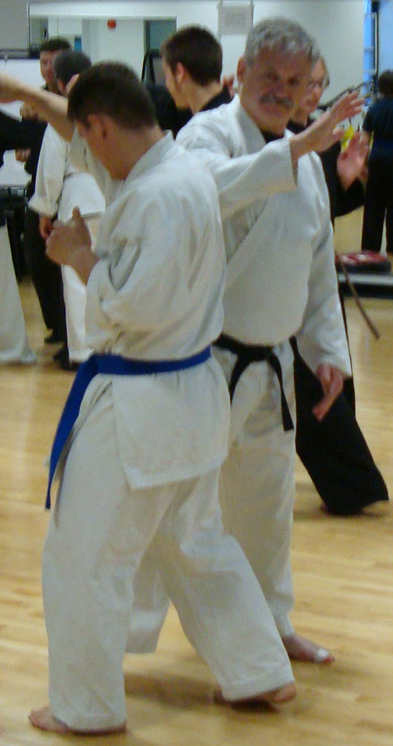 Won Chul Jung - 4th Degree Black Belt (Sensei Vince Viele, Instructor). 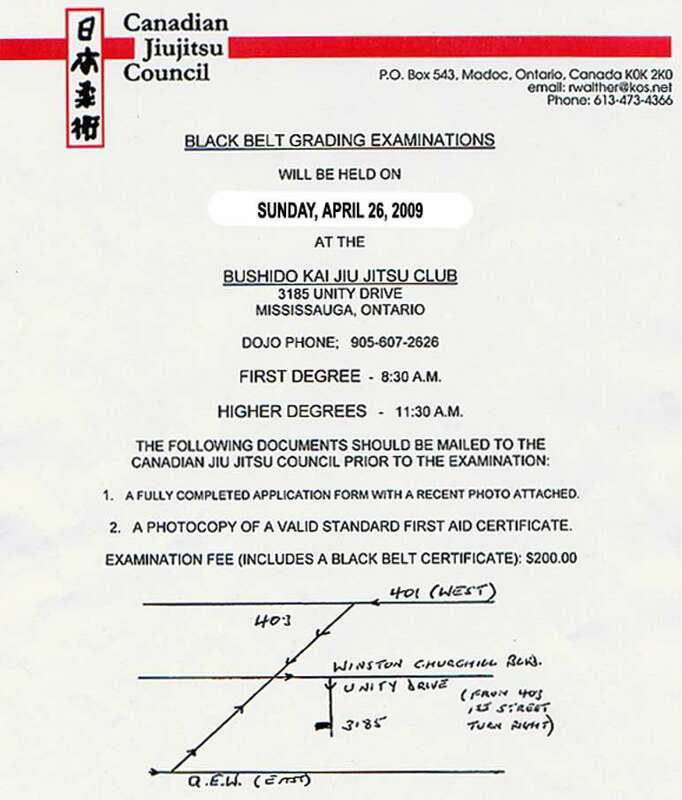 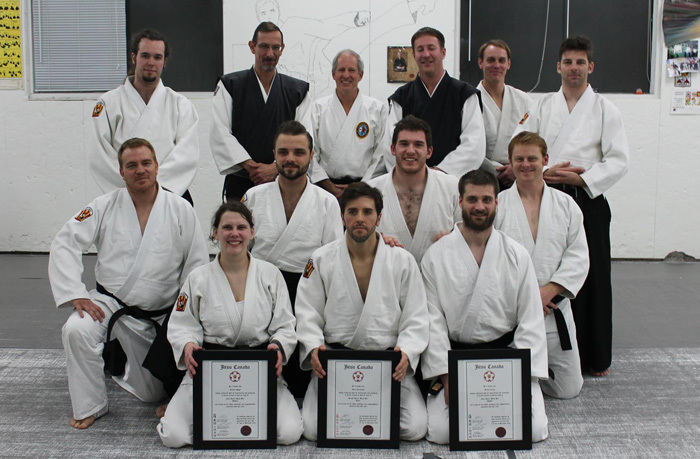 we have returned to the original type of exam as they were first conducted by Shihan Forrester - tough, demanding,and with a sound knowledge of biomechanics. 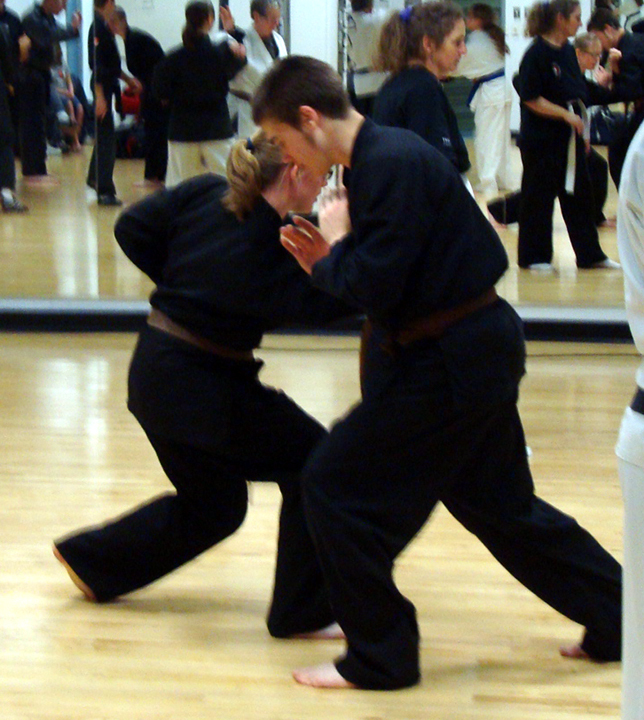 Candidates must be able to demonstrate not just the step by step fundamentals of a technique but be able to utilize that technique in a variety of situations. 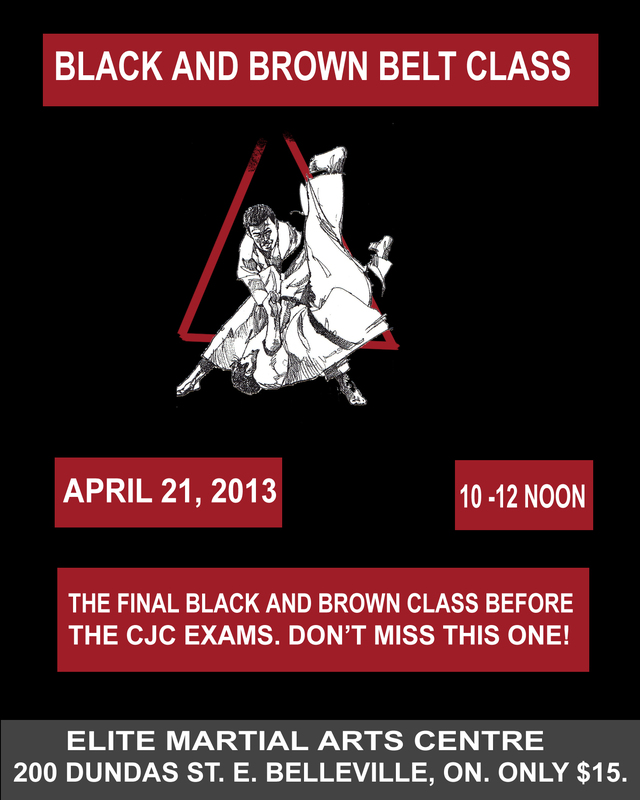 We would like all candidates and their instructors to maintain the high standards for which the CJC is renowned. 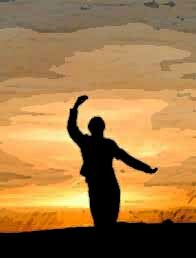 Therefore, please ensure that all candidates are fully prepared for what will be one of the most important achievements of their lives. 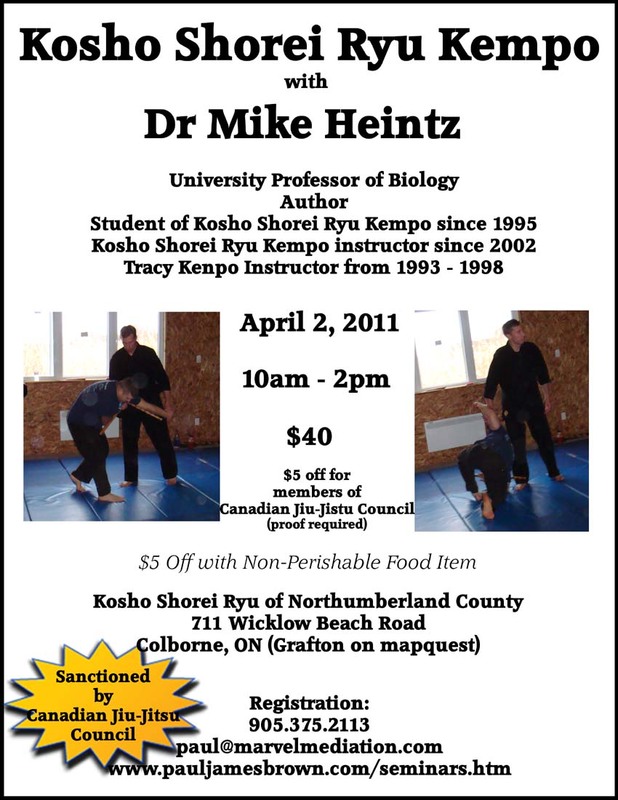 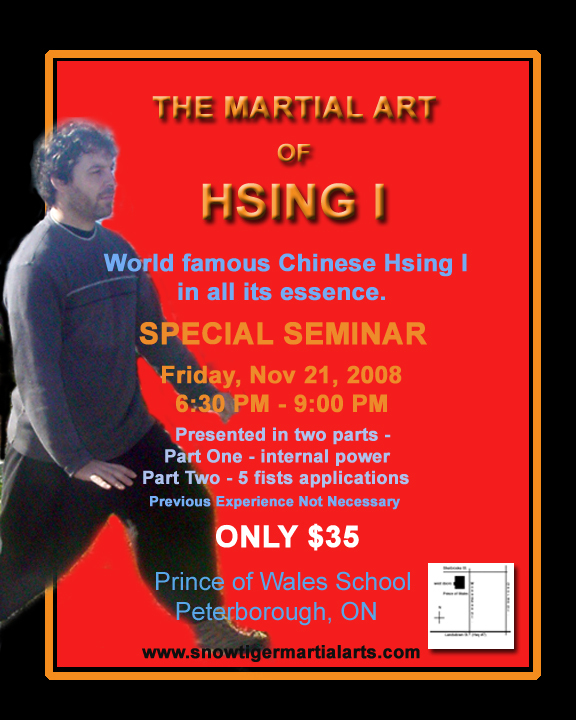 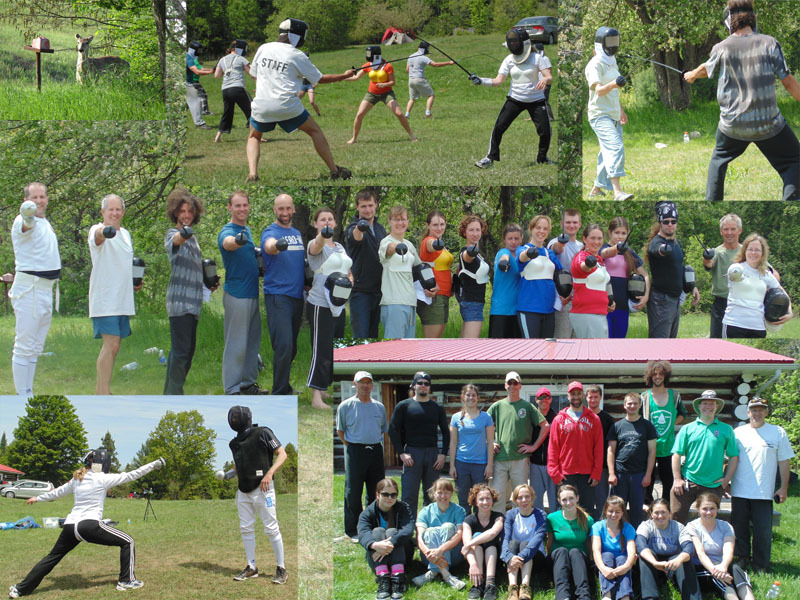 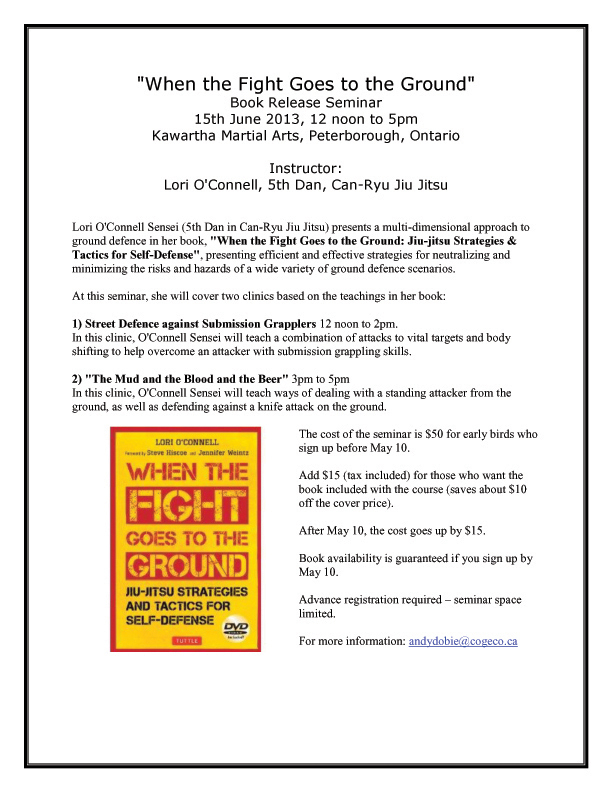 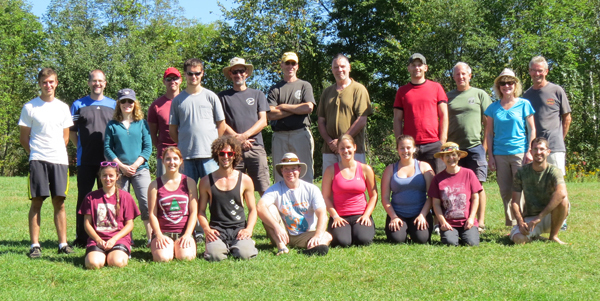 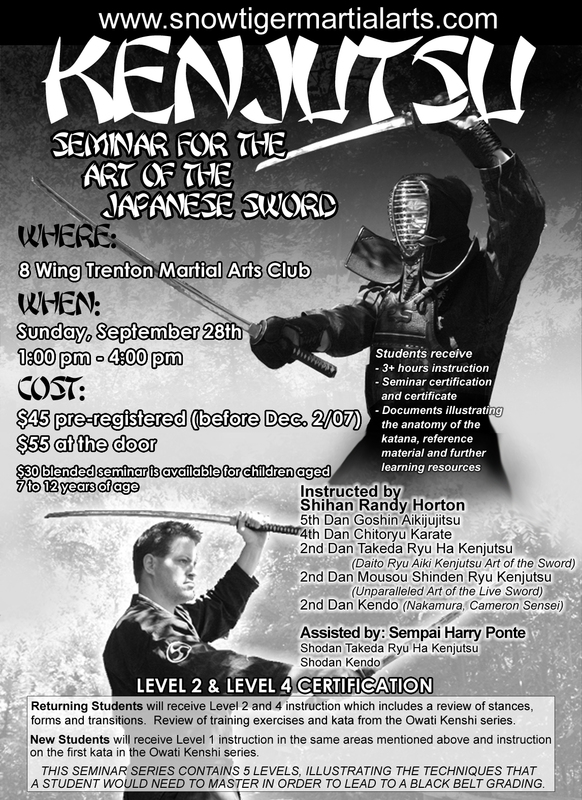 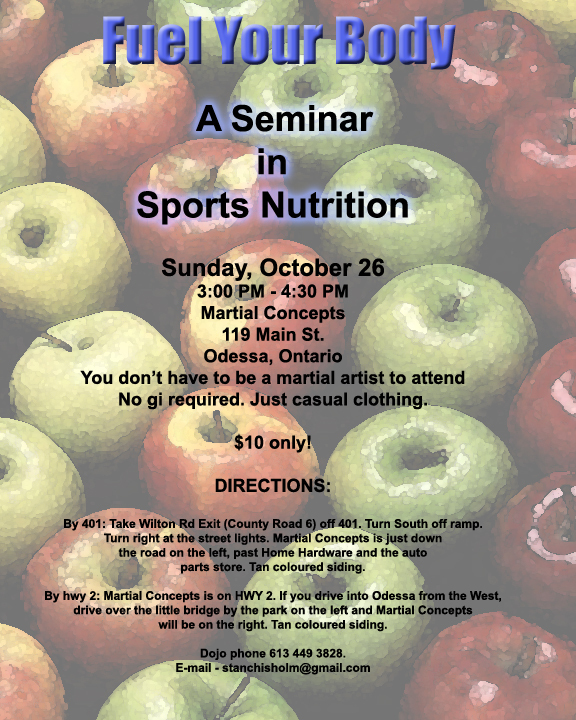 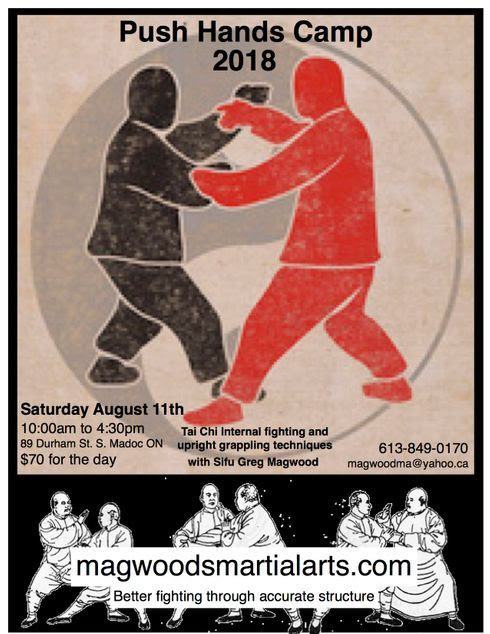 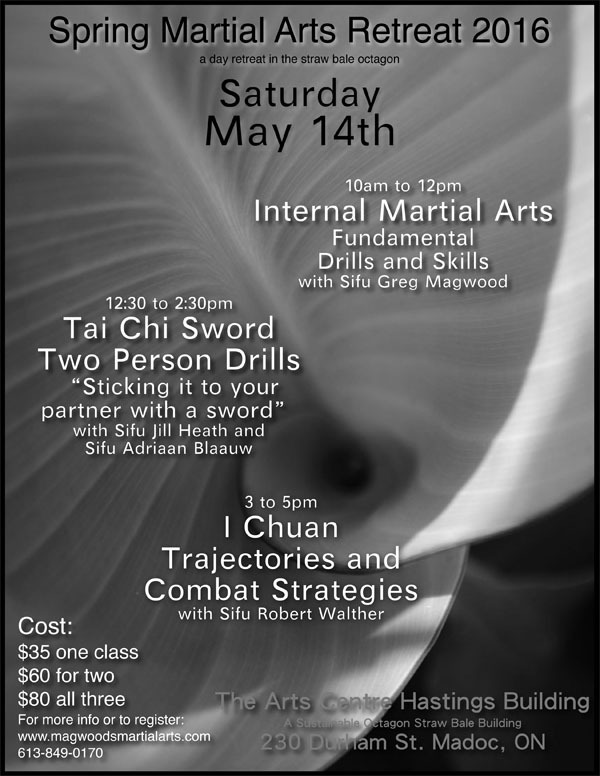 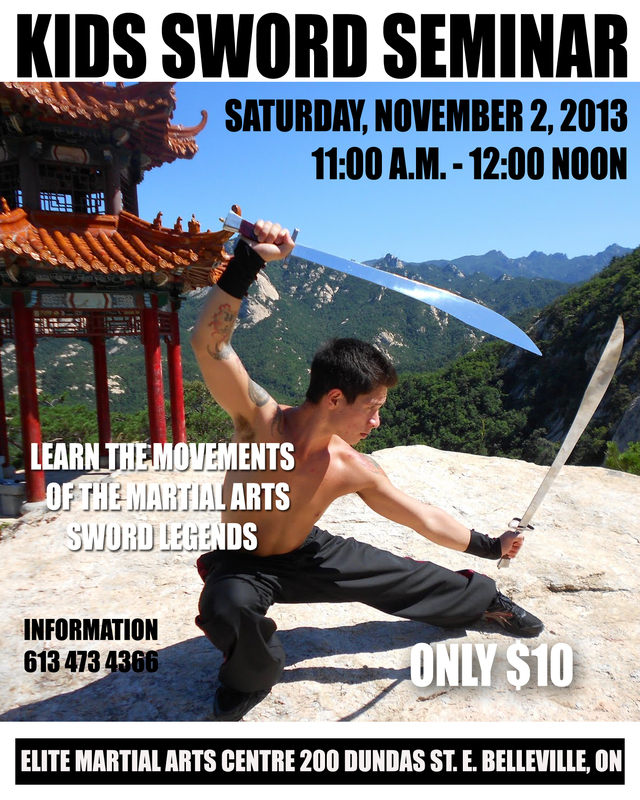 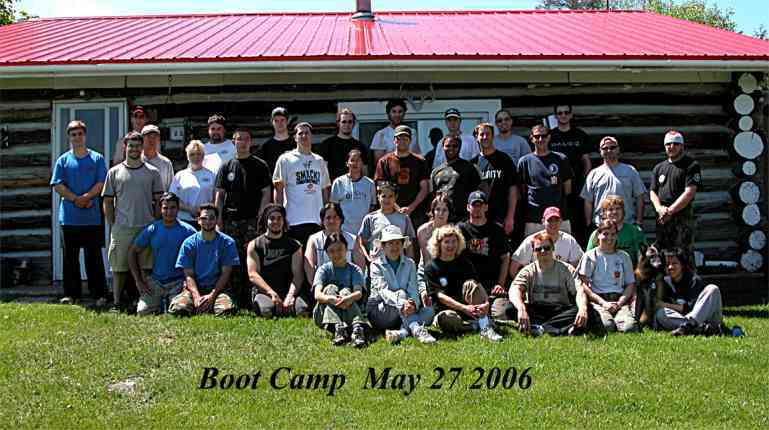 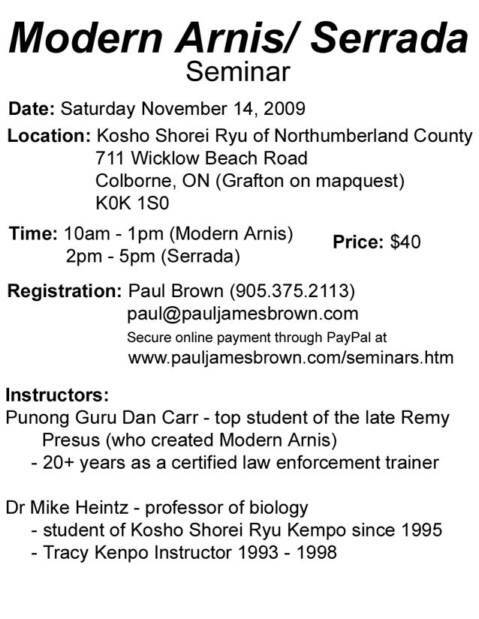 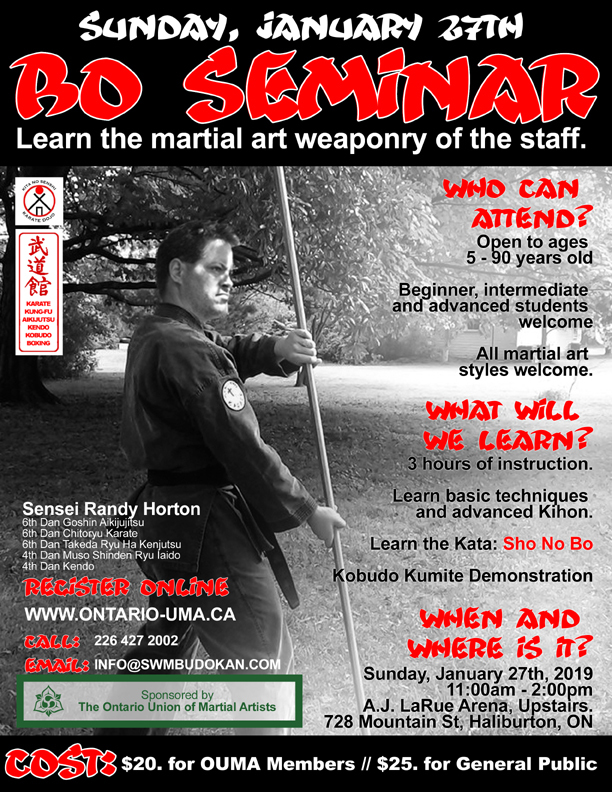 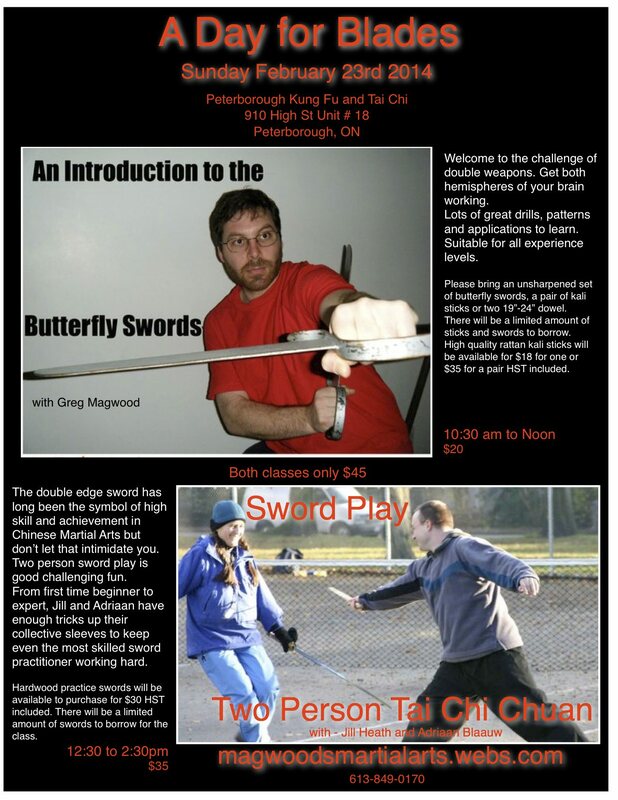 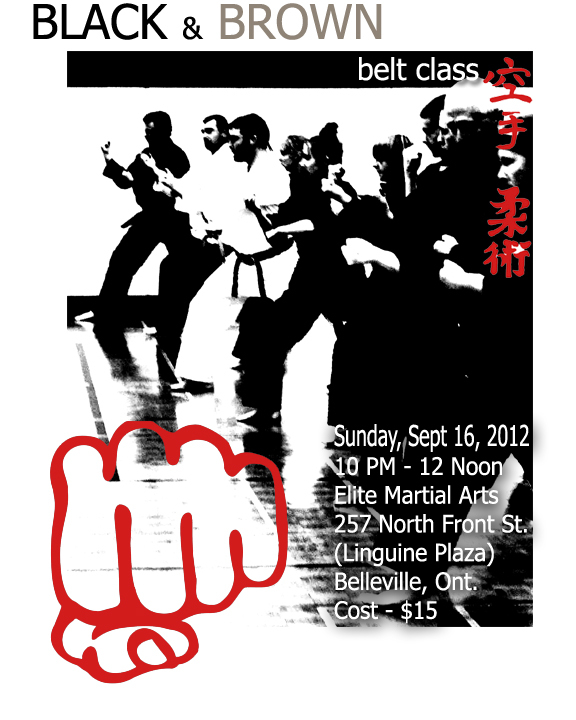 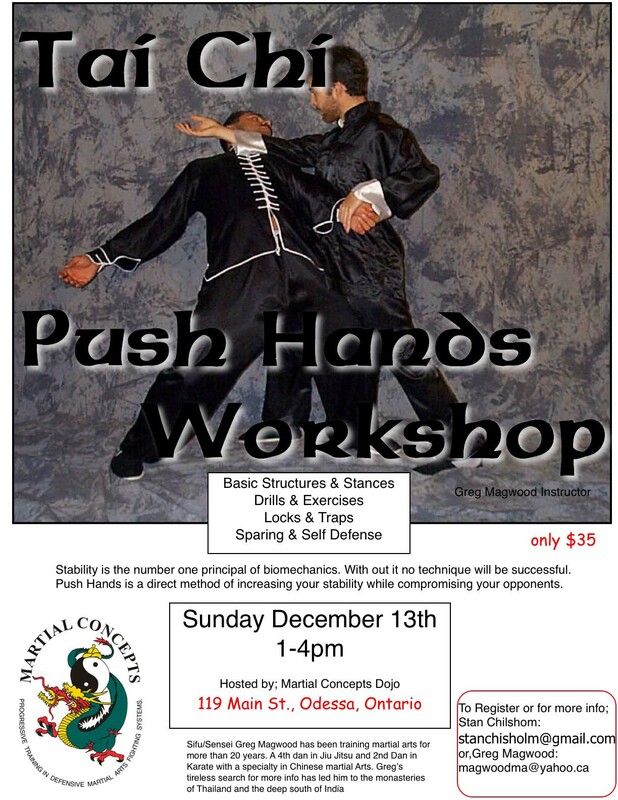 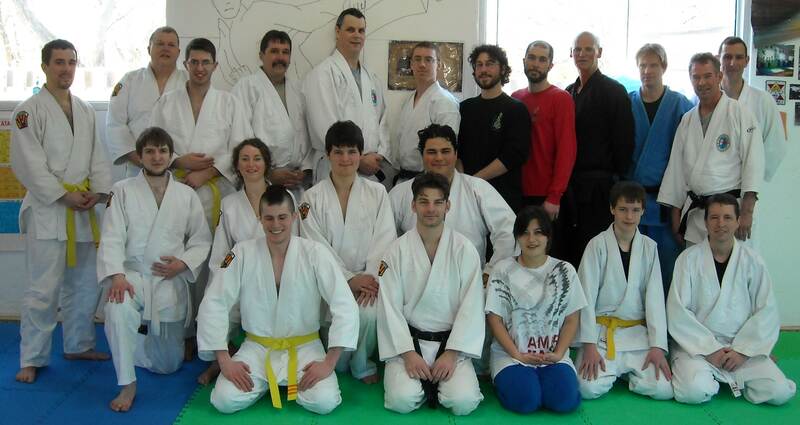 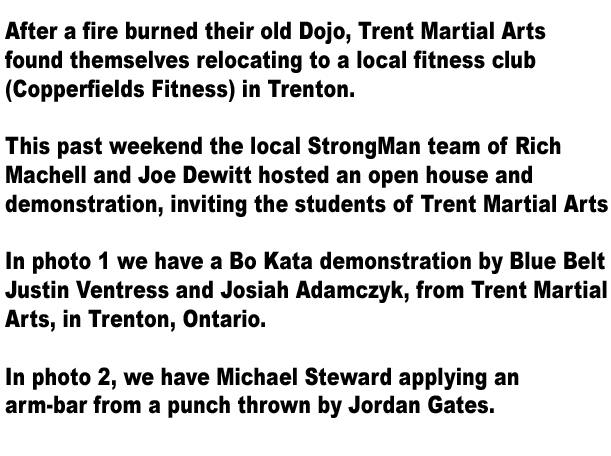 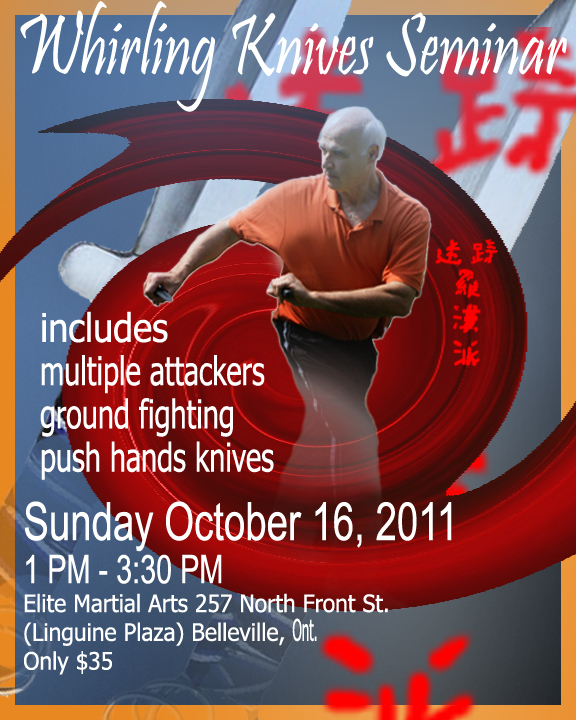 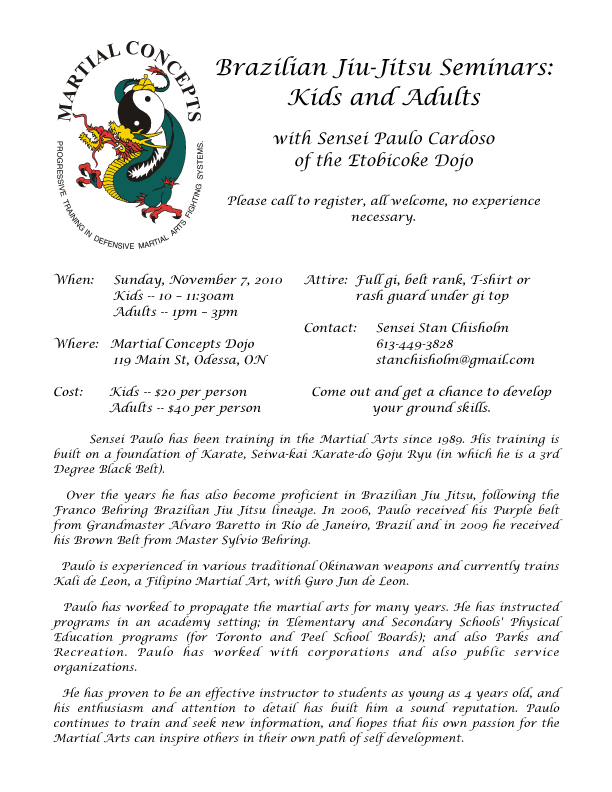 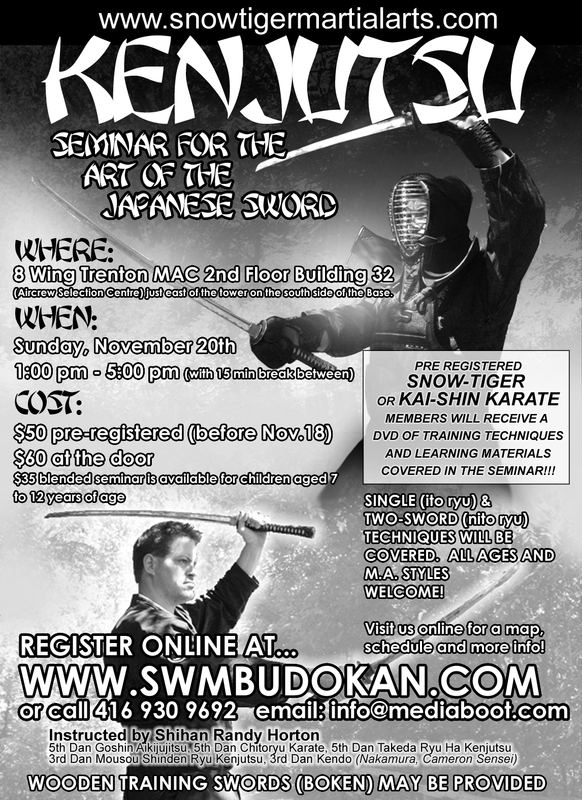 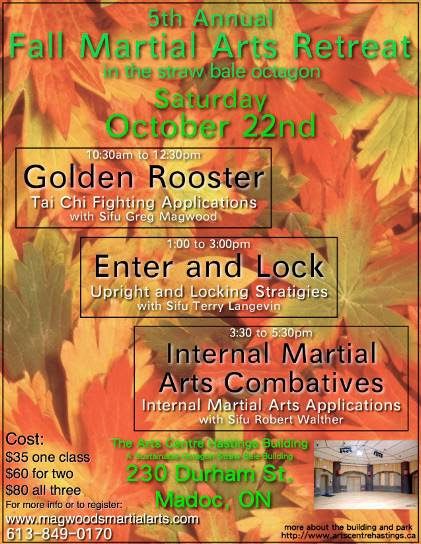 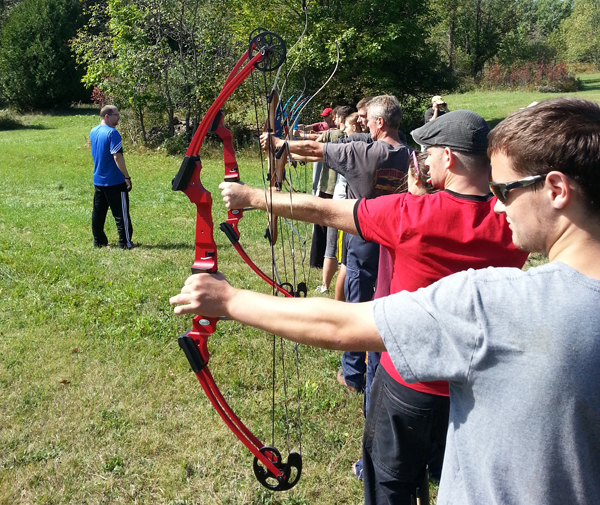 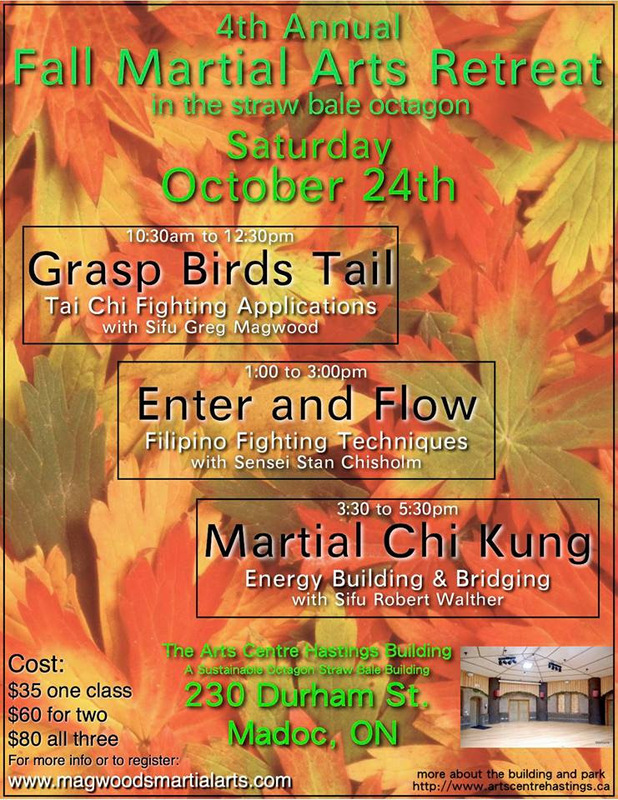 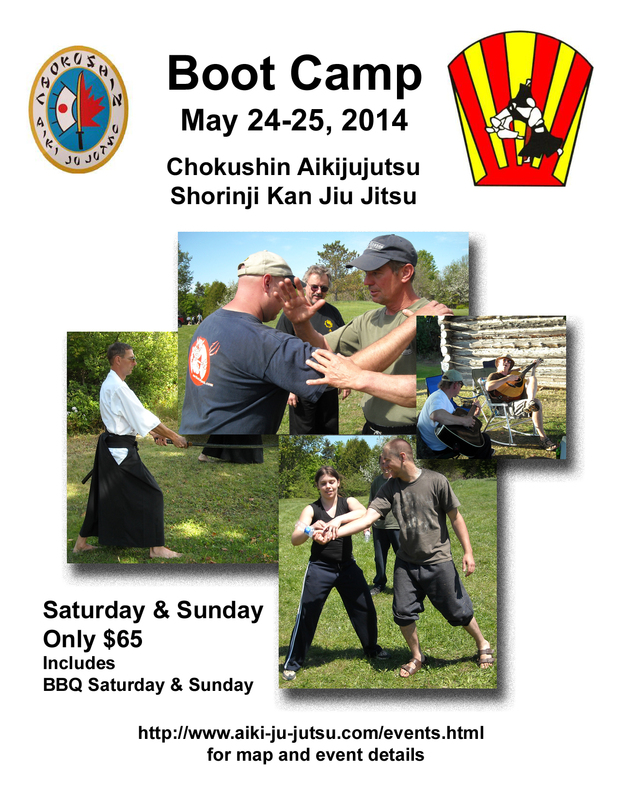 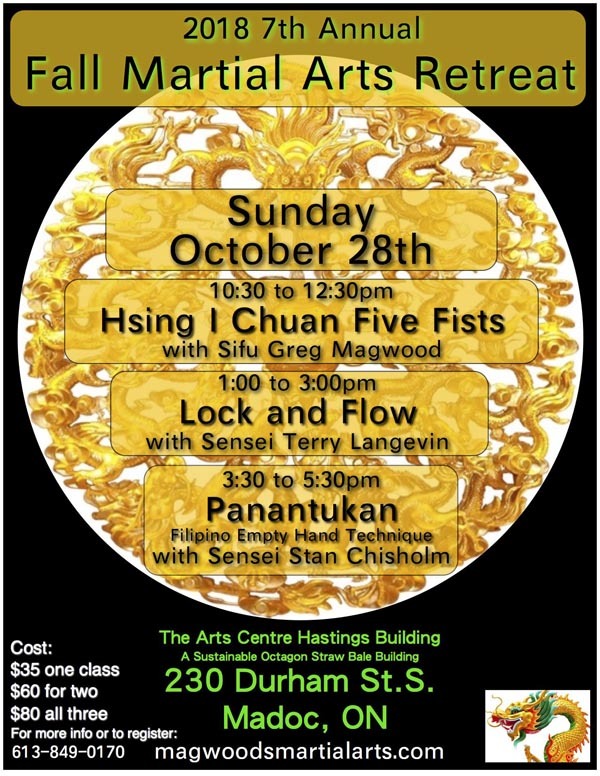 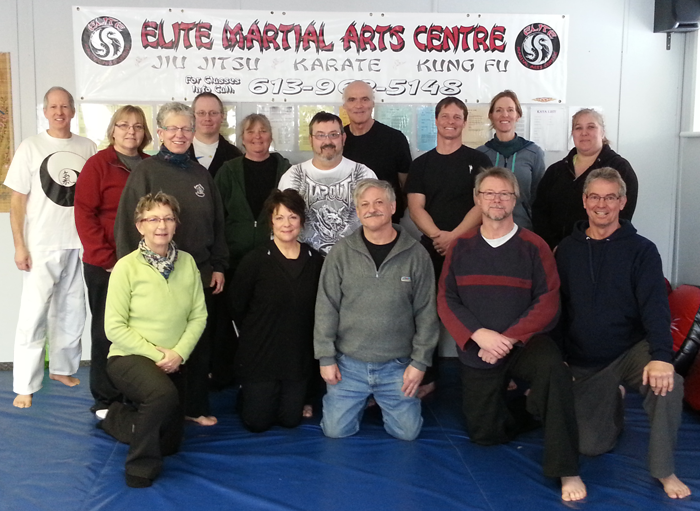 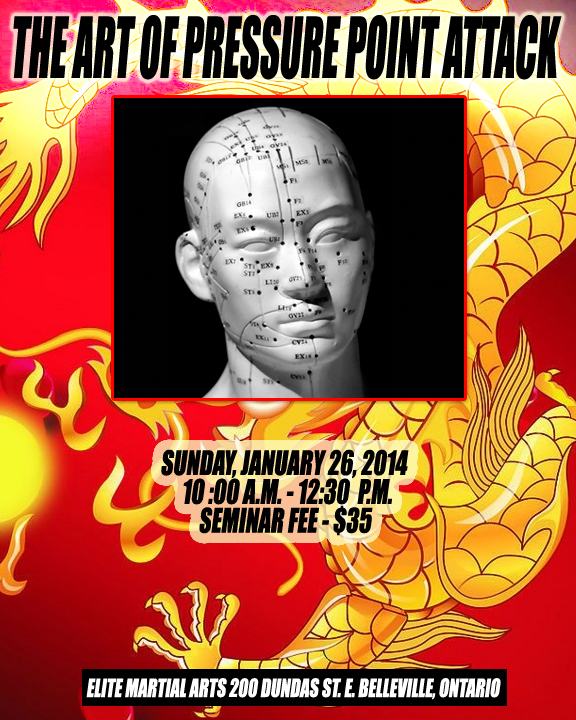 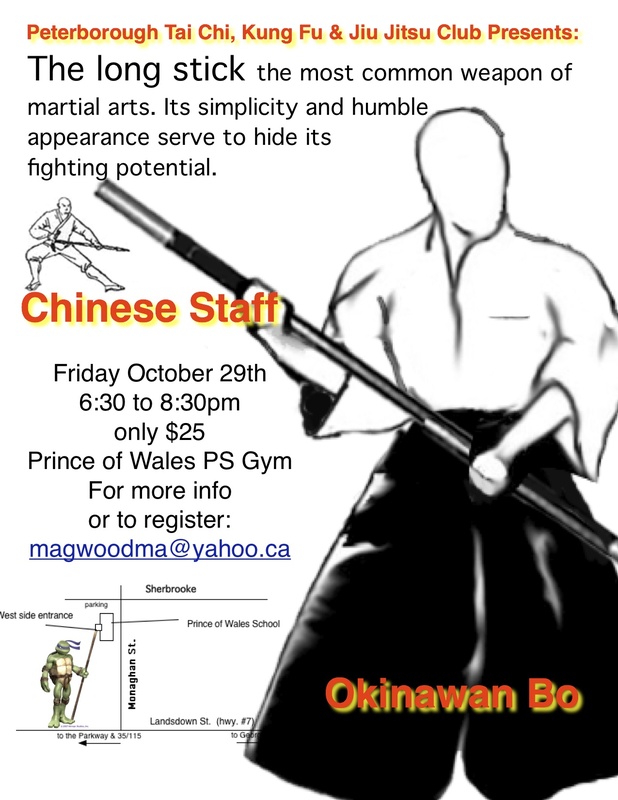 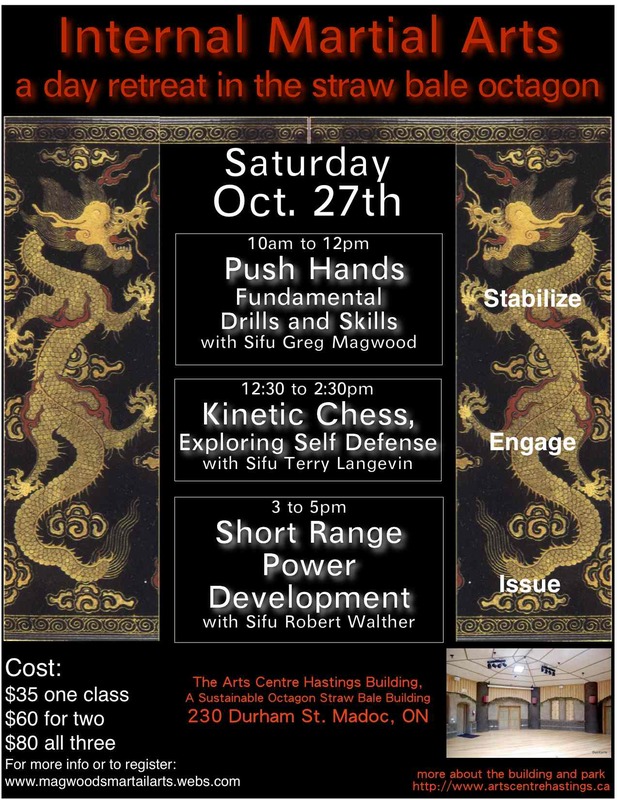 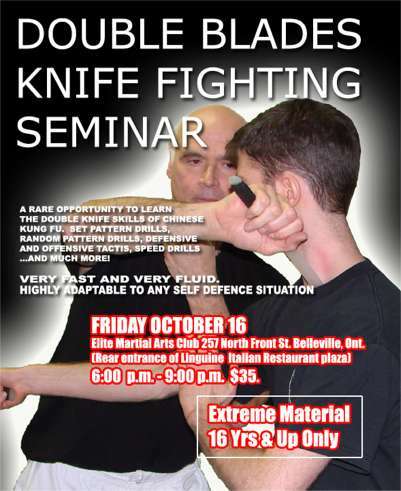 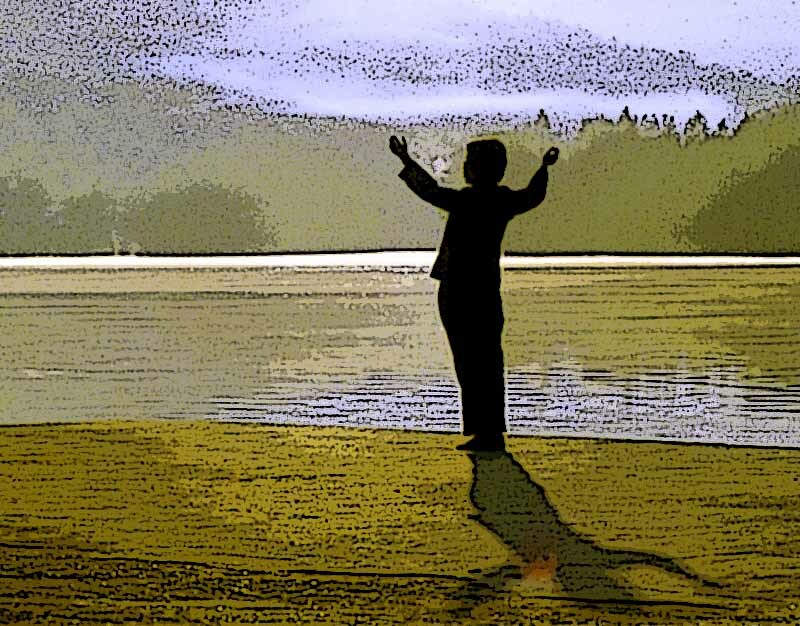 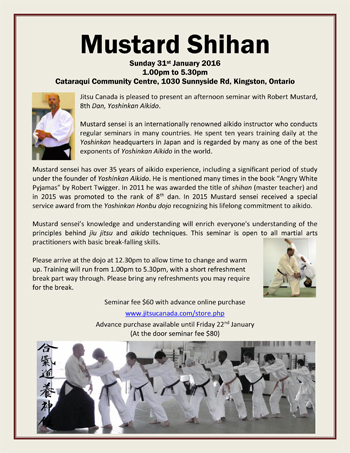 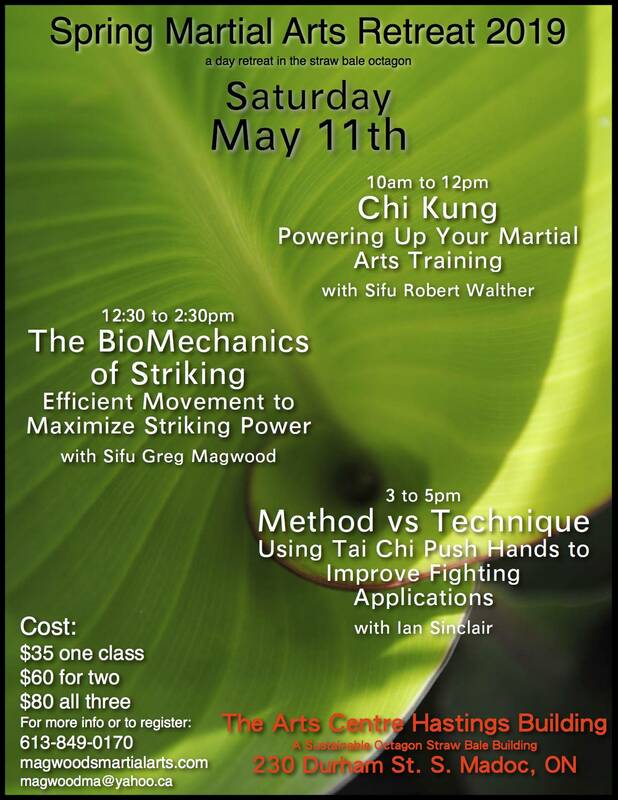 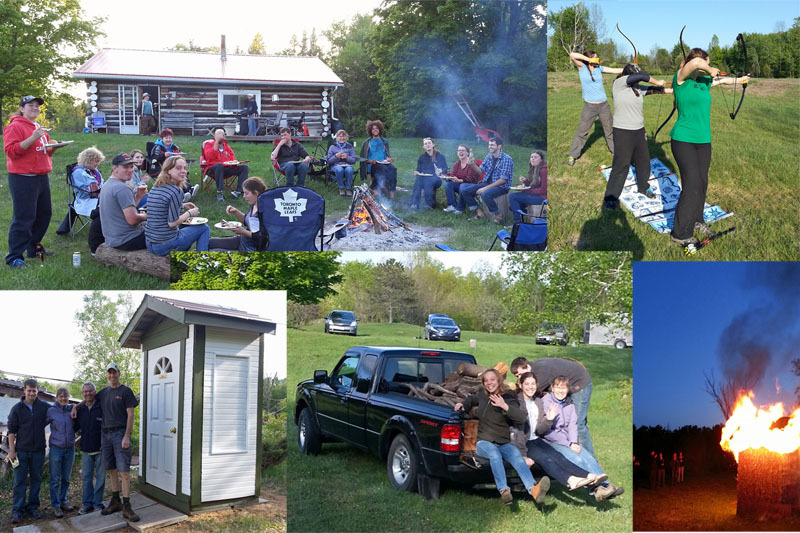 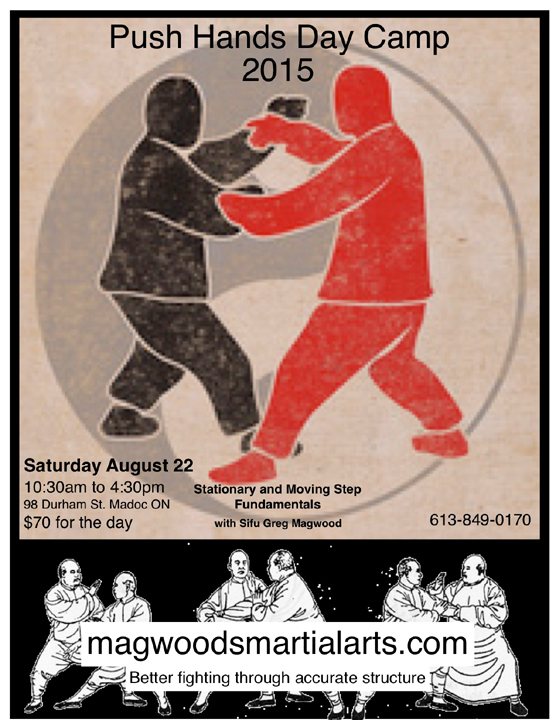 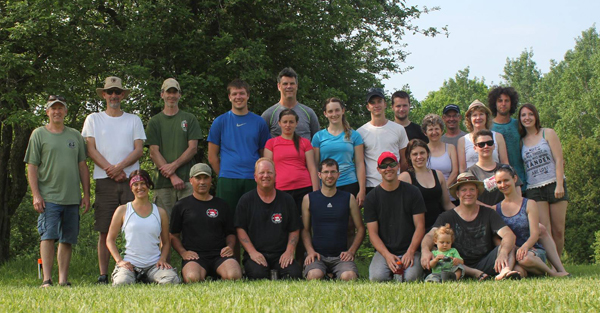 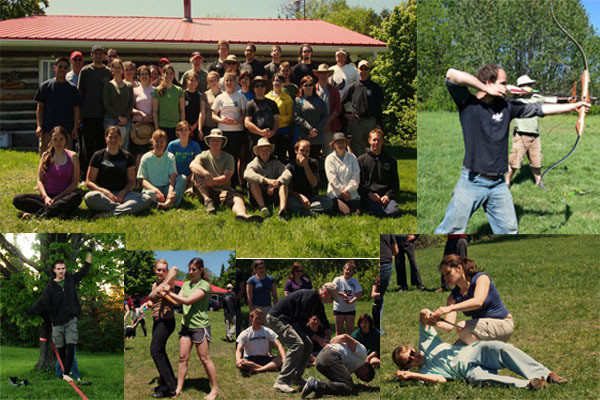 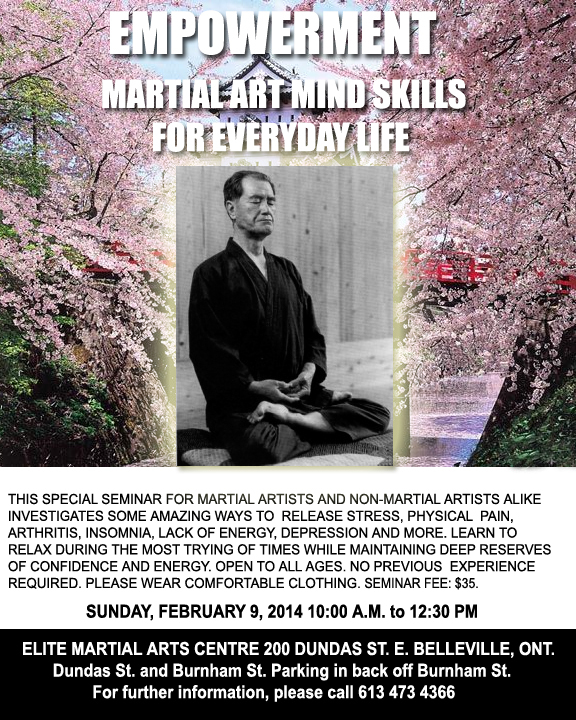 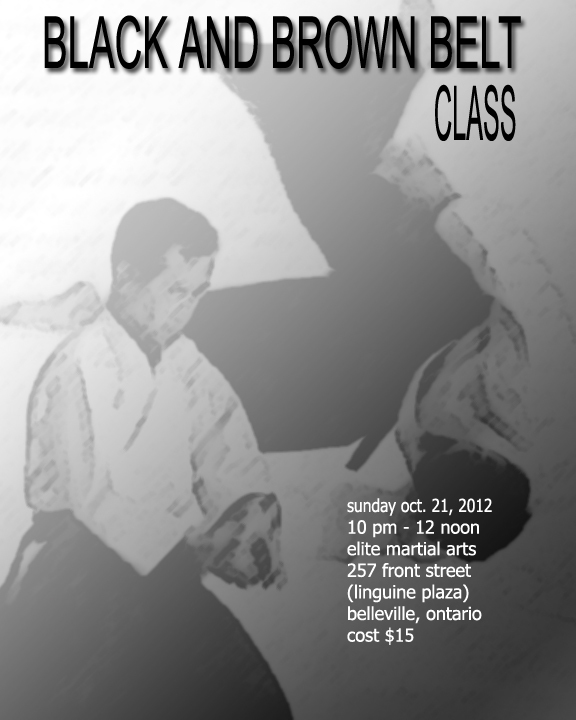 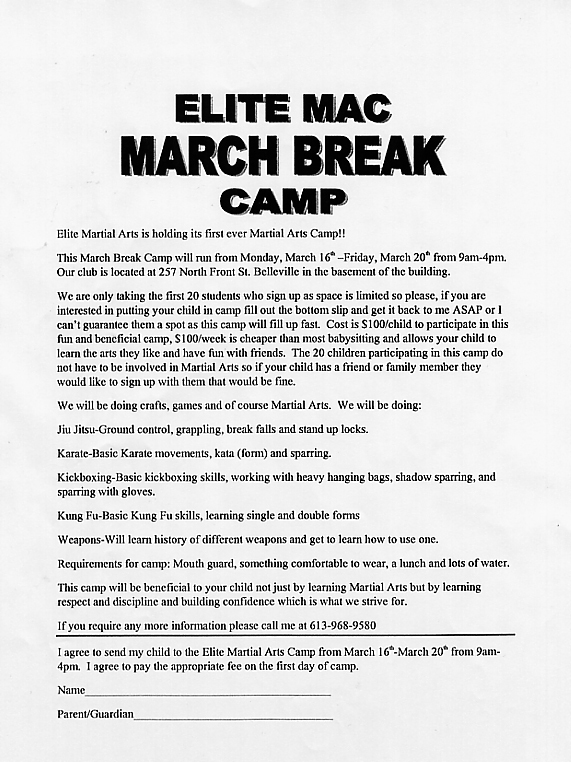 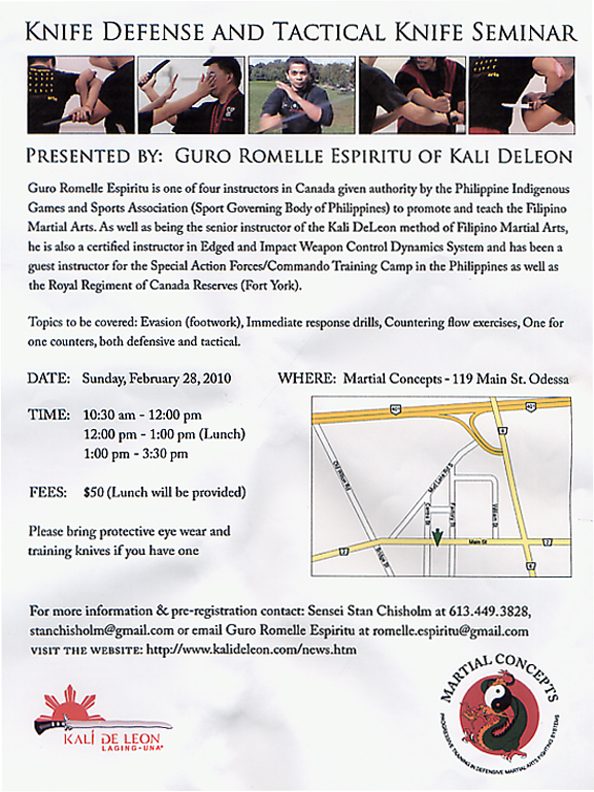 5th Annual Fall Martial Arts retreat in Madoc Ont. 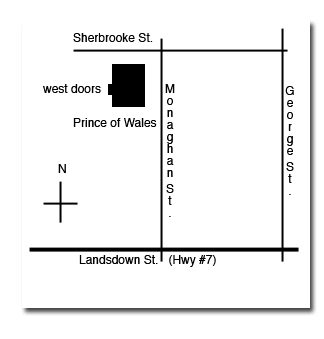 Street East in Belleville, Ontario. 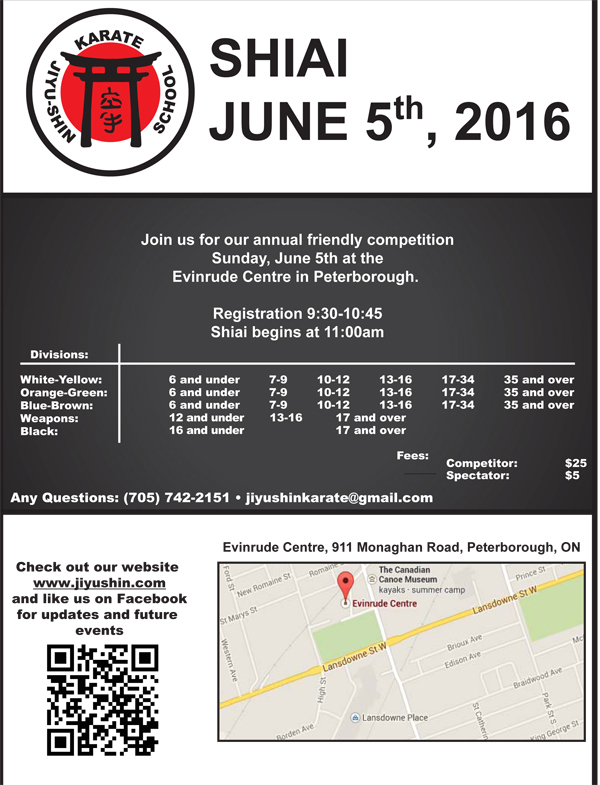 Sunday June 12, 2016 in Odessa, Ont. 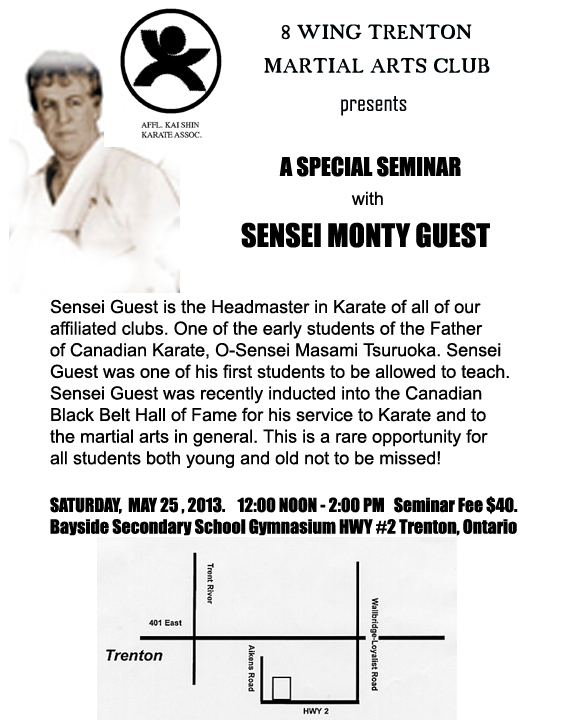 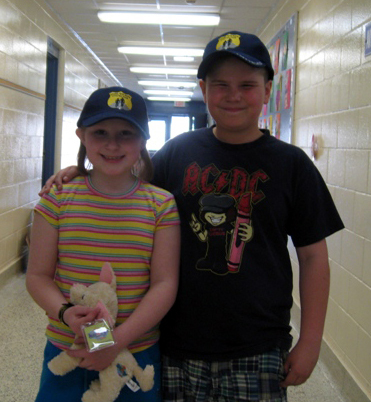 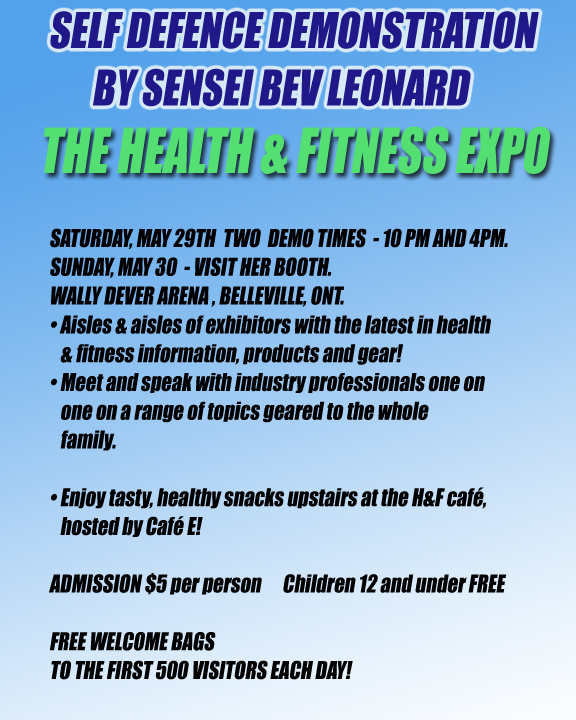 Saturday, April 30 at Bayside Secondary School in Trenton, Ontario. 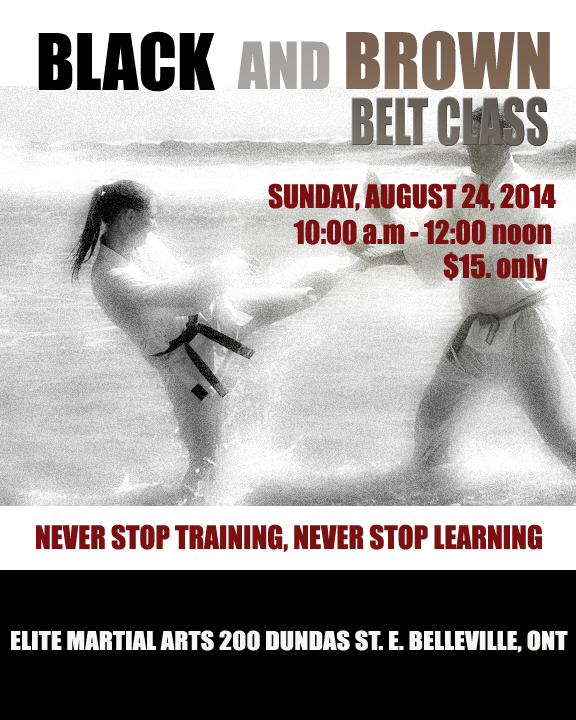 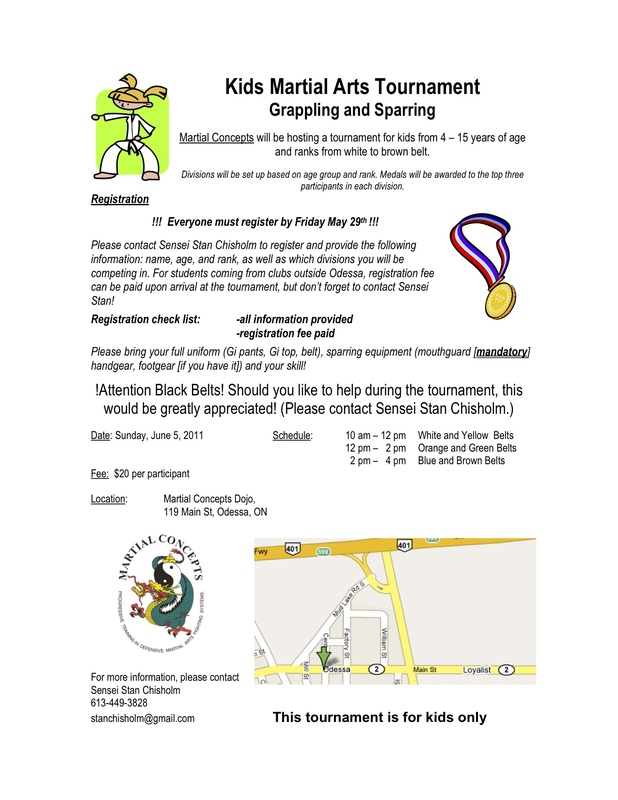 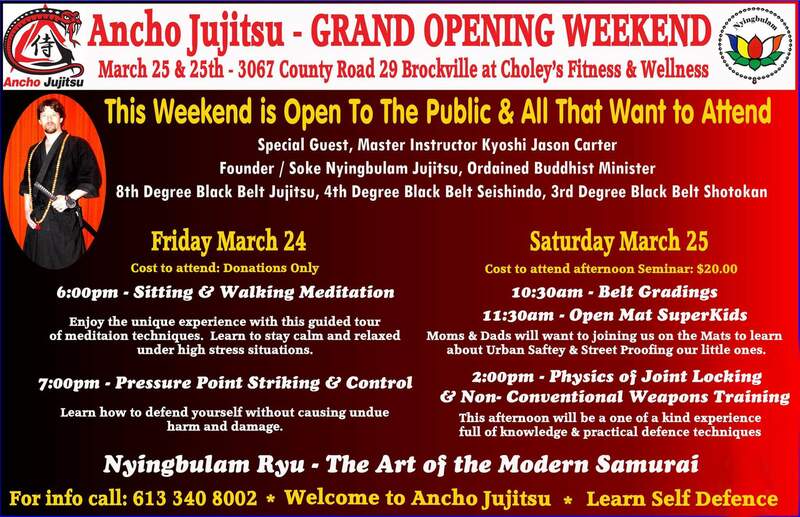 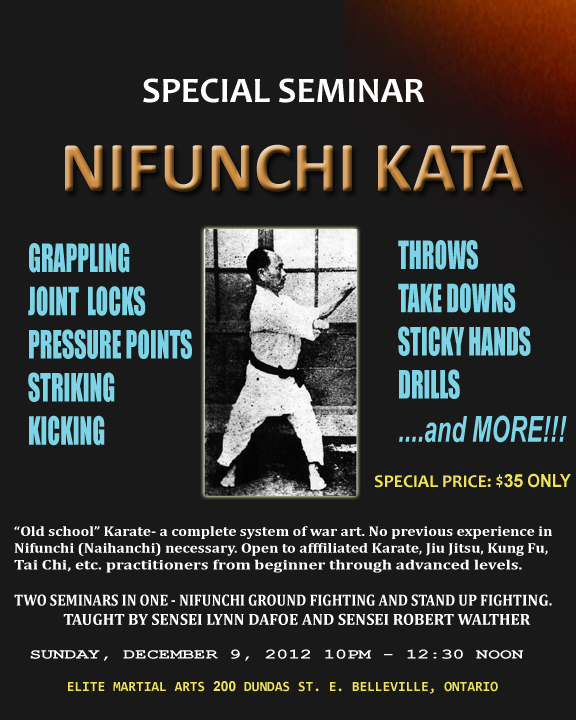 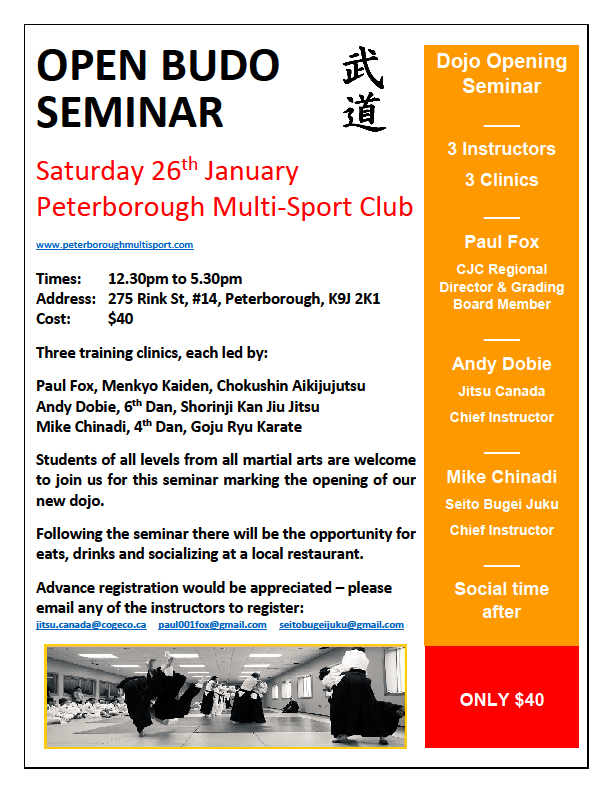 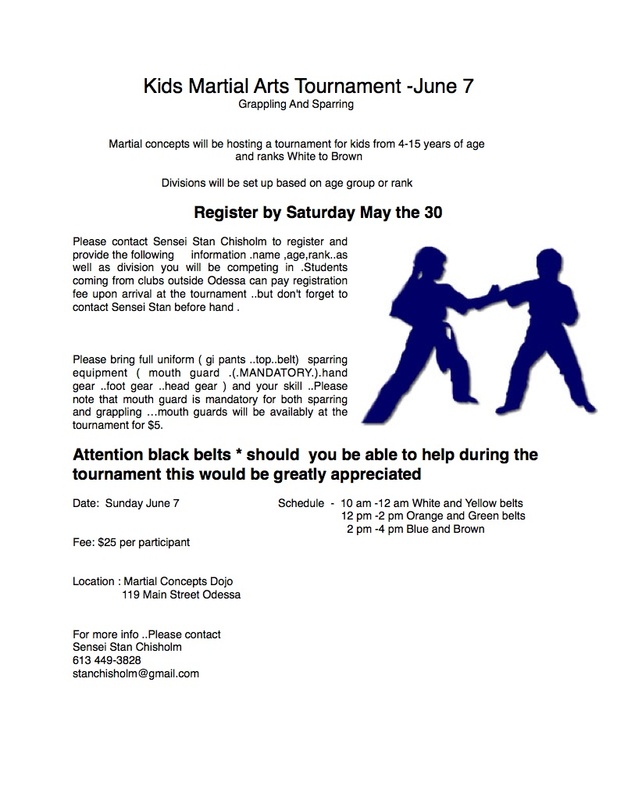 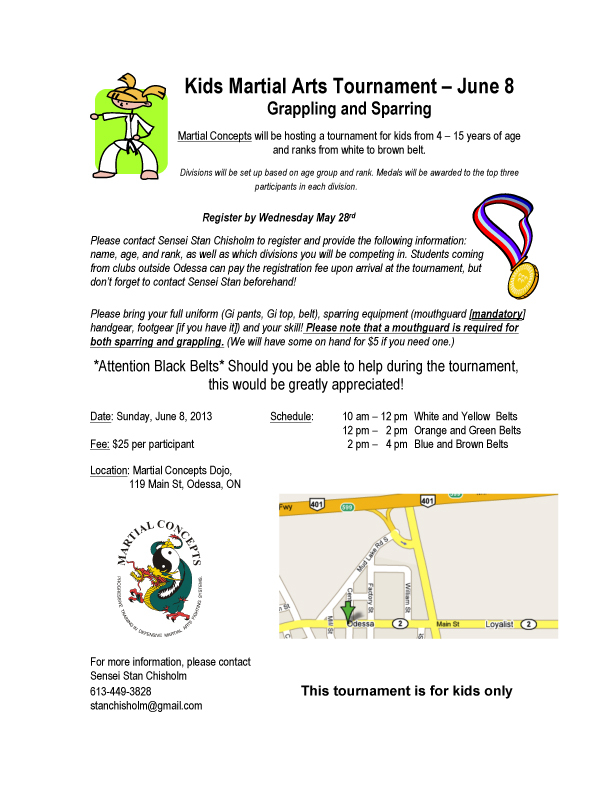 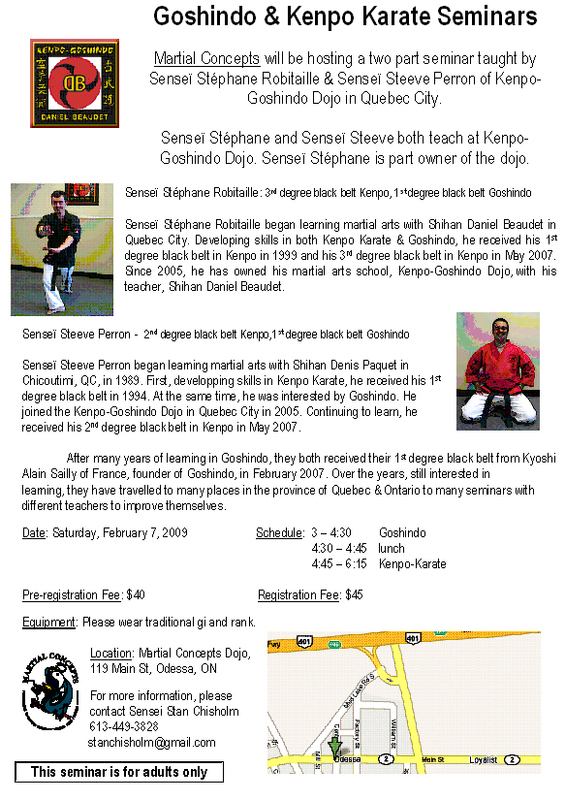 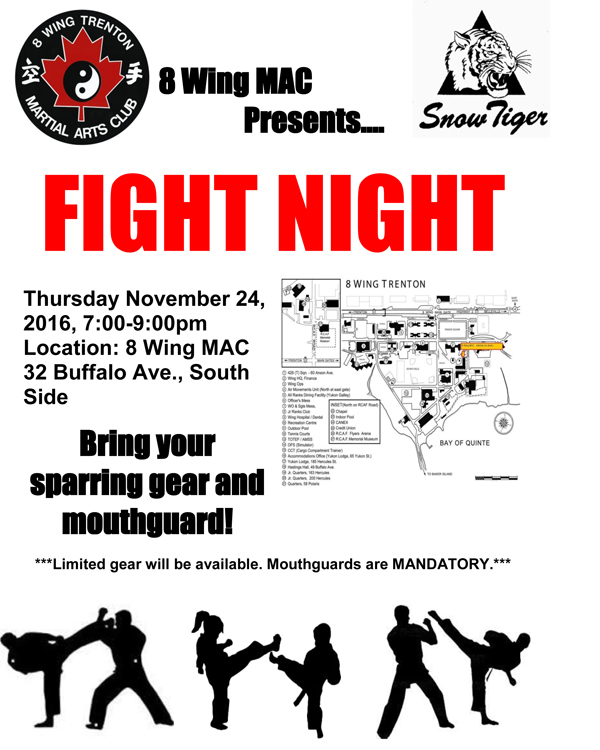 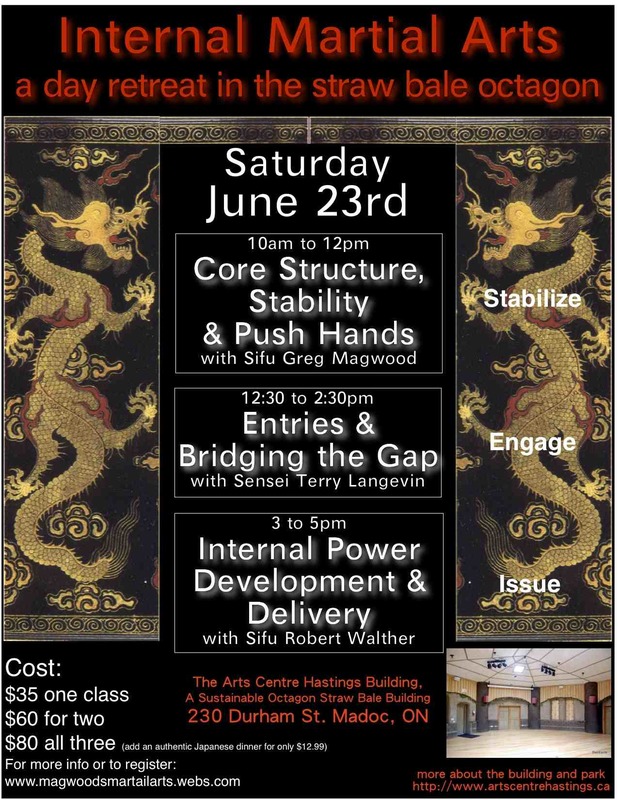 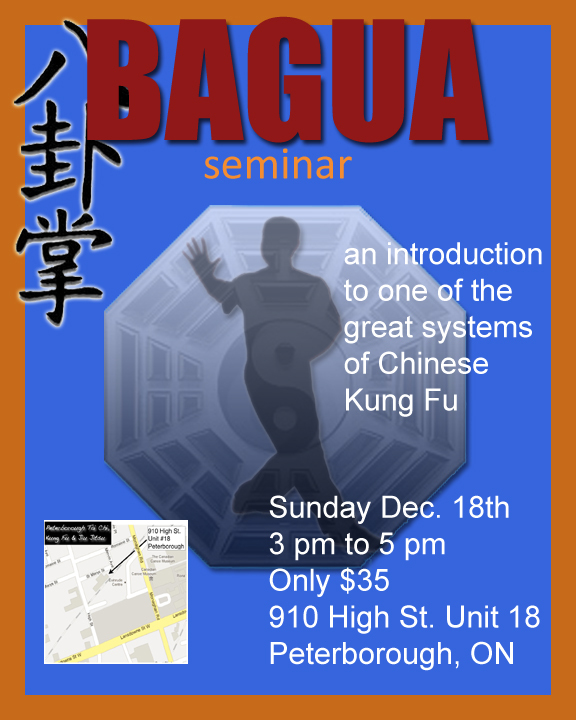 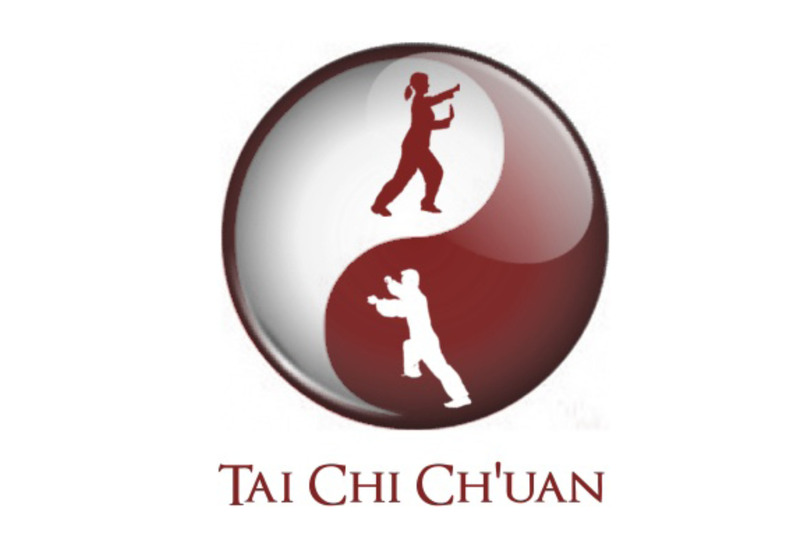 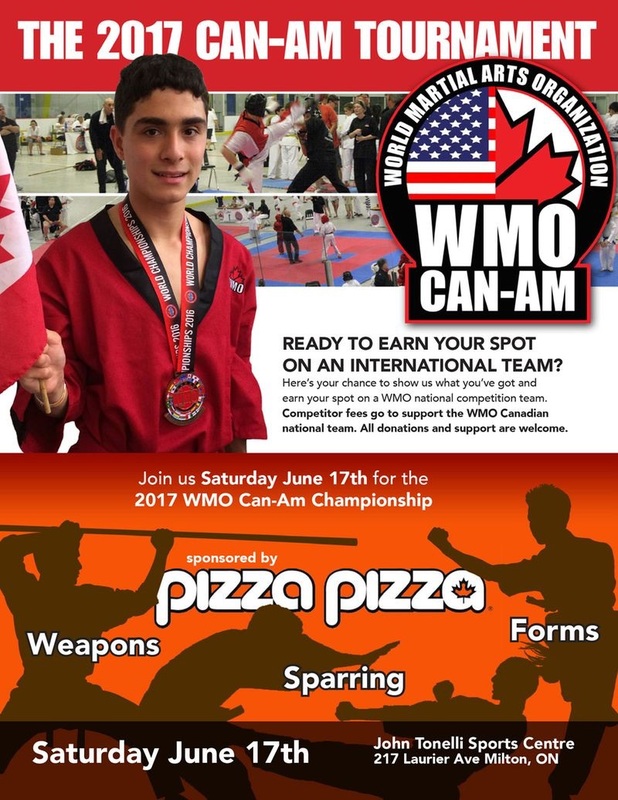 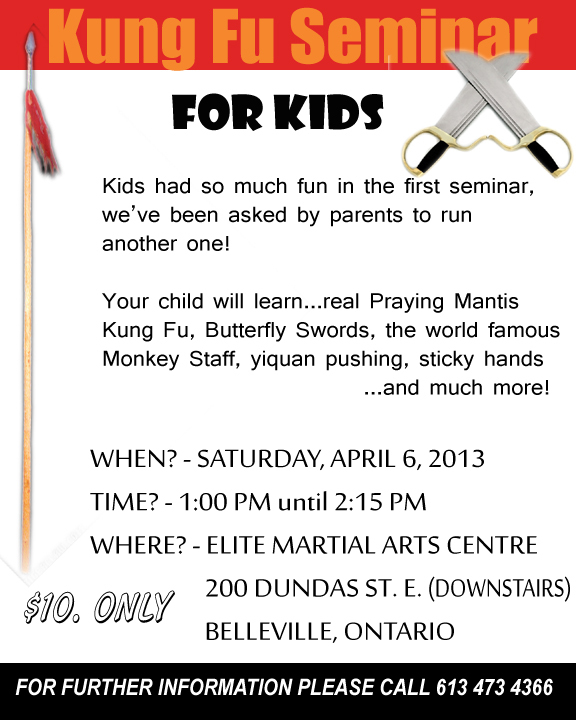 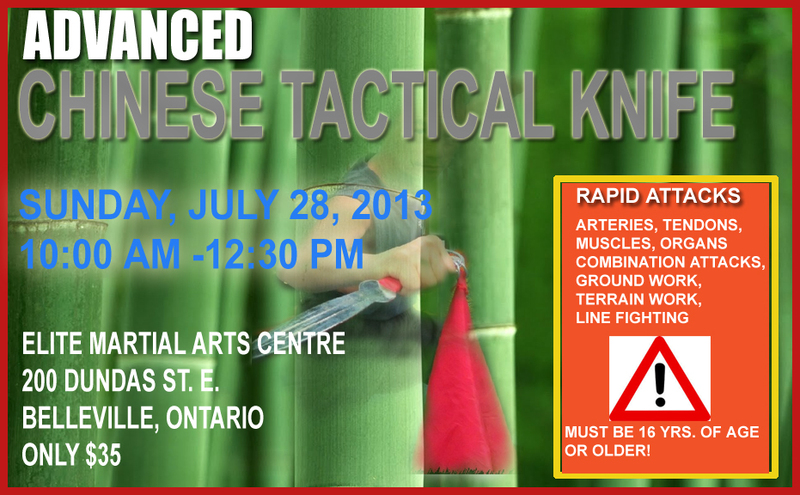 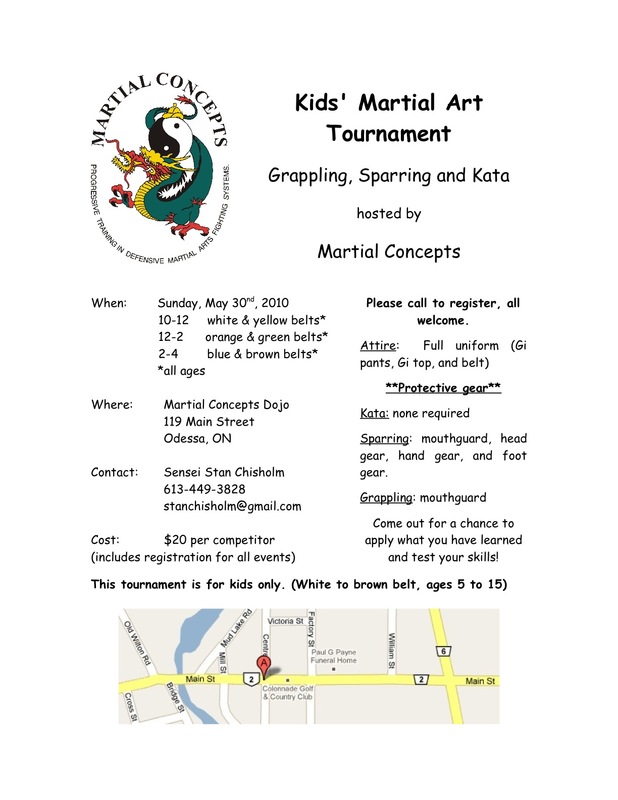 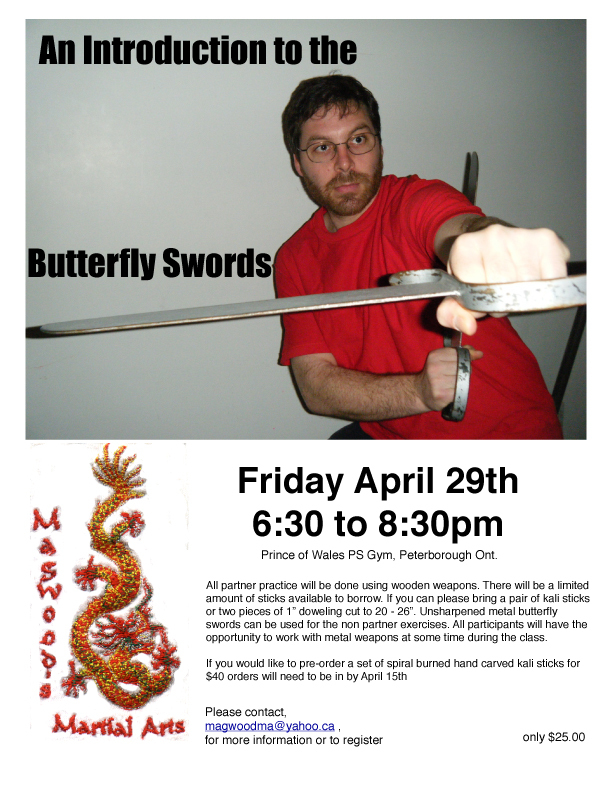 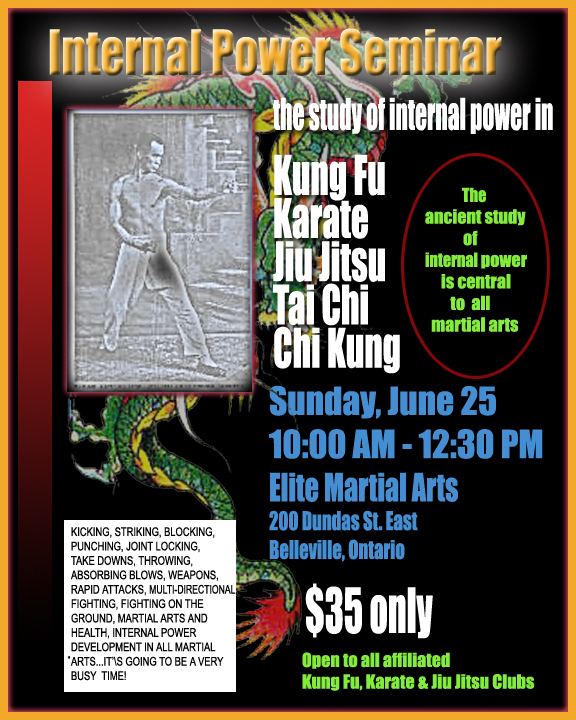 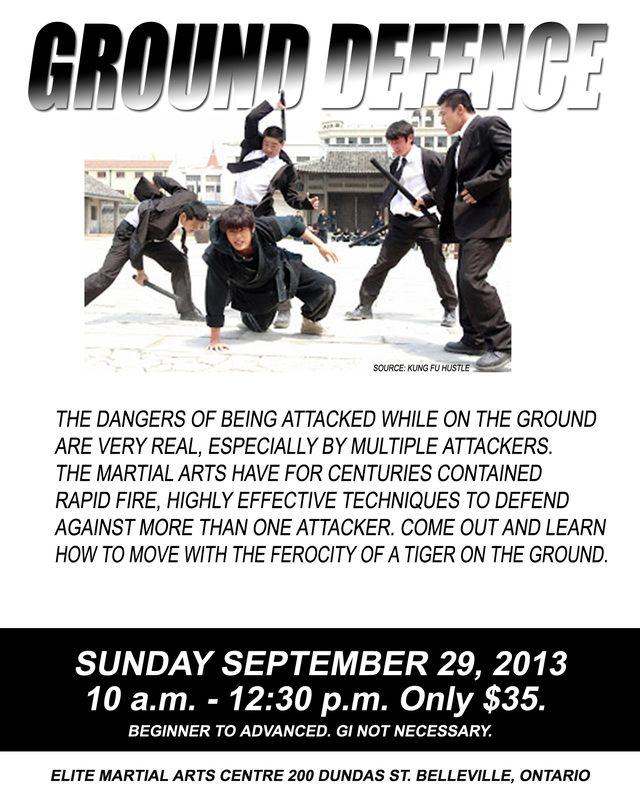 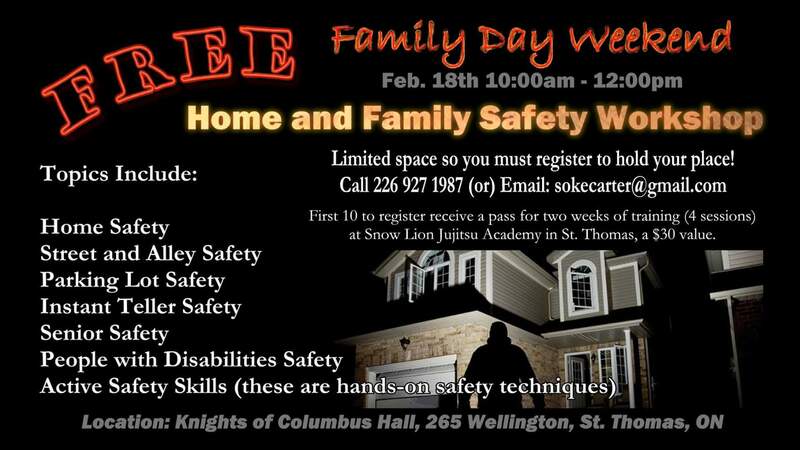 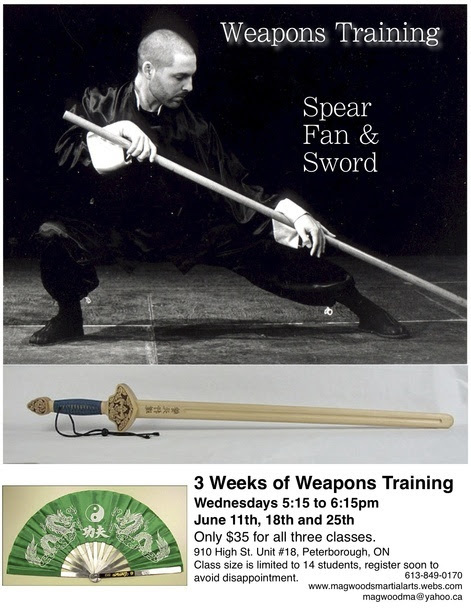 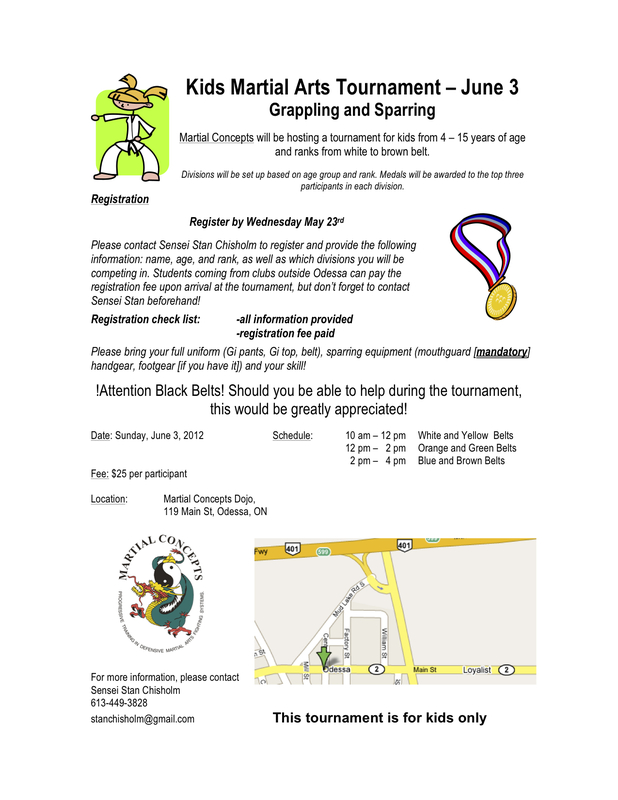 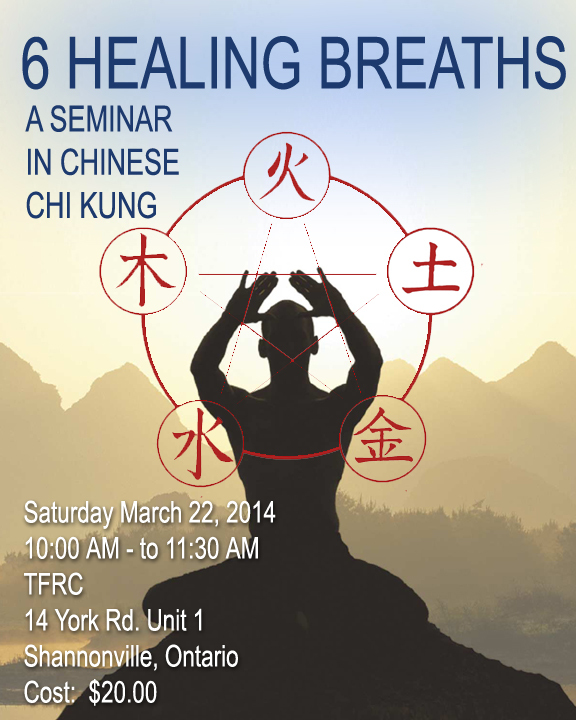 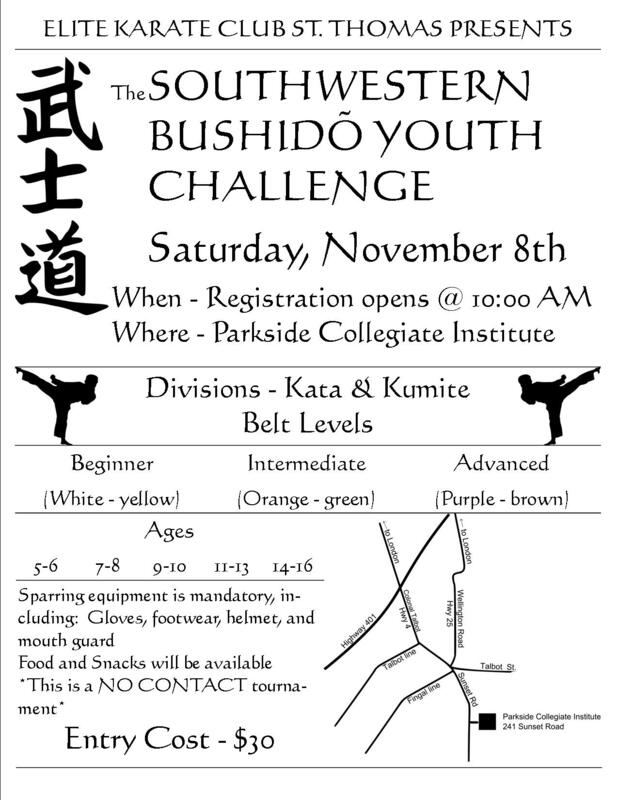 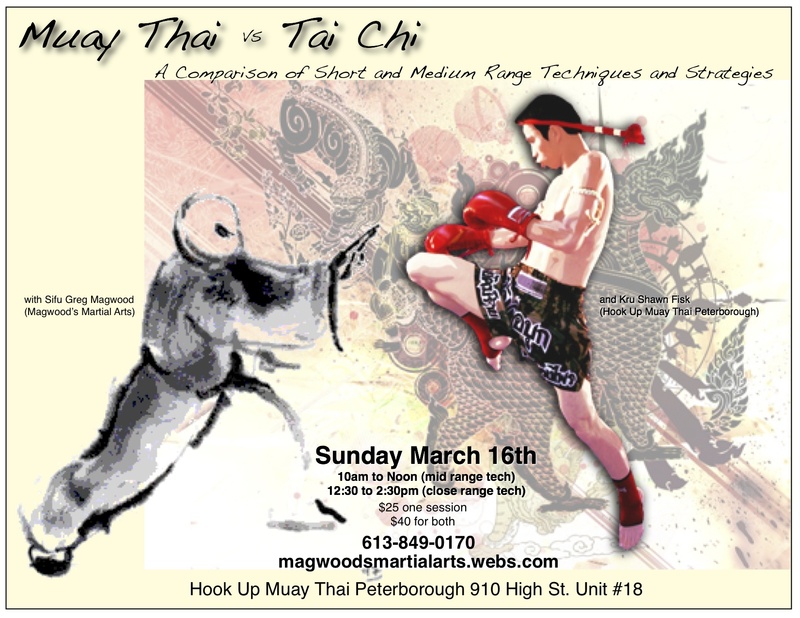 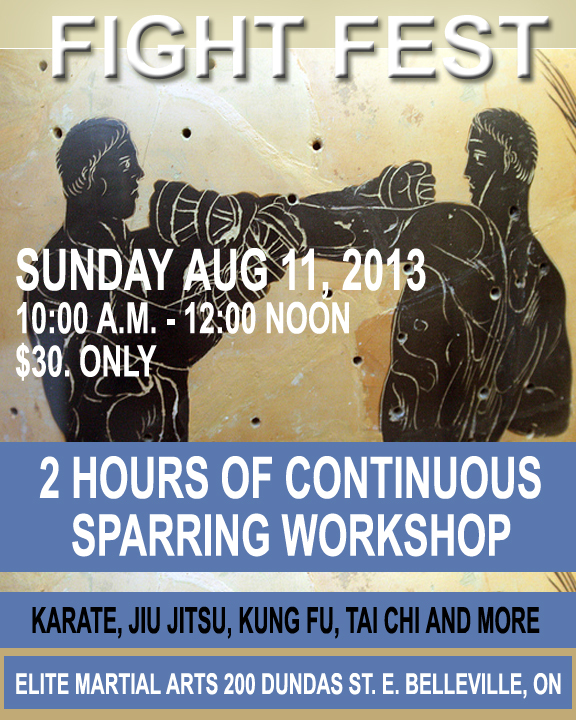 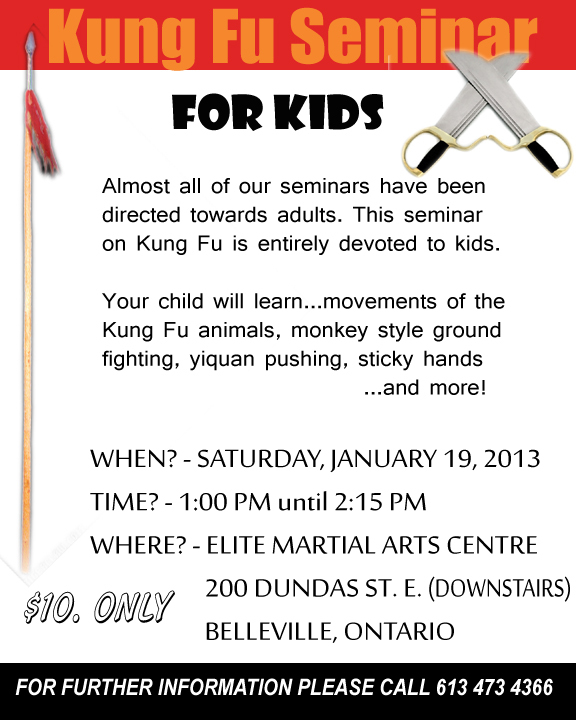 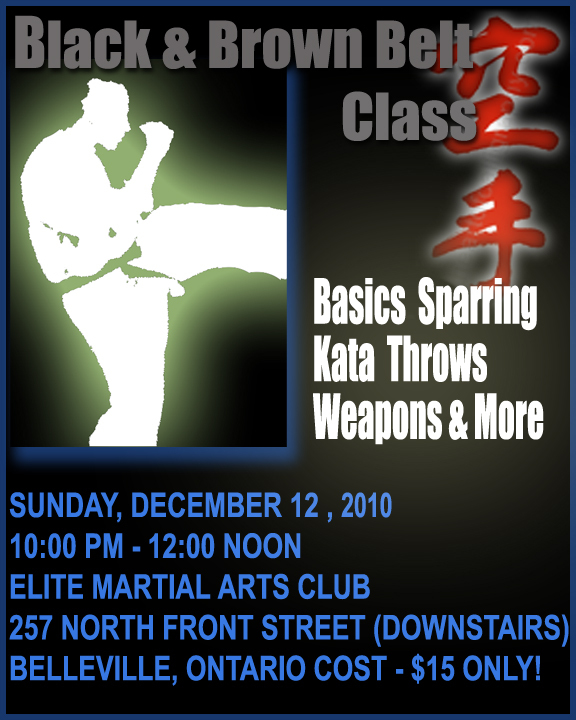 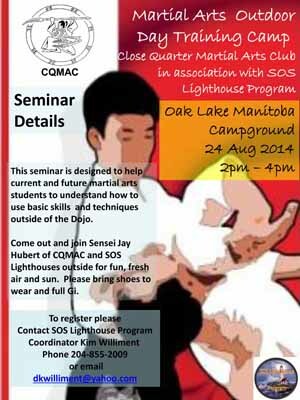 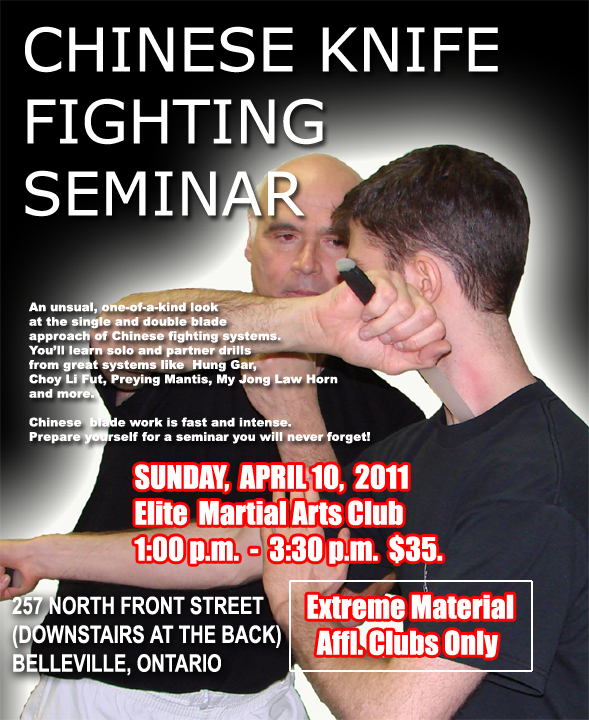 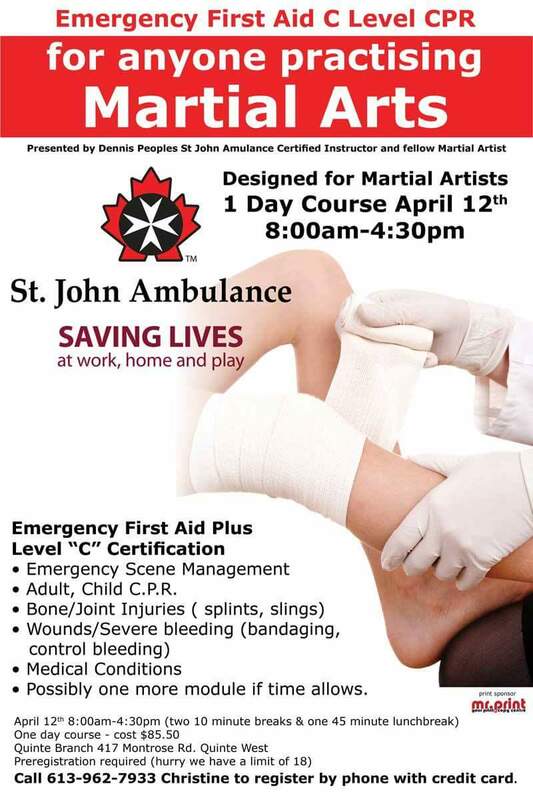 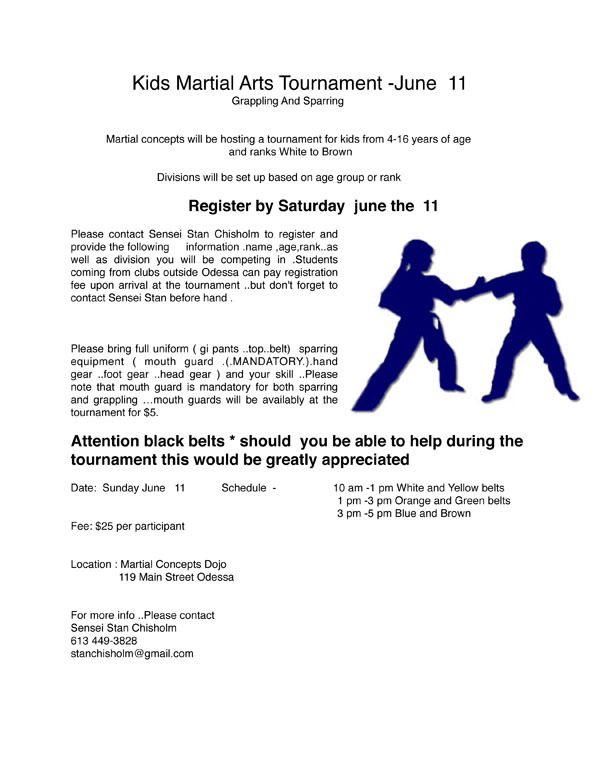 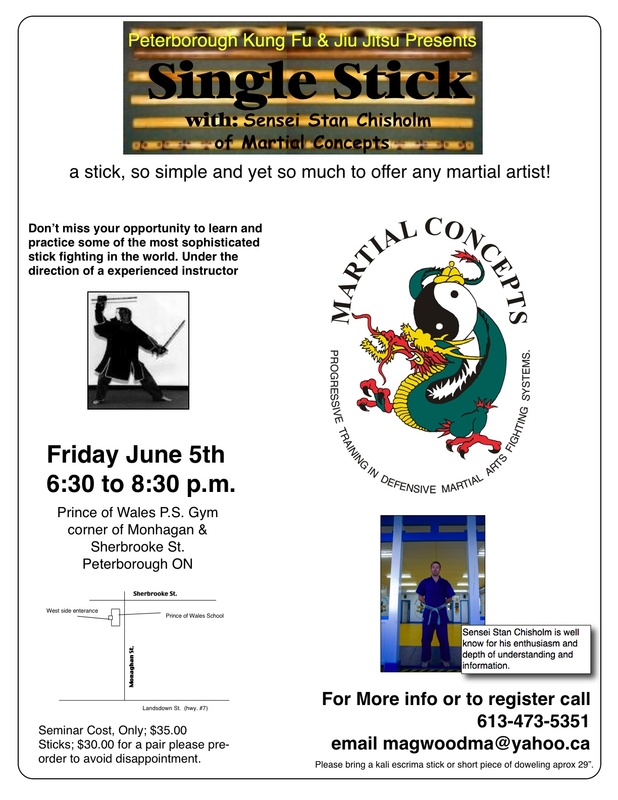 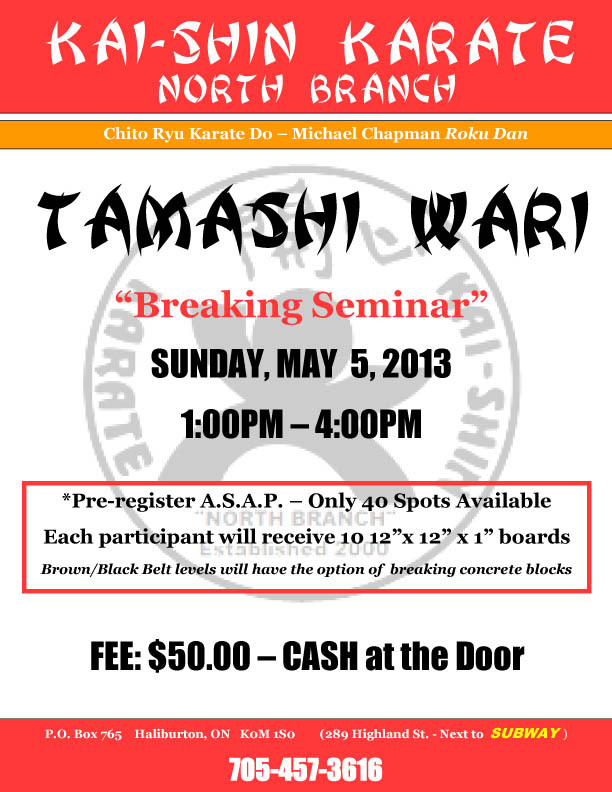 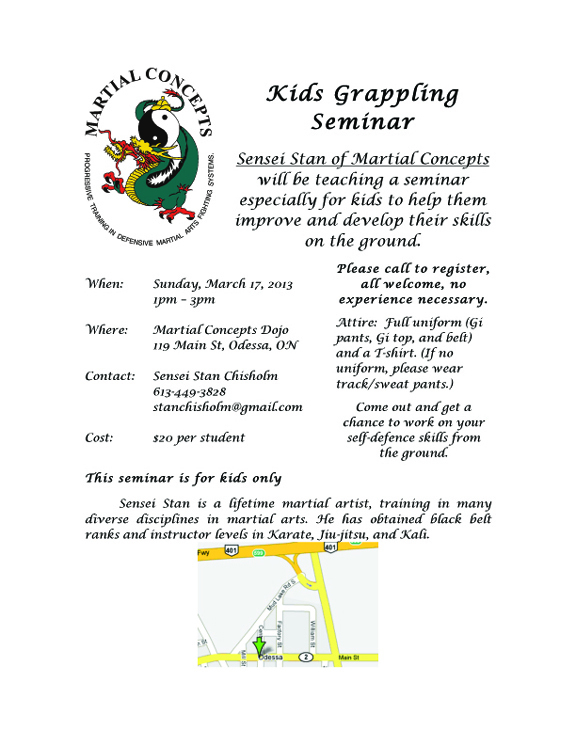 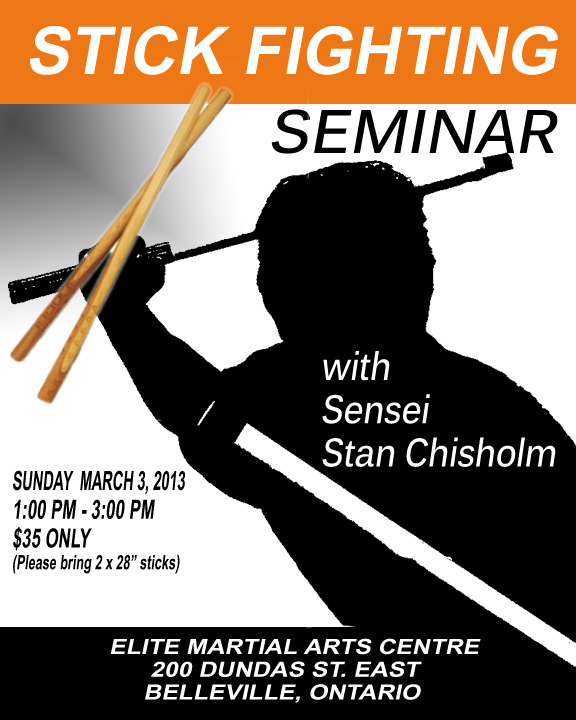 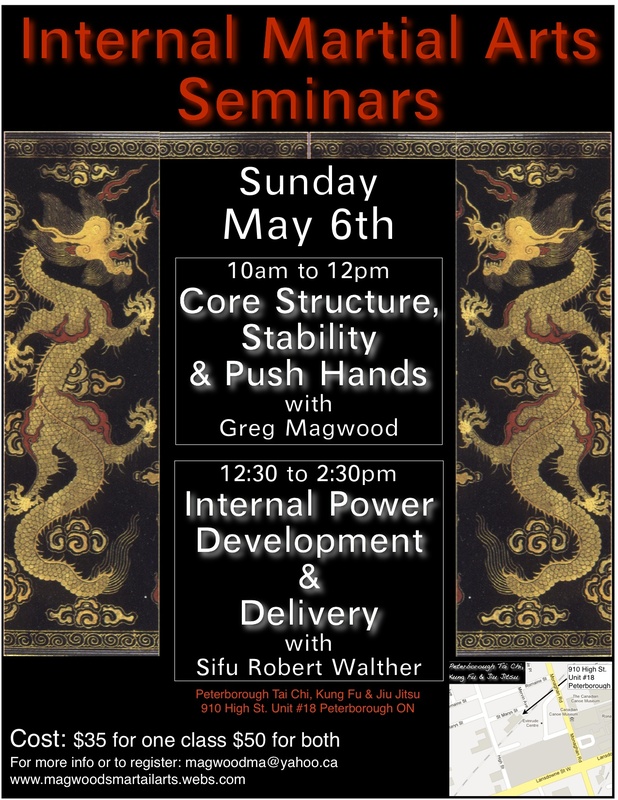 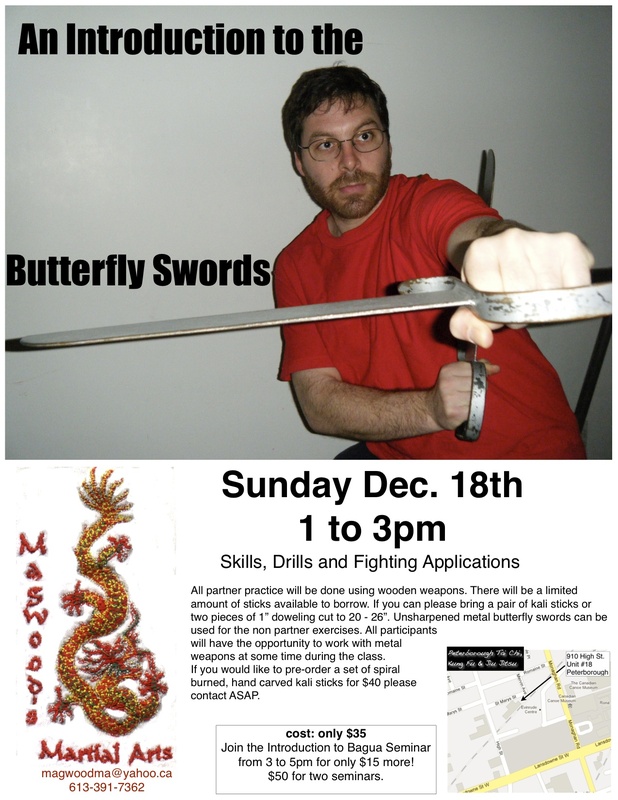 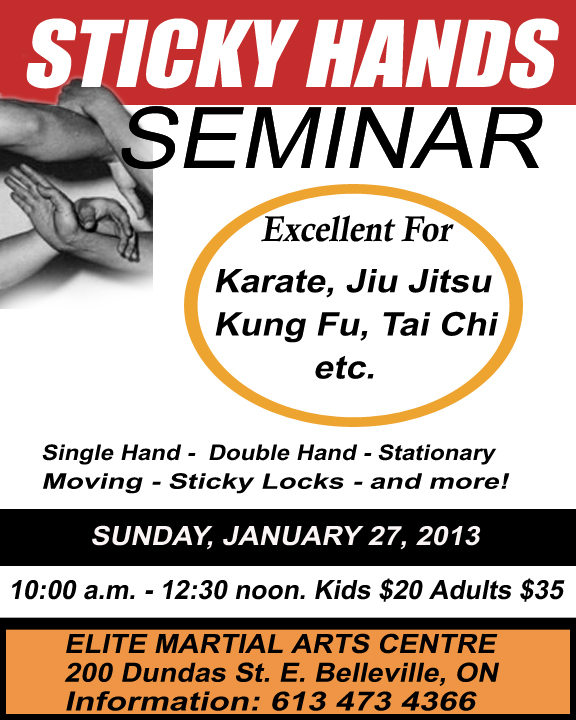 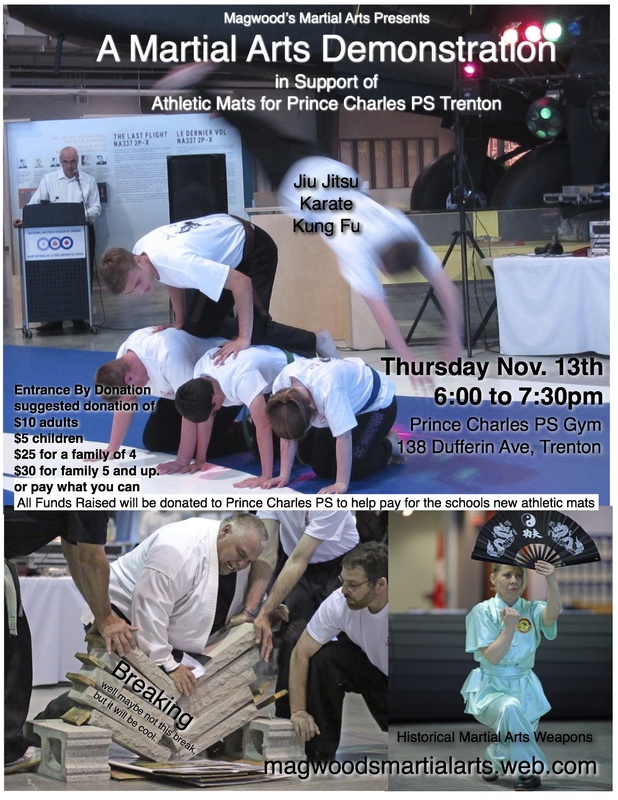 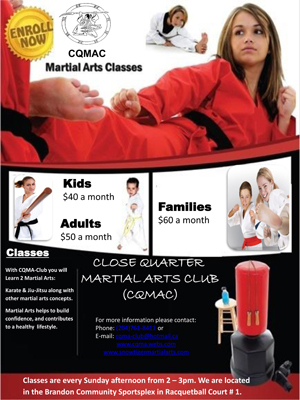 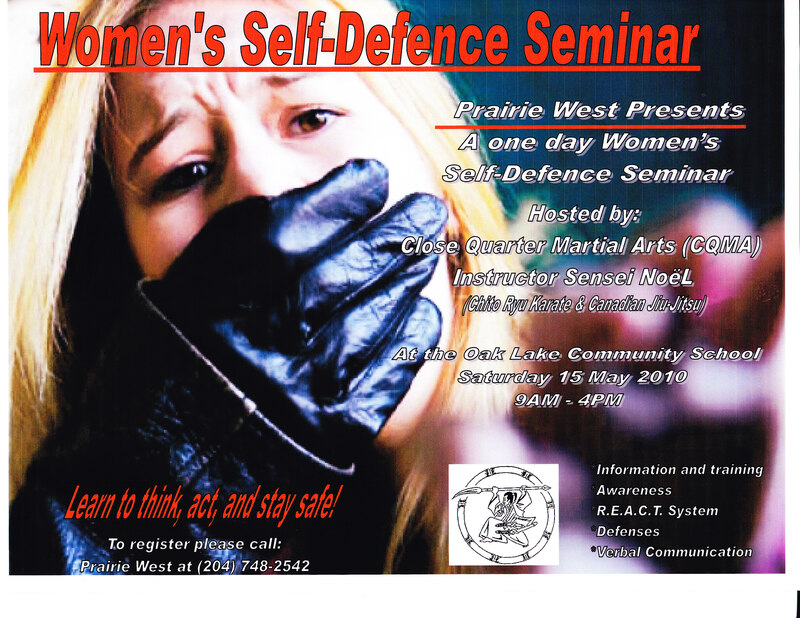 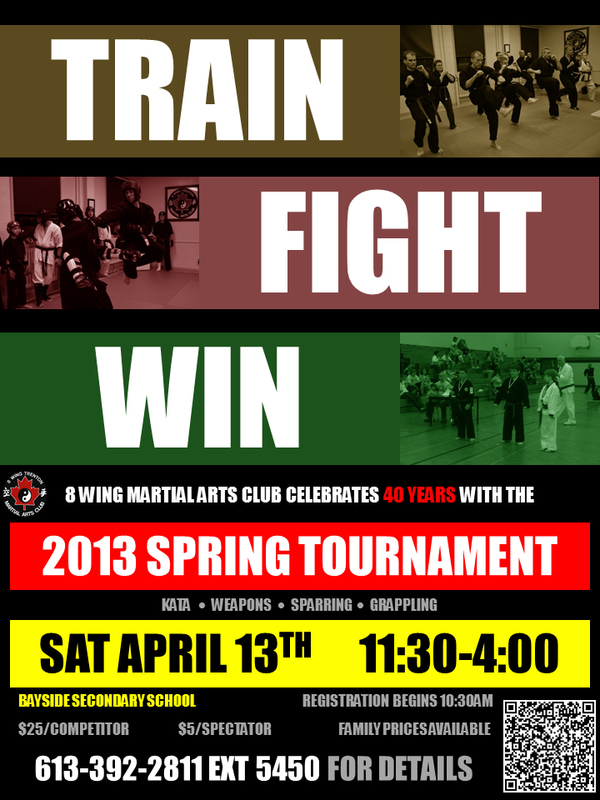 Open to all levels and martial arts styles. 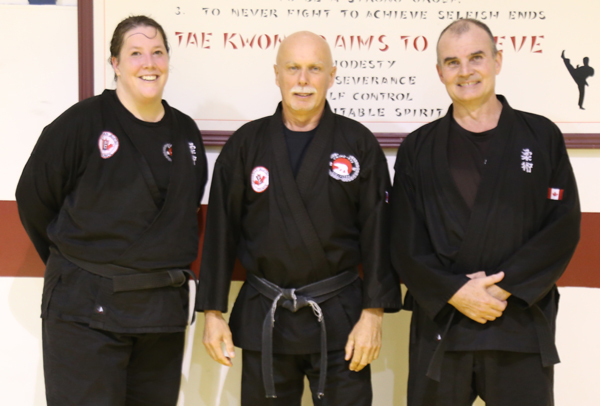 Three skilled teachers, Three excellent subjects and one beautiful location. 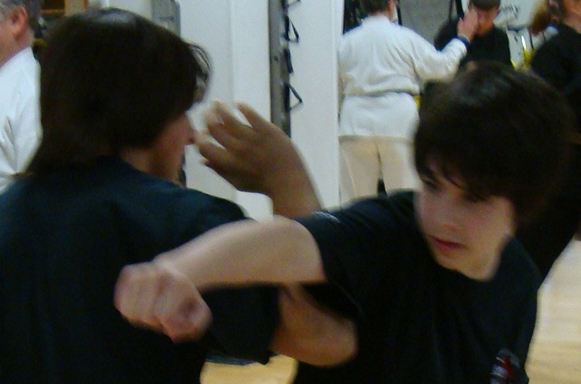 The martial arts benefit youngsters throughout the world, helping to develop discipline and respect while providing them with the tools and the energy to tackle the problems life will occasionally throw at them. 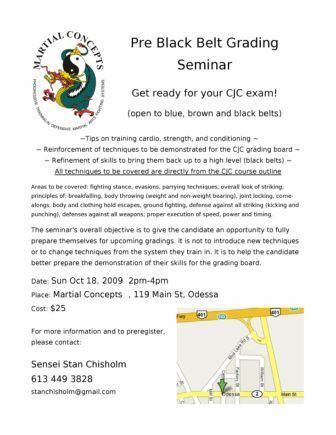 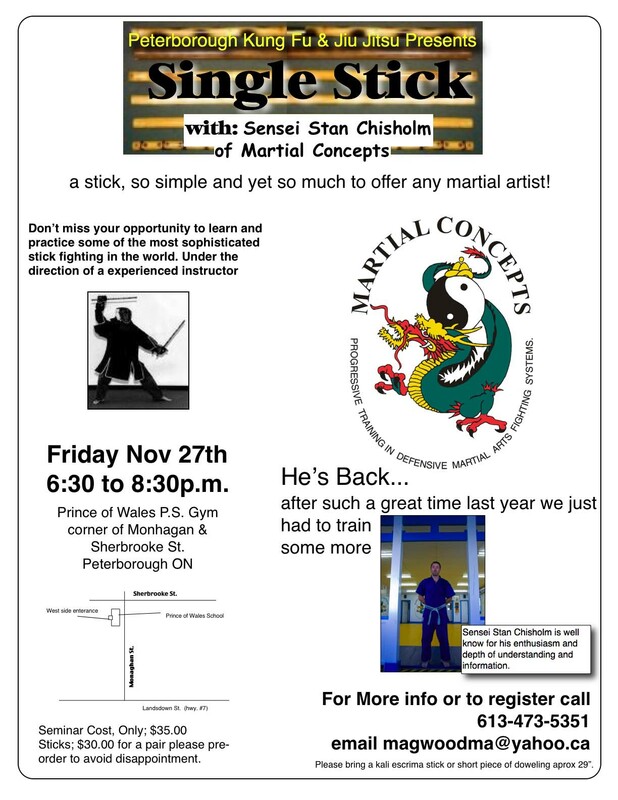 The following photos were sent by Sensei Noel Hubert of the Close Quarter Martial Arts Club located in Brandon, Manitoba, Canada. 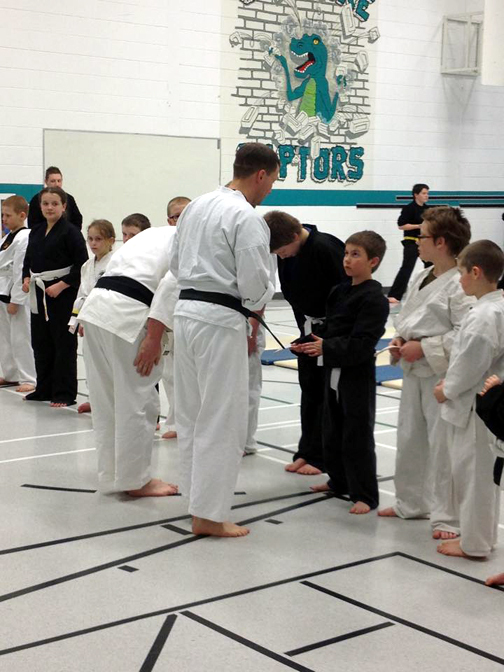 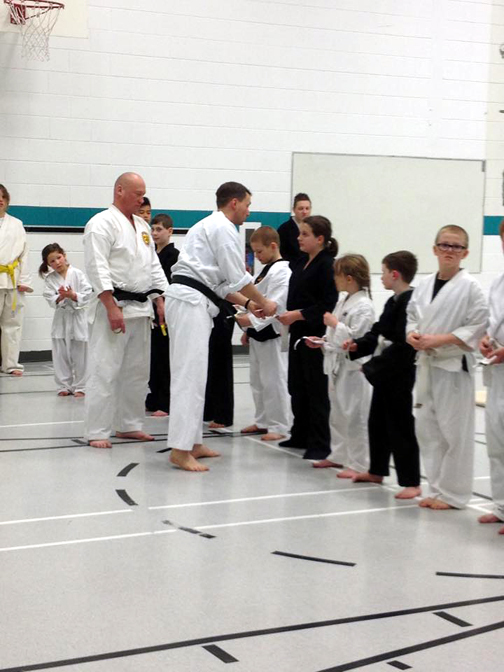 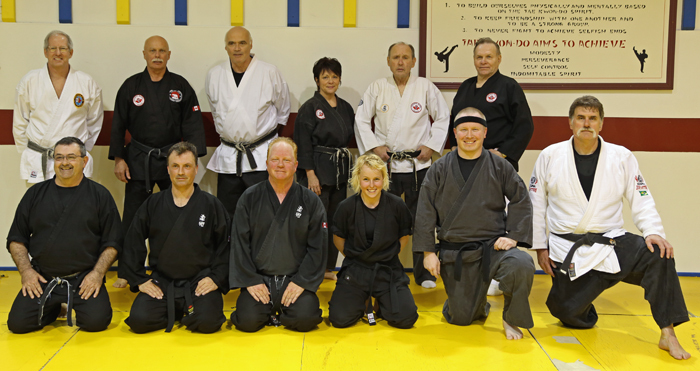 The photos are from a recent grading that was held at the Oak Lake Community School. 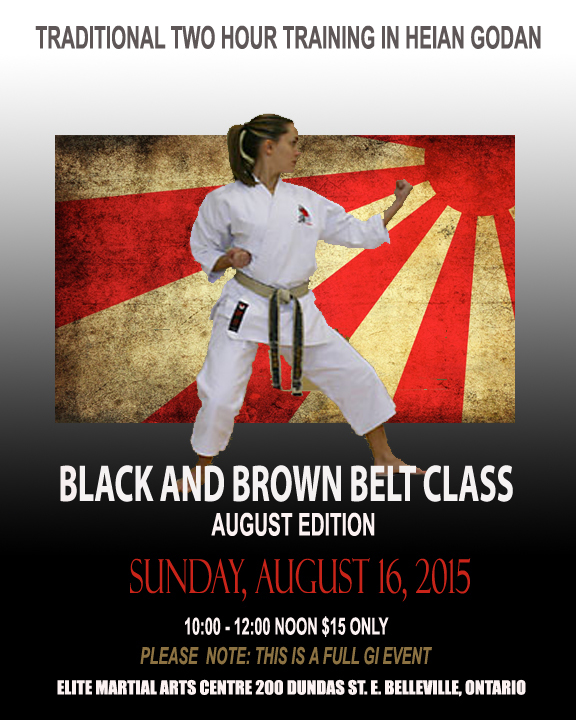 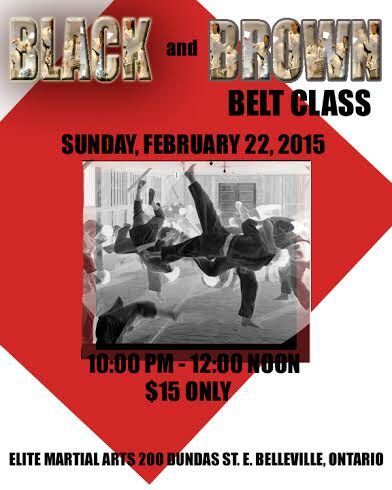 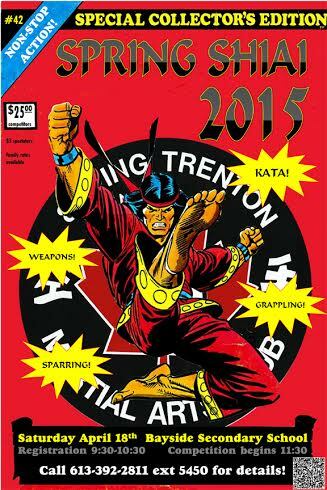 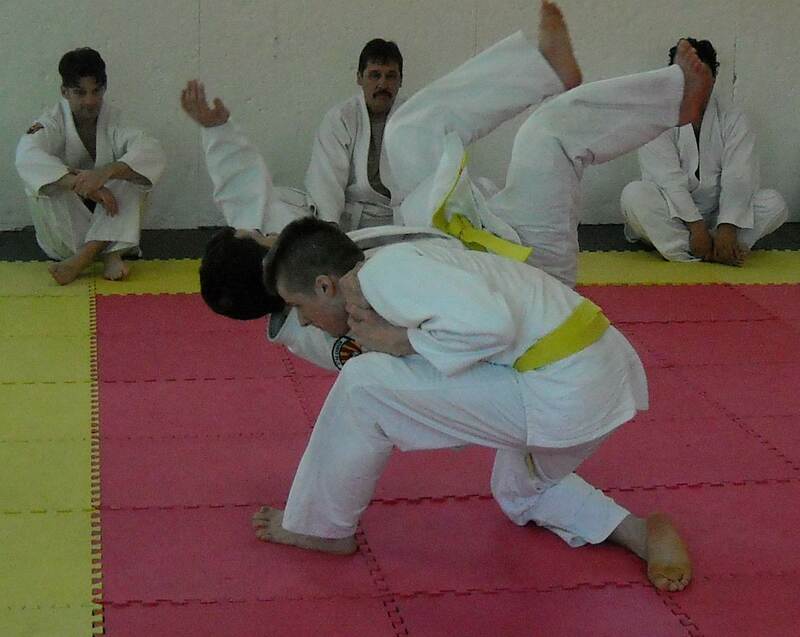 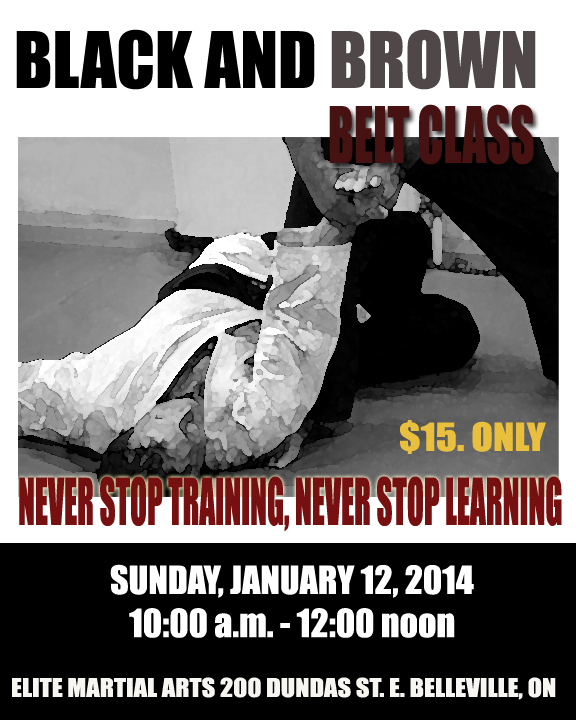 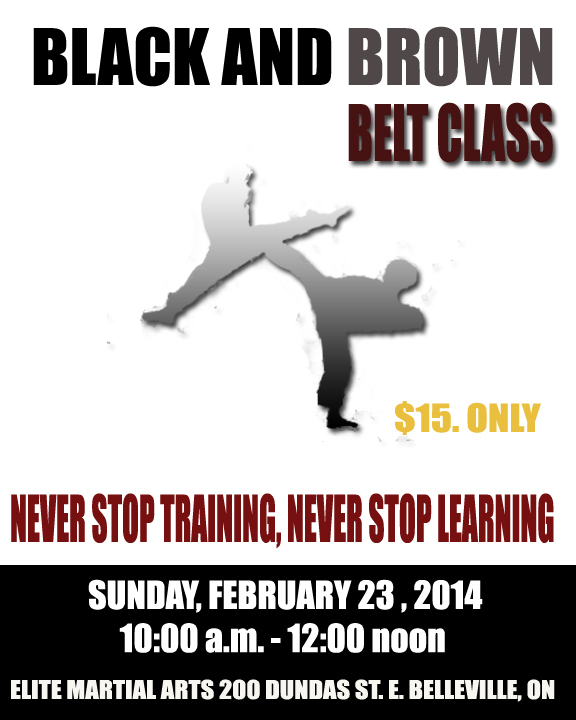 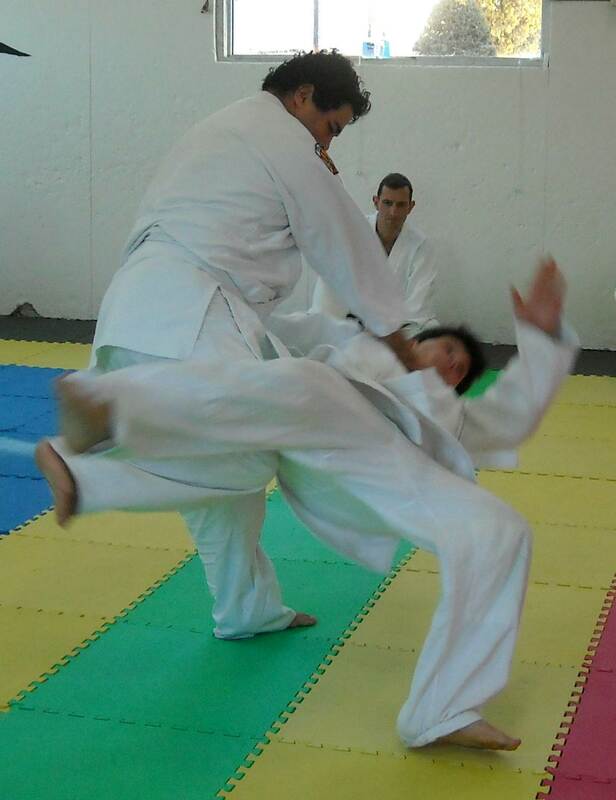 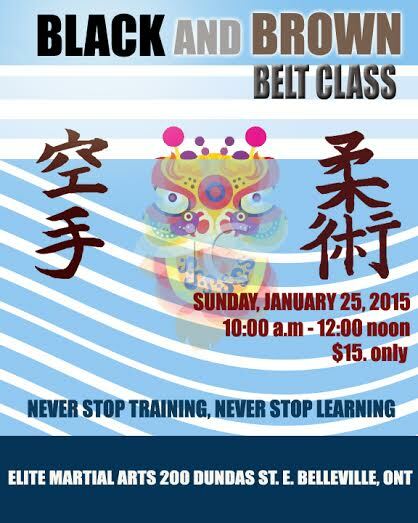 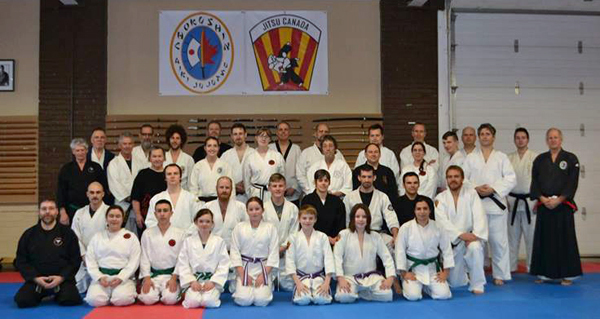 Next Black Belt Grading (Spring 2015) ... Get ready now!!! 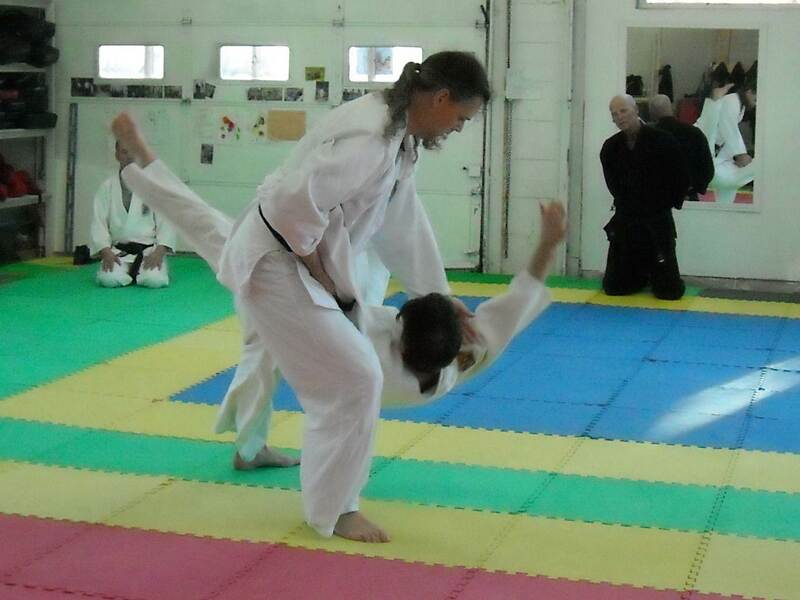 The daughter of Sensei Jan Kraayeveld continues to make a name for herself on the competitive martial arts scene. 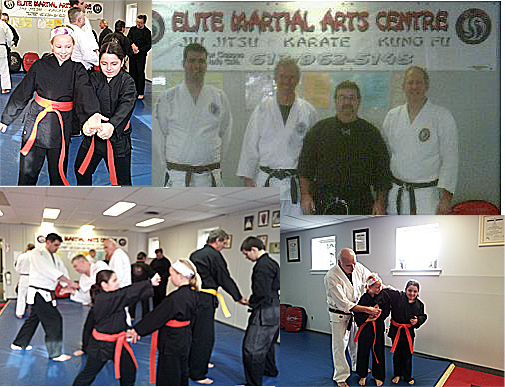 Ashley is an international inspiration to many martial arts practitioners, young and old. 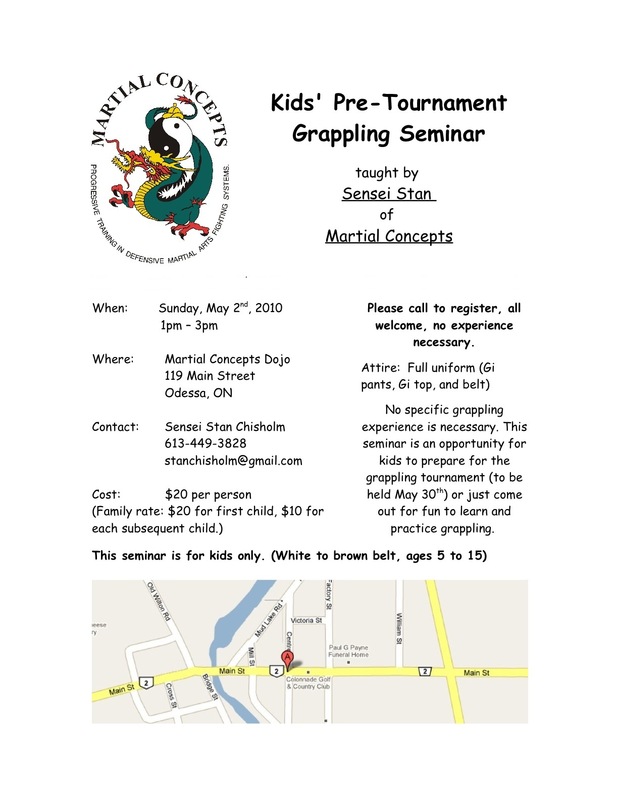 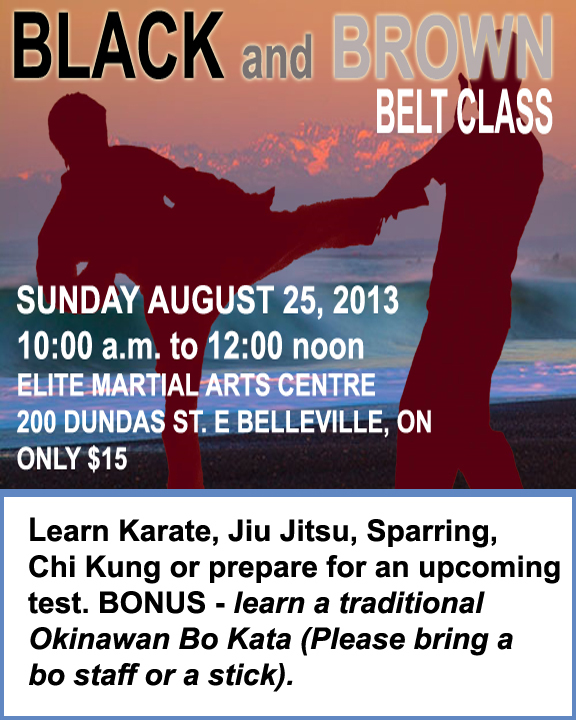 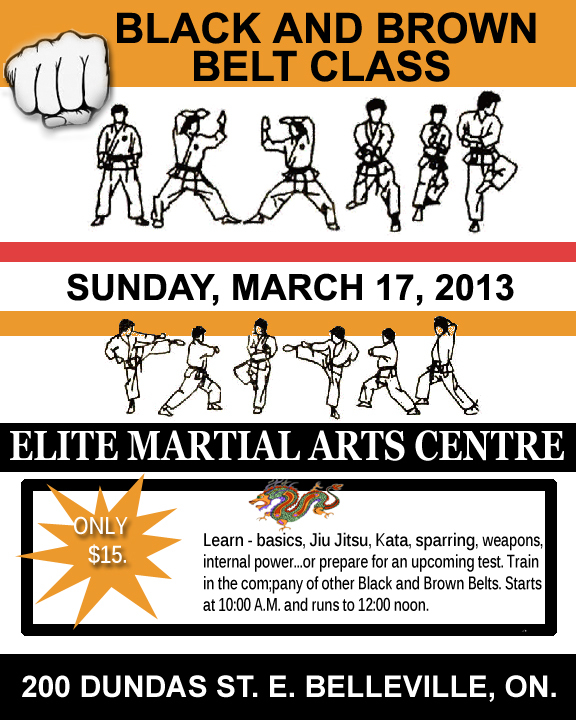 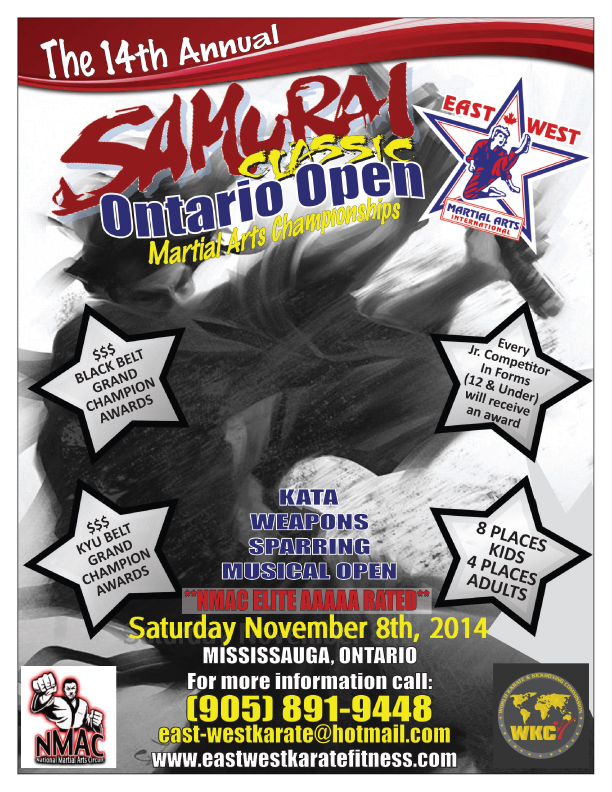 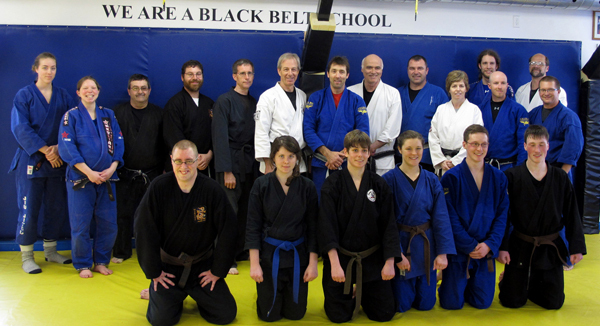 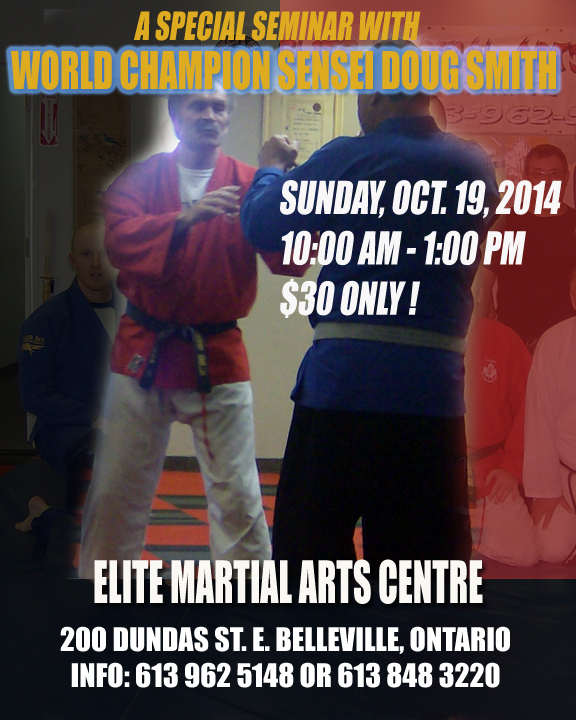 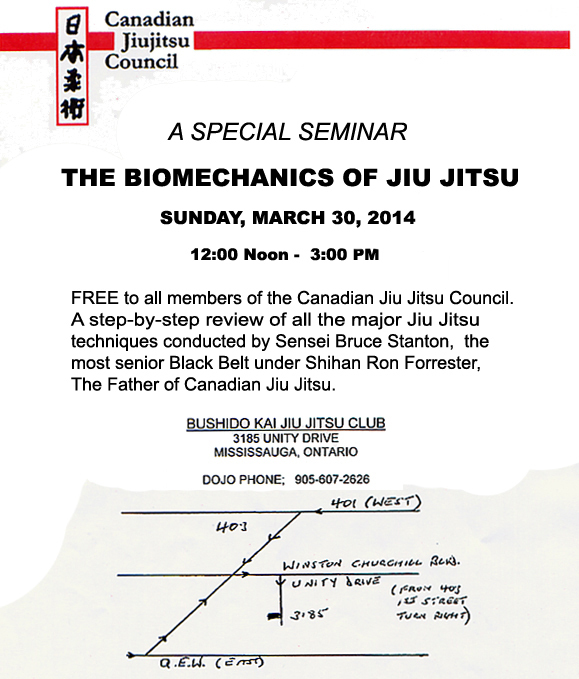 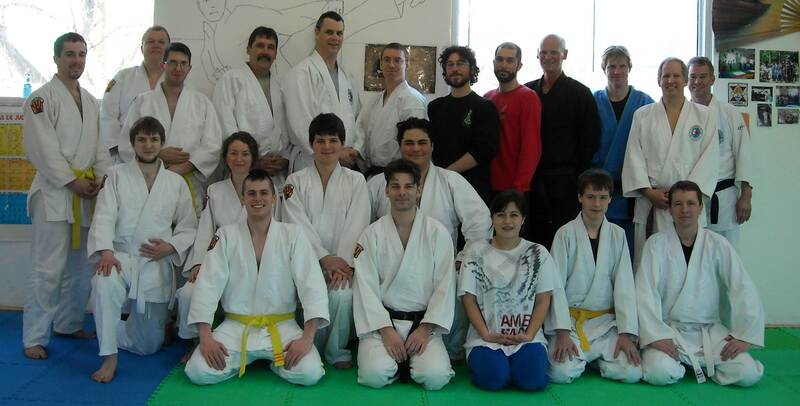 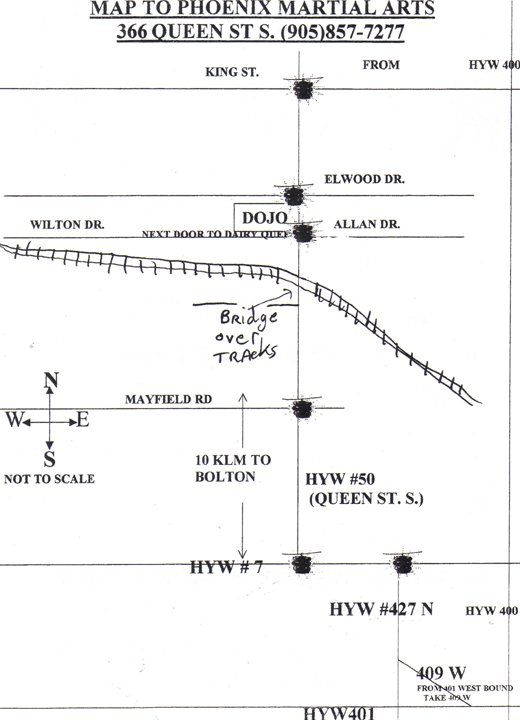 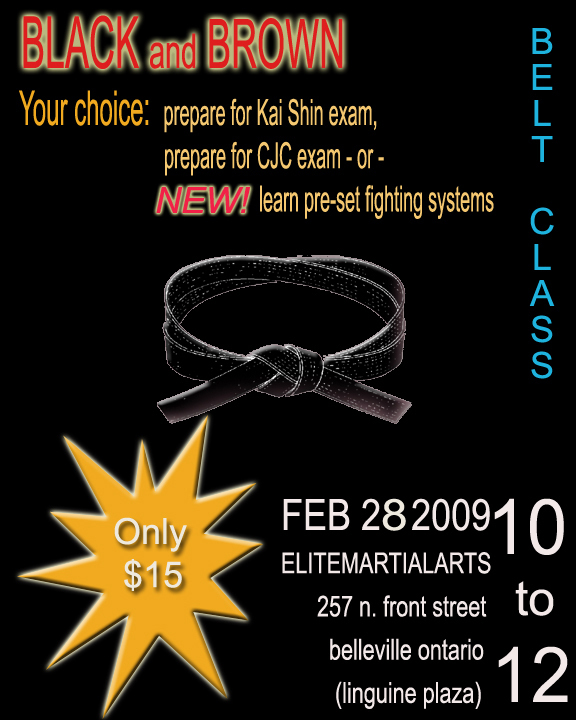 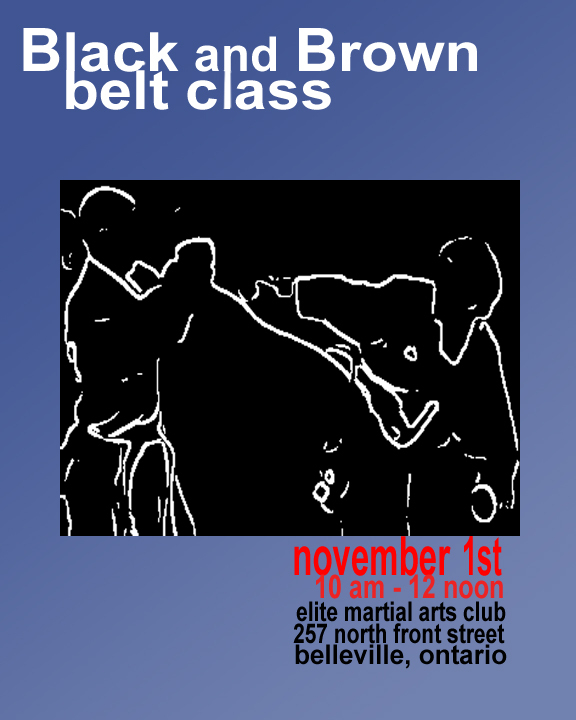 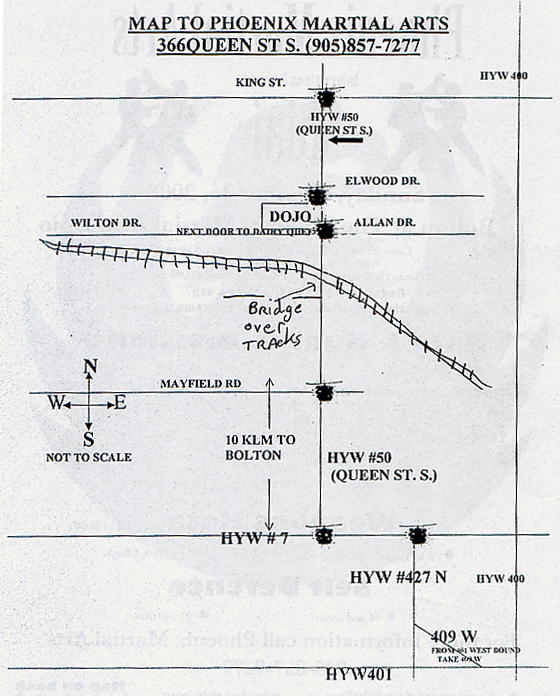 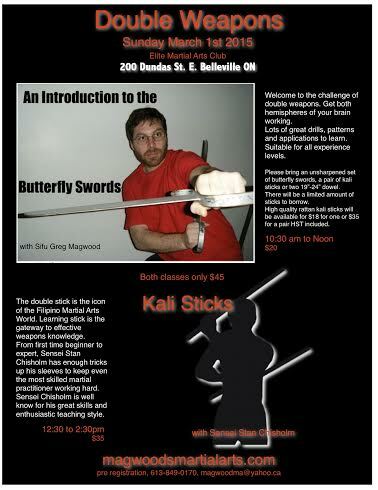 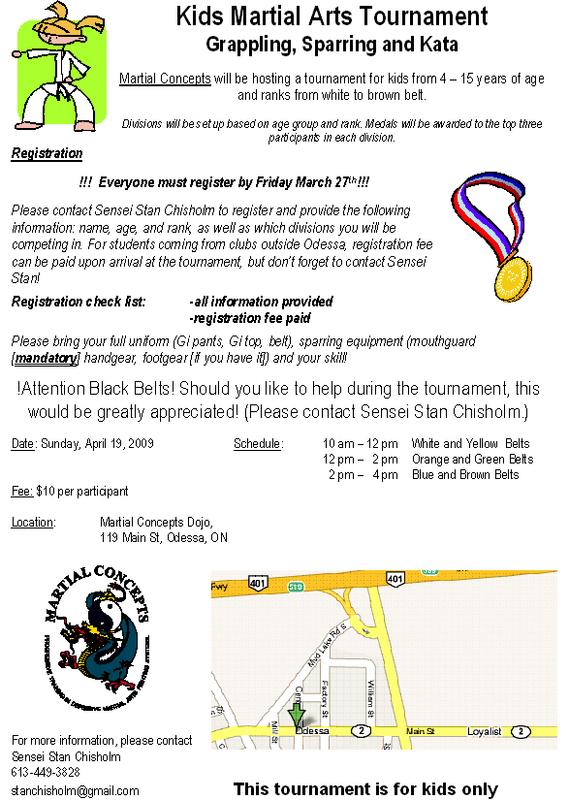 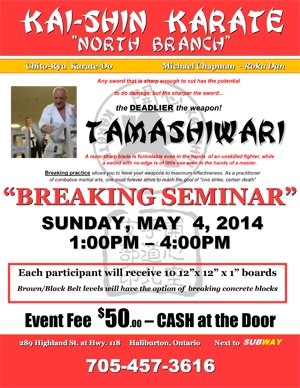 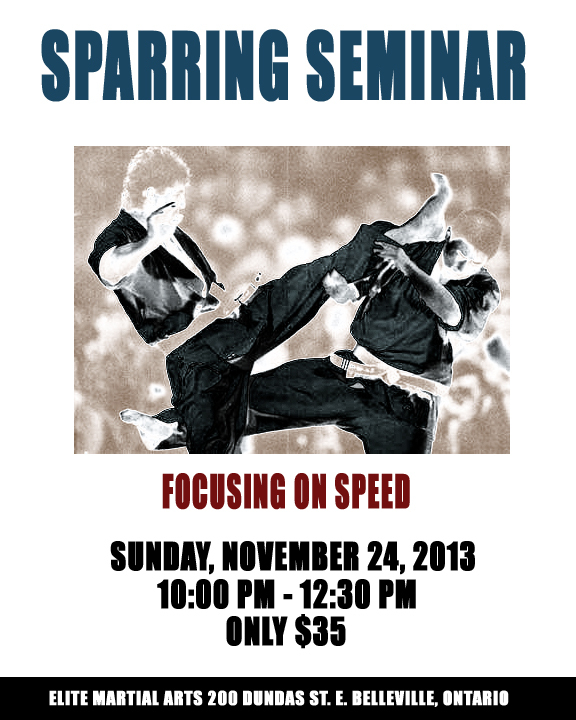 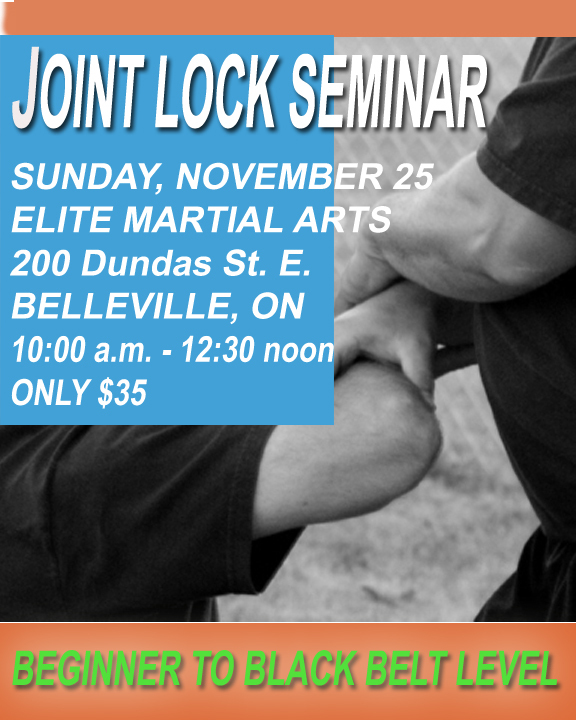 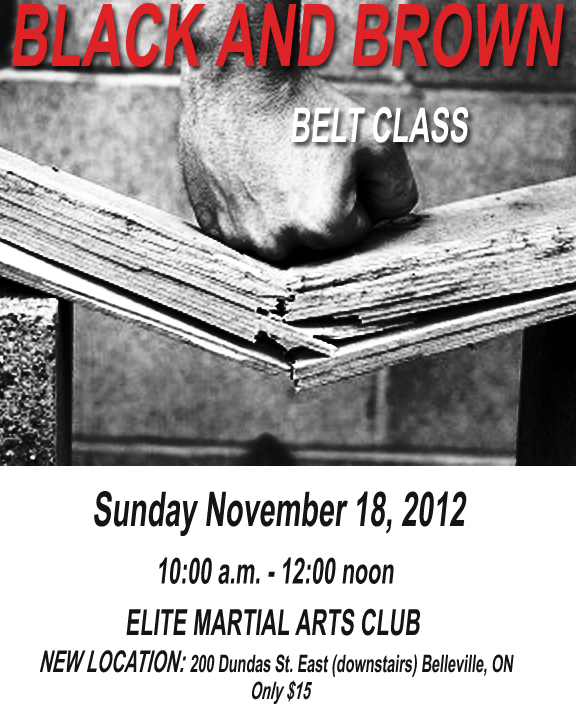 Belleville, ON November 24, 2013.
open to all belt levels from affiliated clubs. 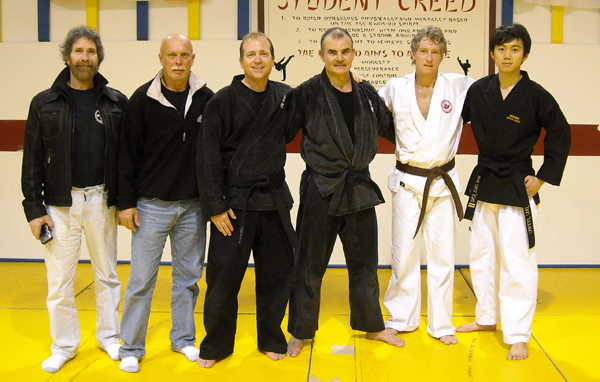 CJC Sensei Dan VanExan has just been awarded a rare combination of awards in his field - wildlife conservation. 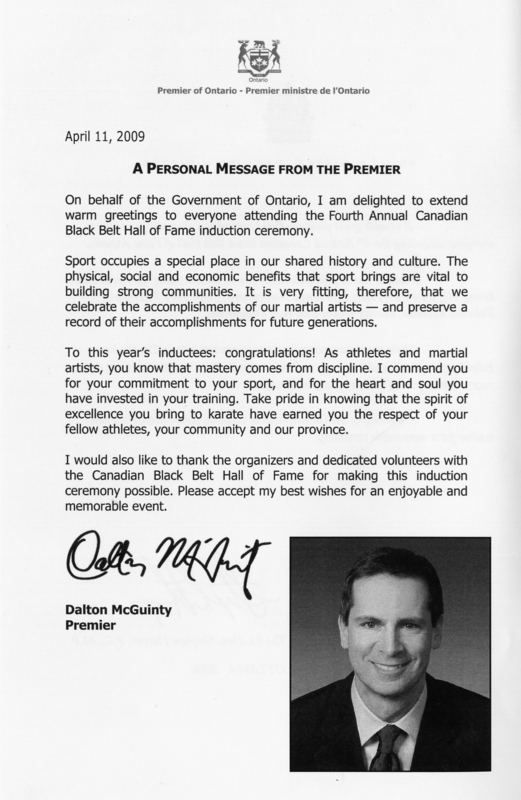 He received both the conservation officer of the year award from the Ontario Ministry of Natural Resources and a similar award from the conservation officers' union, plus two other awards. 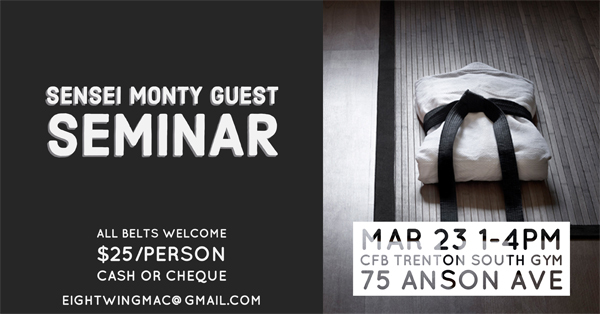 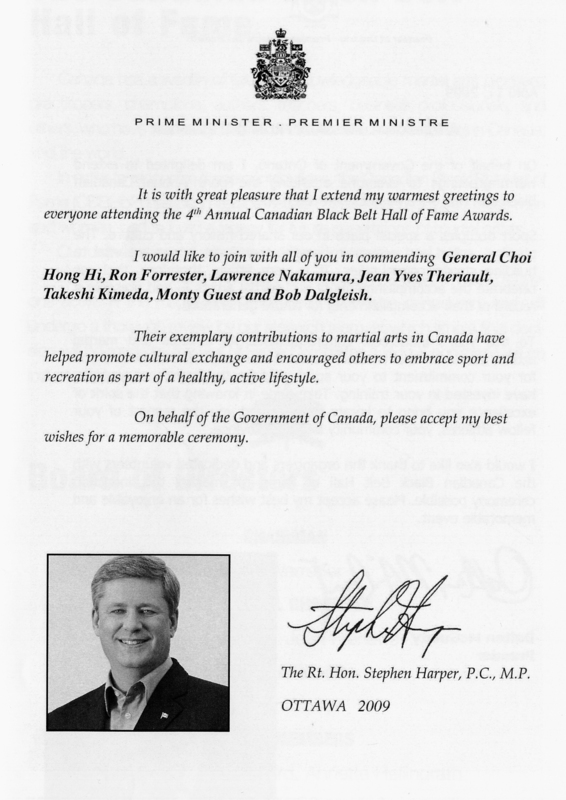 Note: A Special Guest Expected !!! 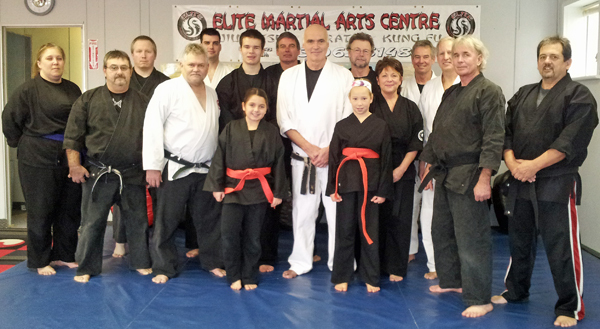 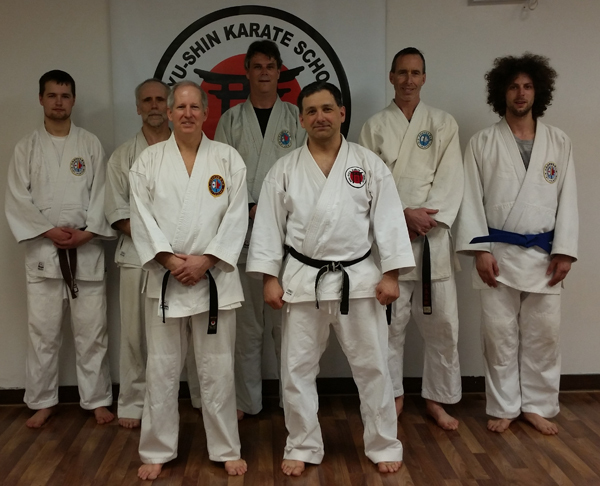 Congratulation Lynn Dafoe Sensei, Your new club location is excellent. 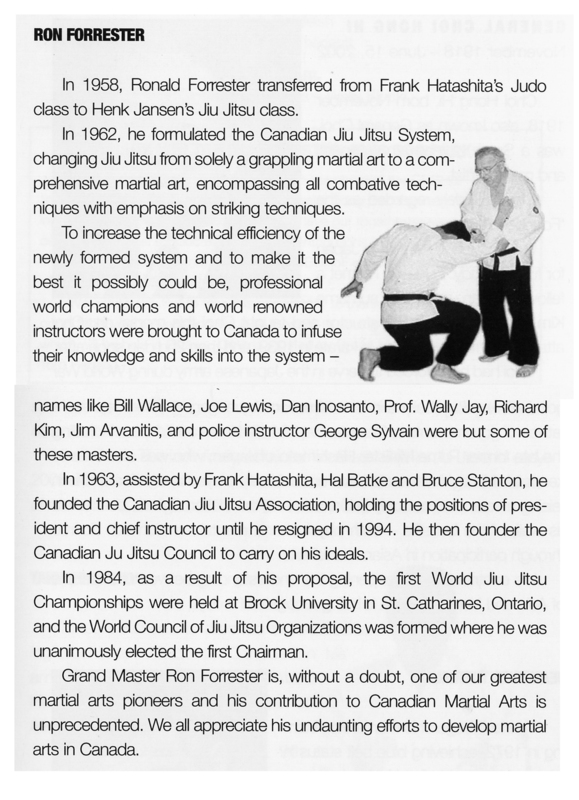 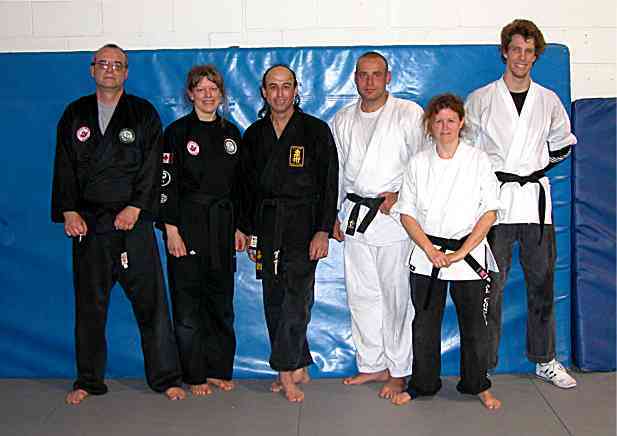 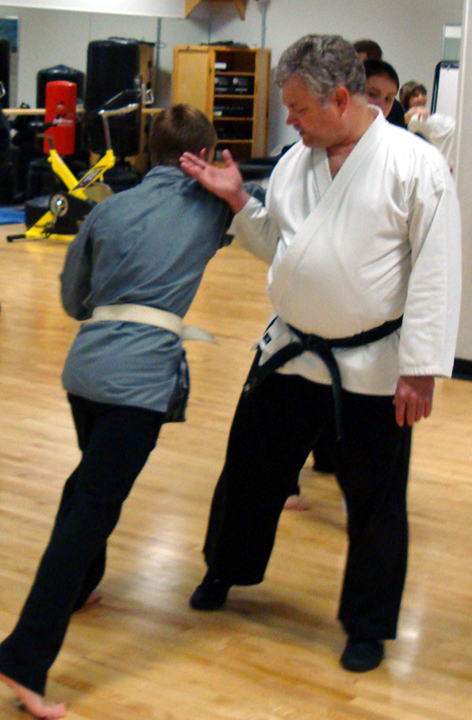 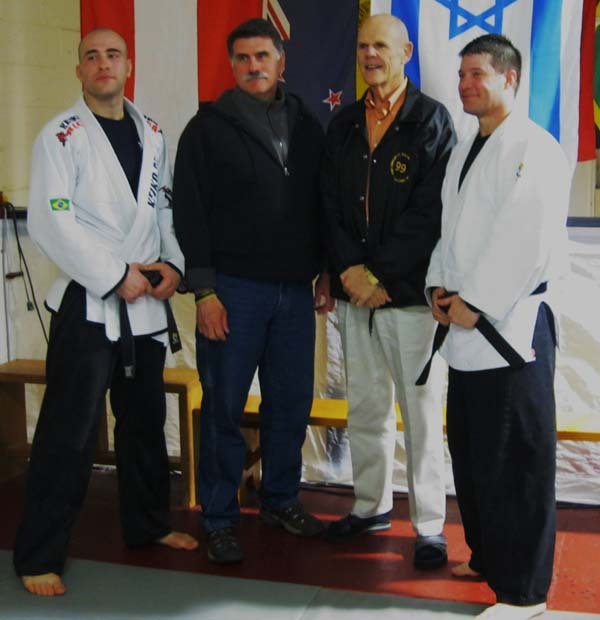 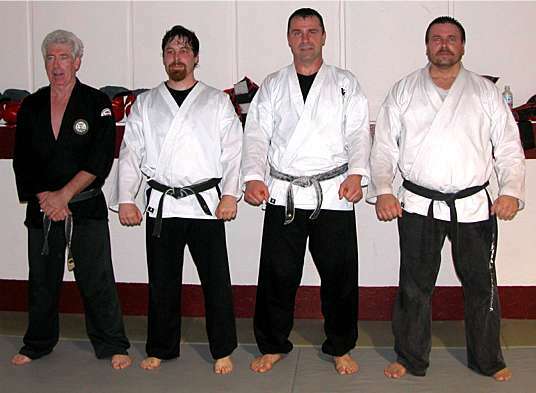 Sensei Viele has been in Jiu Jitsu for the past 47 years. 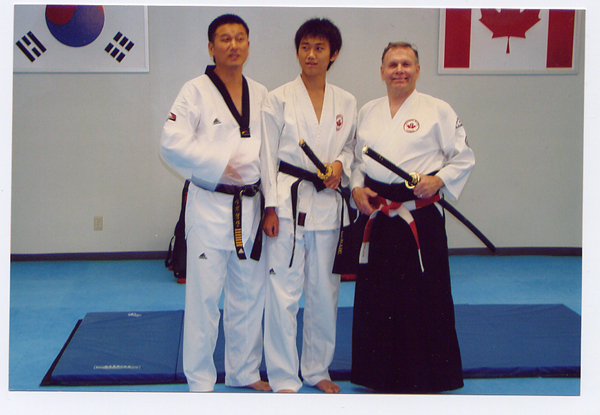 He started at Jeong's Family Taekwondo School 11 years ago and worked his way through the ranks to earn my 4th Degree Black Belt (Master) in November, 2010. 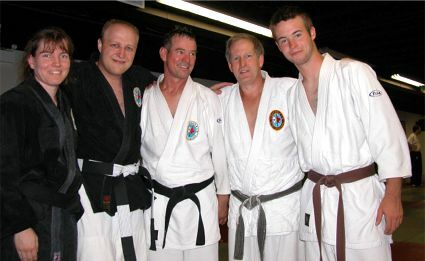 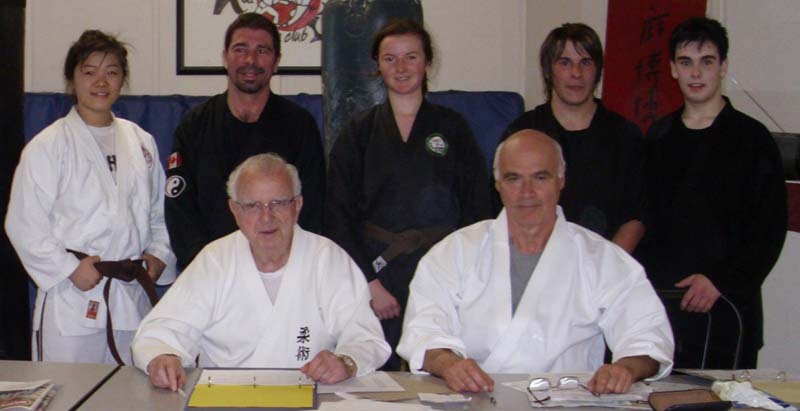 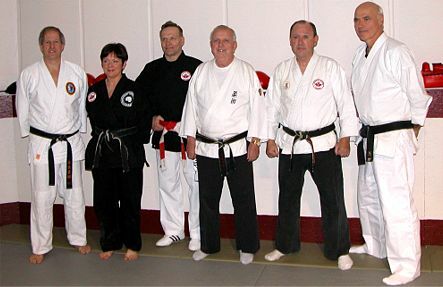 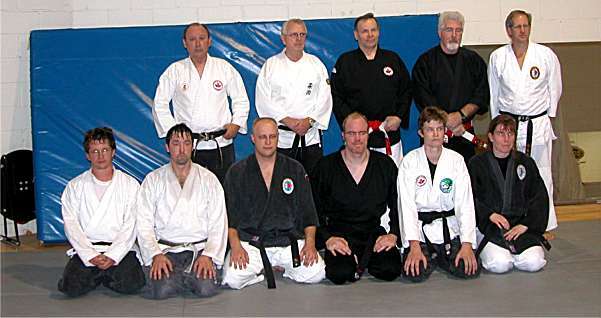 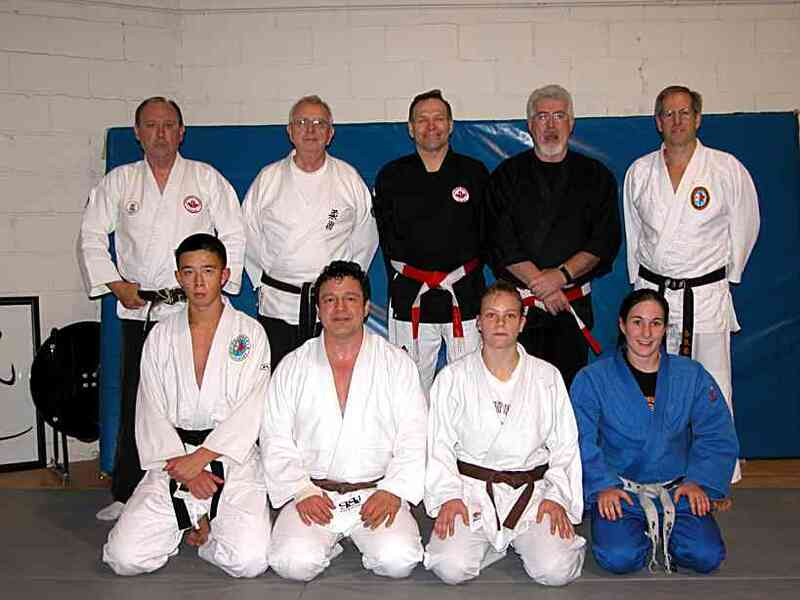 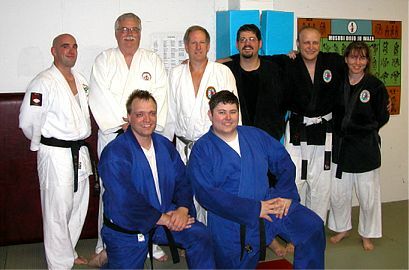 Grandmaster Chan Jung invited Sensei Viele as a guest to have a seat on the Taekwondo Black Belt Grading Board in July, 2011. 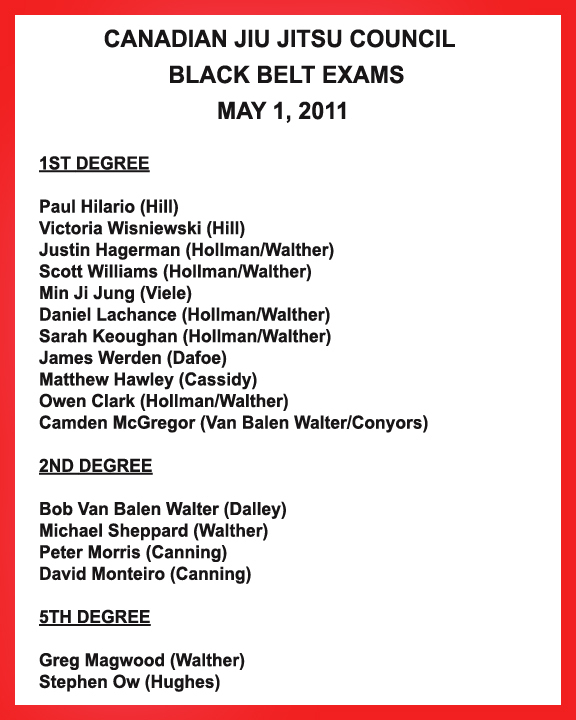 By Vincent J. Viele Instructor in Jiu Jitsu. 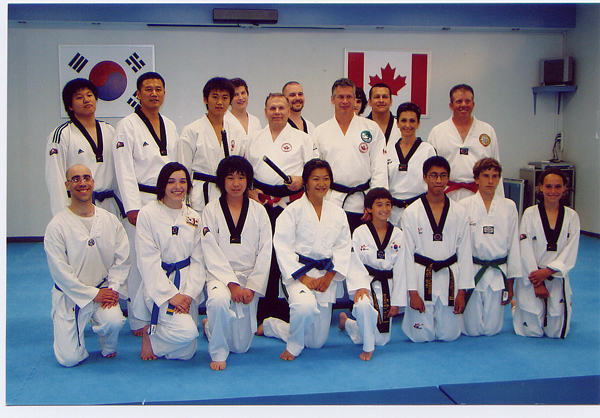 Jeong's Family Taekwondo School. 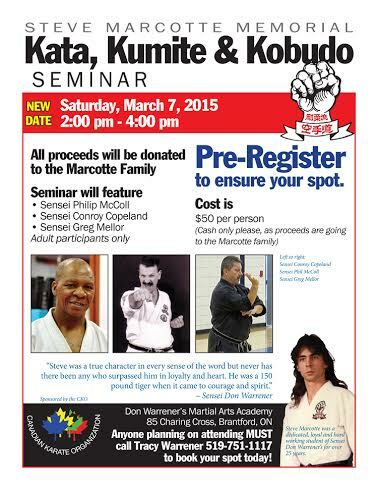 St. Catharines, On. 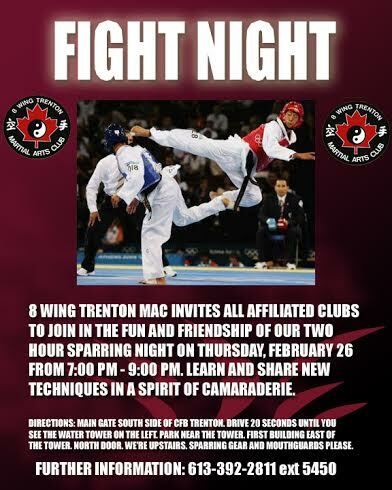 8 Wing Trenton, ON, May 7, 2009.
taught a seminar on Bio-mechanical principles this week, on Tuesday, March 3rd, at the Chimo Ryu Jiu Jitsu Club at the Oakville Y. 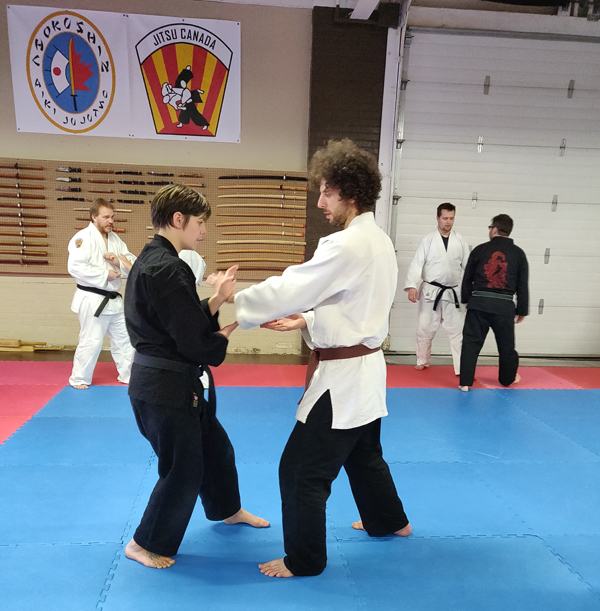 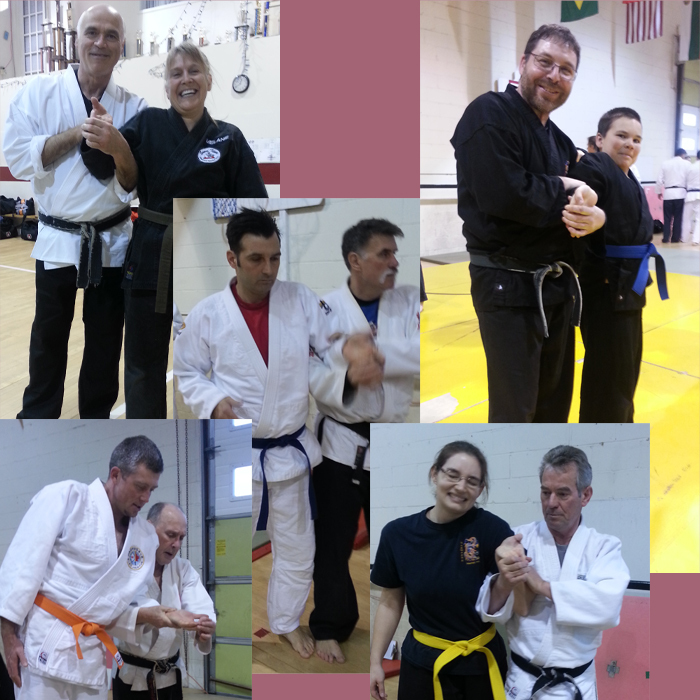 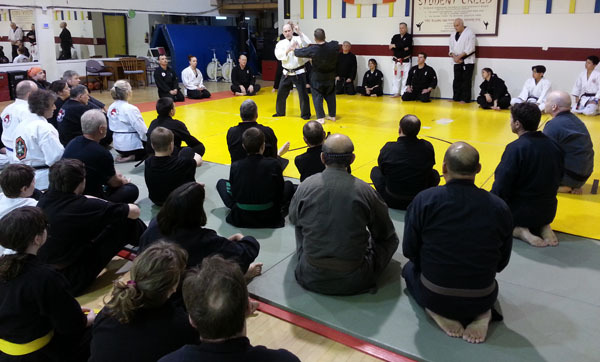 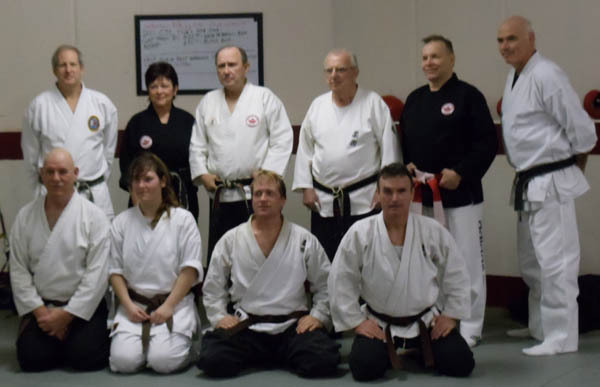 The seminar was attended to by quite a range of different levels of students, and Sensei Paul reviewed Bio-mechanical principles, and taught various exercises for the class to try, in order to put the principles into action. 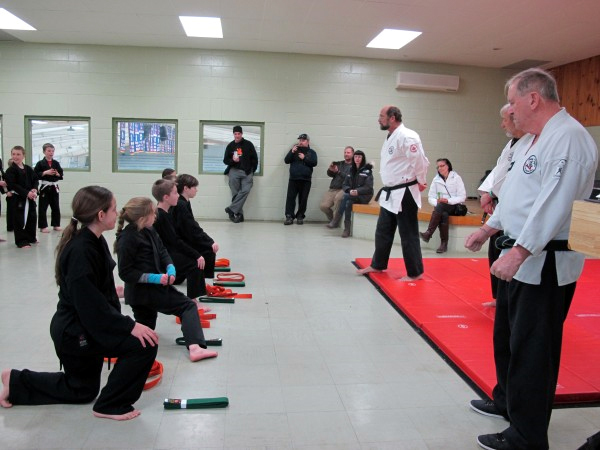 It was a first-rate educational experience for everyone in attendance and an excellent time was had by all. 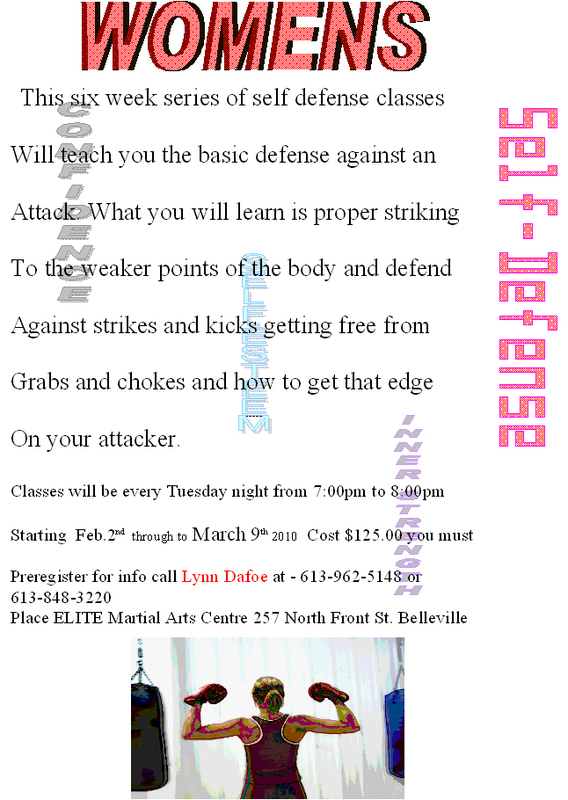 photos and text are by Lorie Gold. 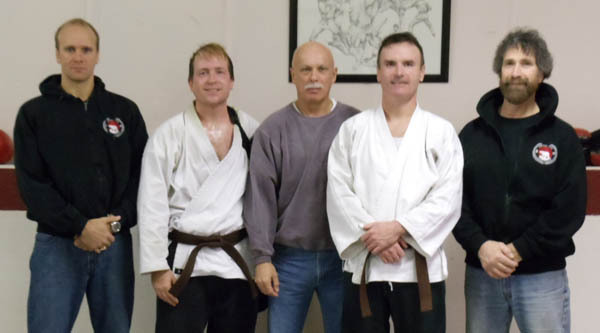 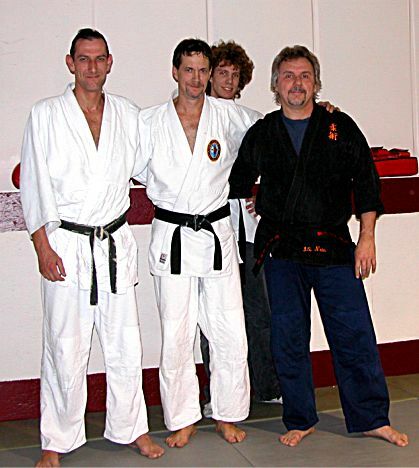 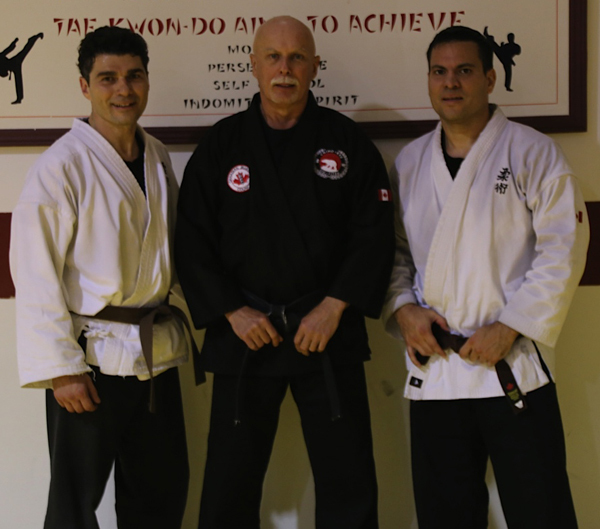 Sensei Angelo Egizzi and Sensei Gino Egizzi. 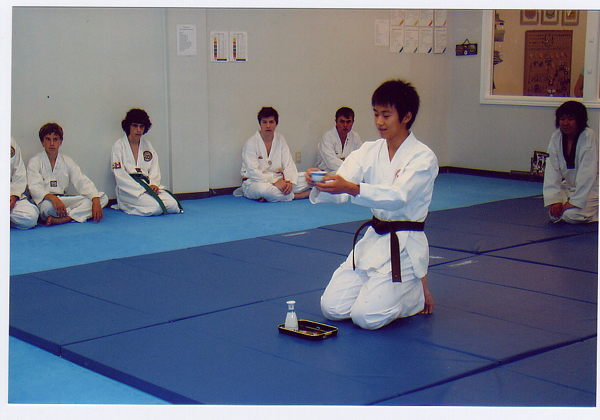 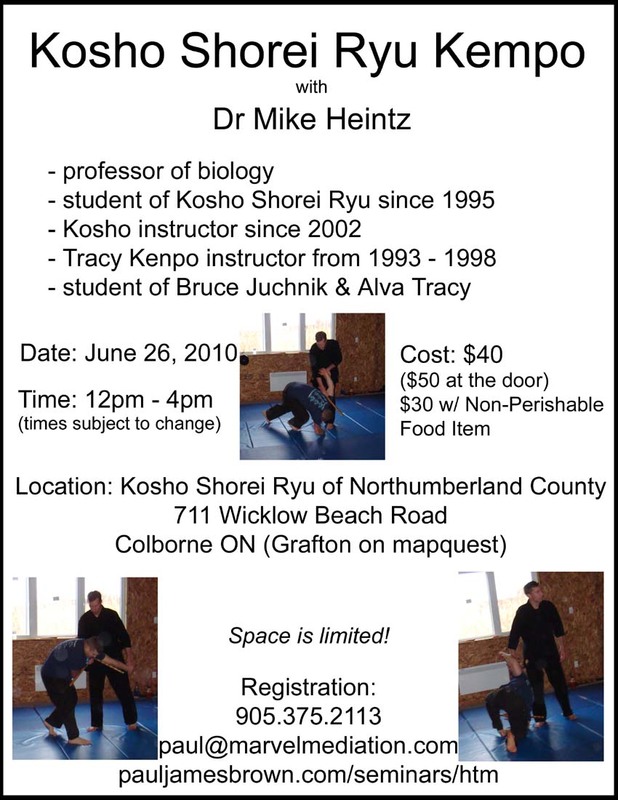 Sensei Paul Brown (CJC), acted as uke for aikido Sensei Kono during a seminar by Kono on June 26, 2008. 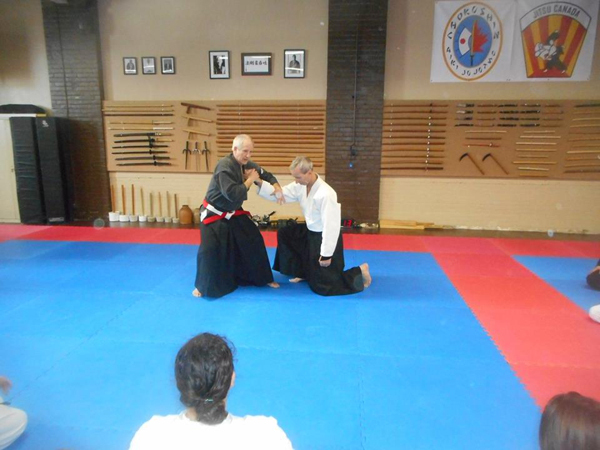 Kono is one of the last surviving students of Morihei Ueshiba, the founder of Aikido.